Finally the wait is over, and I have realised the cylinder jig. This is the first attempt, at making a multi purpose jig that can hold the cylinder in three positions, one for the exhaust valve rework, and another for the inlet valve, with the middle position being the overbore and combustion chamber rework for the larger capacity engine. It was fitted to the larger CNC mill today for a test fit, and make sure the extended tooling didn’t catch the walls of the standard cylinder. To machine the valve seats I need a special carbide tipped tool about 30mm or so diameter, so that the tool spindle doesn’t catch the sides. 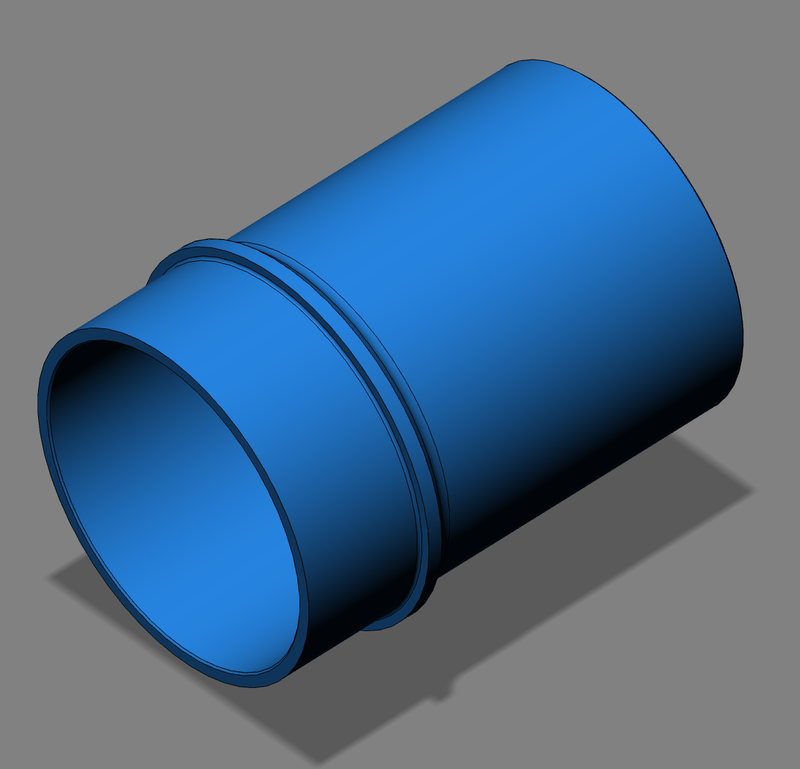 New redesigned cylinder liners with revised tolerances. 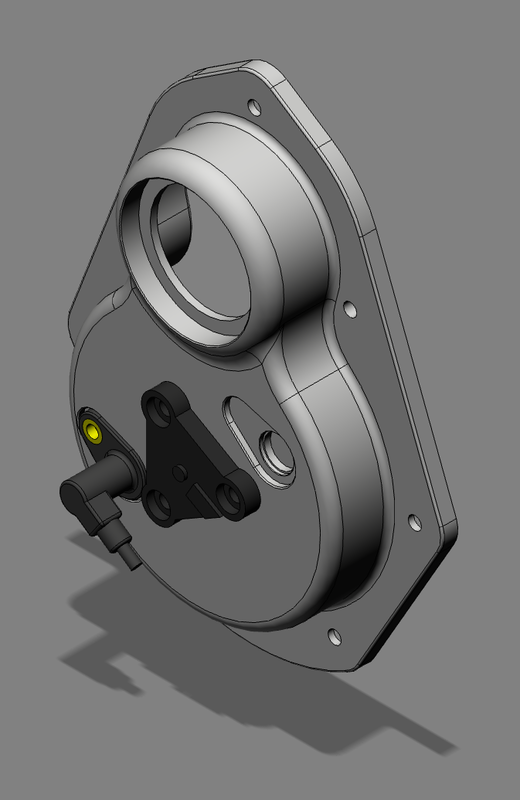 CNC alloy front timing cover incorporating ignition sensors. So hopefully in a few days, it’ll be Almen here we come. So I got the modded cover back tonight, and after testing the clearances at the oil light switch and the sensor to fan, I realised that the first batch need another tweak, but that’ll have to do for the next batch. 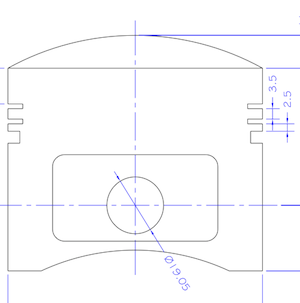 I have simplified the sensor through hole (pictured above), and recessed the sensor by another millimetre for this batch. The oil light internal depth is as far machined as I can go, and ideally needed another millimetre here, so I modded my oil light piston, essentially just making it shorter. Nothing is bolted down in the pictures, as I am just testing the fit, although I did use a multimeter to confirm the action of the oil light switch contacts. Tomorrow, I’ll do a final test fit for the sensor body into the recessed area, and that’ll be that for this batch. In the future I will tweak the design slightly, but that’ll be just for the oil light operation. Last night I was sitting pretty, so to speak, but this morning I decided to fit the wooden blocks and springs to mount the front fan assembly and check the clearance on Brian’s engine. 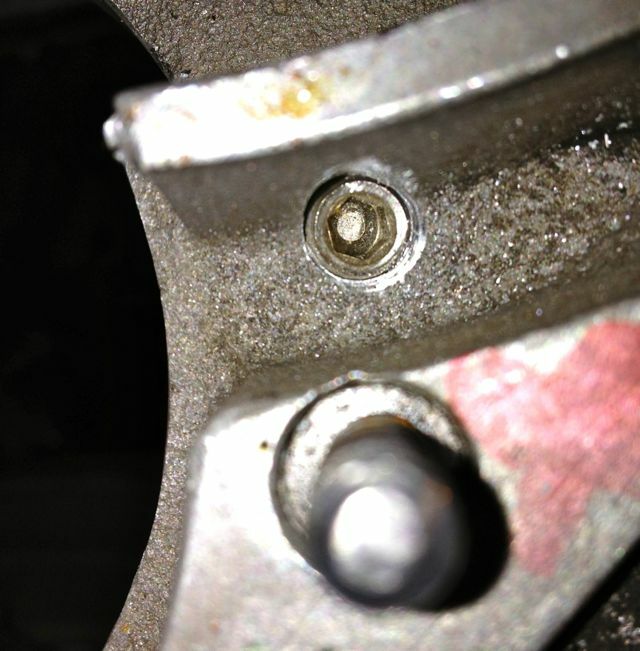 After torquing up the pulley centre bolt, I noticed a few millimetres of clearances, but on rotating the turbine or fan, it scraped the top of the sensor. I have never seen a misshaped turbine before, so I tried several different ones I had lying around, and surprisingly they were all misshaped, with the resultant wobbling just catching the top of the sensor at some point, so obviously more clearance was needed. I had two options change the sensor, or recess the sensor some more, and as all my work on the sensor was completed and it is a cost effective (aka cheap) solution with excellent sensitivity, I was reluctant to change the former. This meant recessing the sensor into the timing cover. As I looked at this, I thought I’d check the oil light function, and this too was just too tight a fit, such that the oil light would never illuminate, which isn’t a bad thing, but it isn’t how I intended things to operate. 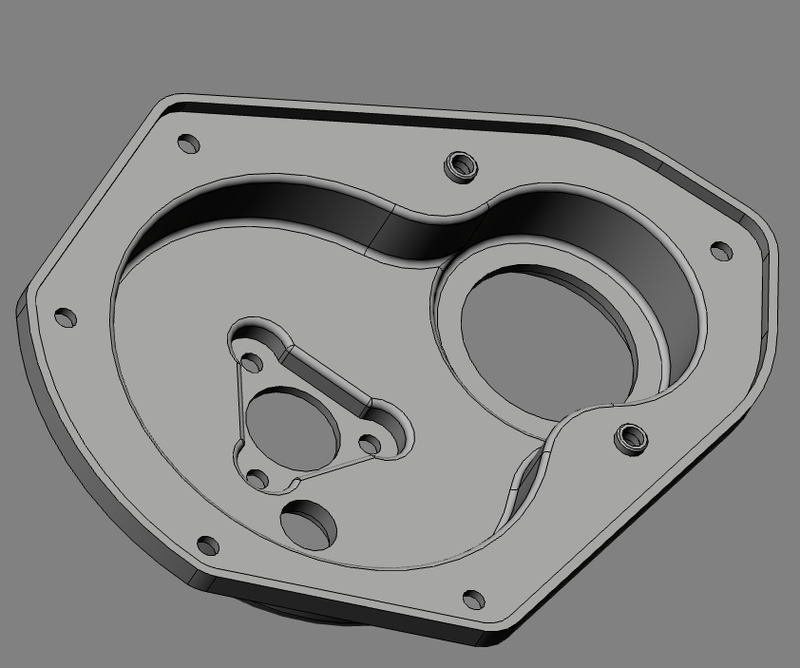 So a quick 3D tweak was in order, and this has been passed onto the 3D CNC fabricator. Slightly annoying for him, but better for us all. Oil light switch surface has been reduced in thickness (blue area) in the picture below, and below this the recessed area to add more sensor to turbine clearance. Not quite as elegant as I’d like, but it’ll do for now, and after testing there might be a slight refinement for the next batch. 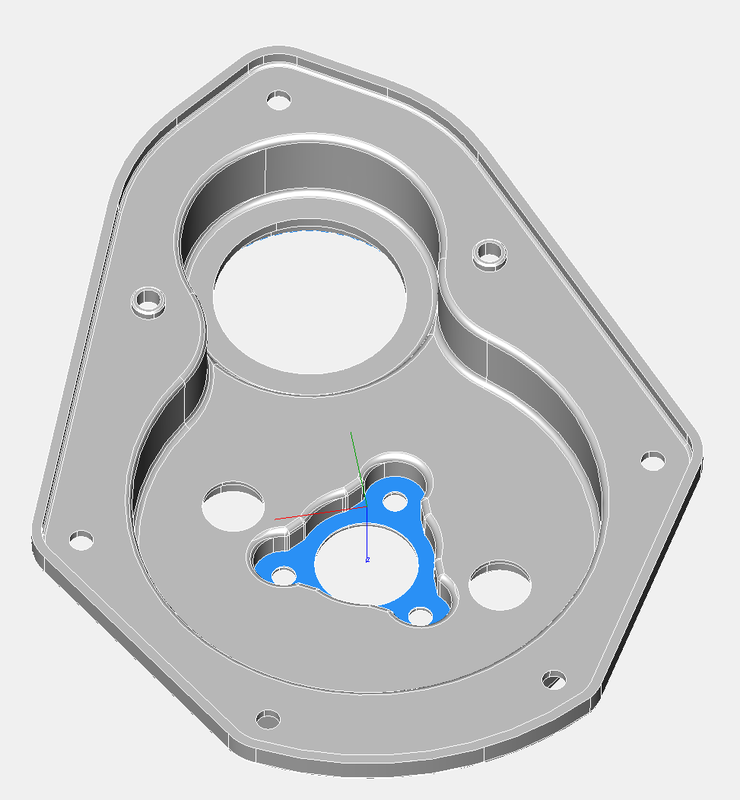 PS I thought I would weigh this part, and check the calculated weight in the CAD model versus the actual weight. The CAD model suggested 719 grams, but the actual weight was 723 grams, which is pretty close, and well within 1%. 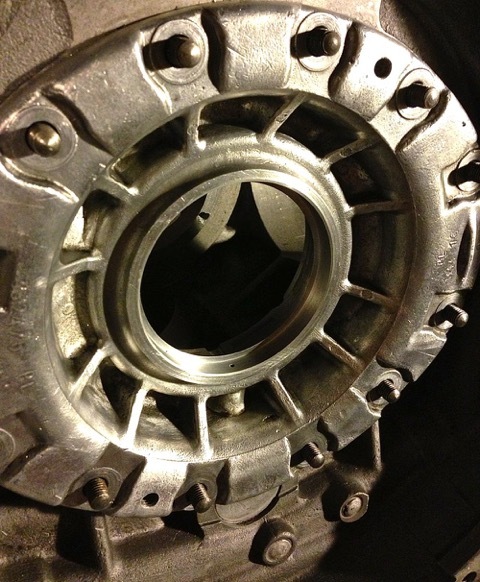 Incidentally, the standard part weighed around 530 grams, but this new timing cover is considerably thicker in places. I noticed when I was testing the sensors that these parts are orientation sensitive, so I created an orientation map to help me when it came to fitting the sensors. 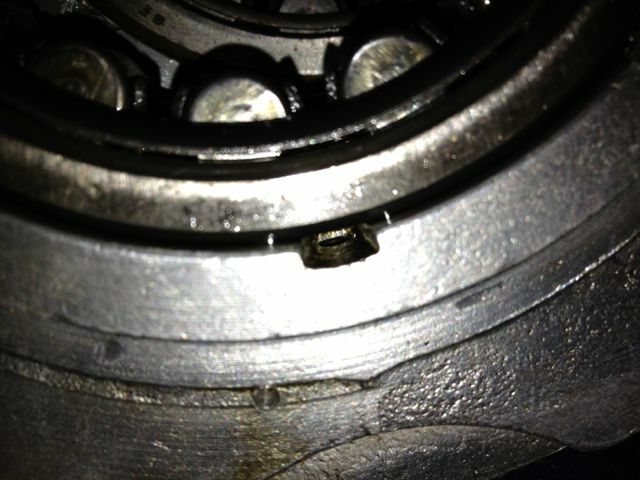 It was just a s well, because when I fitted the crankshaft pulley, I noticed the right hand sensor had very few options. The cable will foul the pulley, unless it is in the 1 or 2 o’clock positions, and it is best if it is tangental to the pulley, as this gives more room for dynamo V belt replacement. This is only really a consideration, as I am using sequential twin spark with the Imfsoft Ignition TCI module, and if I used a MicroSquirt, I could just use a single sensor and a toothed wheel. This will also be the case with electronic fuel injection too. 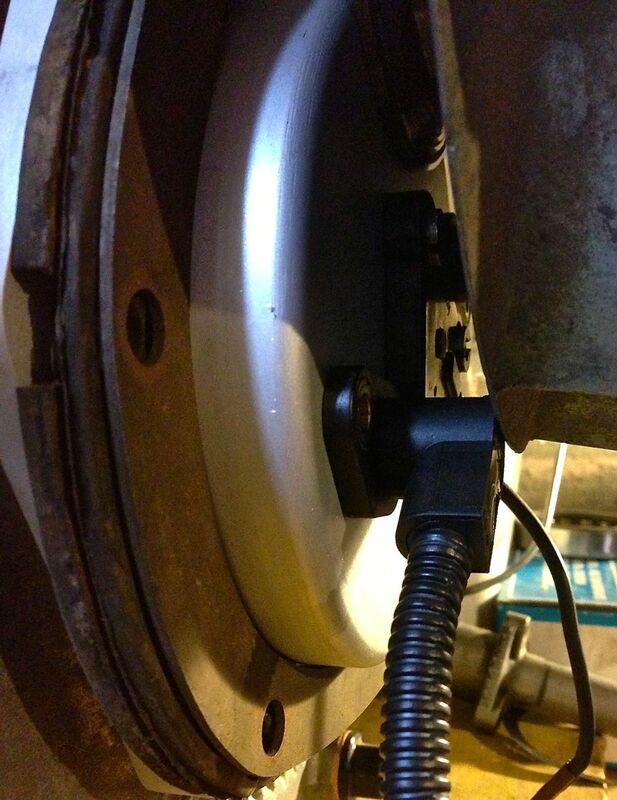 Notice how the Gelbey oil light sensor is rotated, which gives more clearance for sensor rotation. More importantly the clearance for the lower left hand sensor! 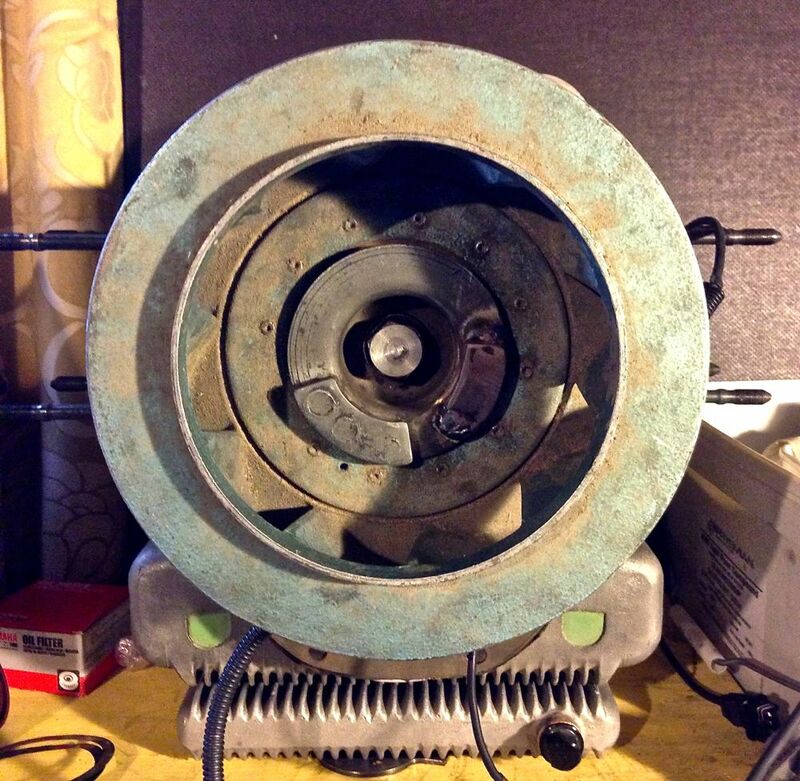 Pretty tight, except the fan is pushed 5mm further forward if my measurements are right (phew)! All in all, not a bad first stab, even if I do say so myself! Just a quick update again, as I have to jump on the lathe in a moment, more of a quick snap for Brian, as he’s got broadband now! 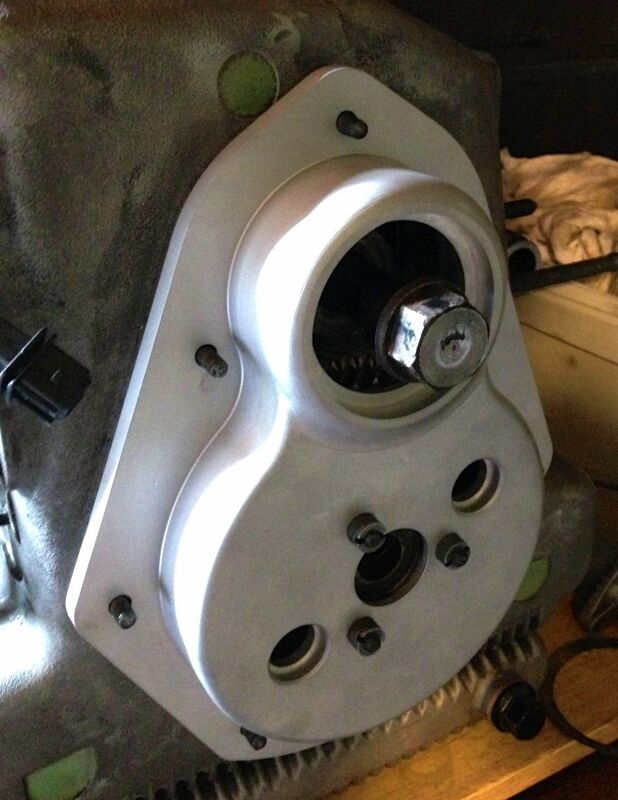 The first trial fit on a crankcase went exceptionally well, as the cover fits snuggly with no discernible play on the locating dowels. 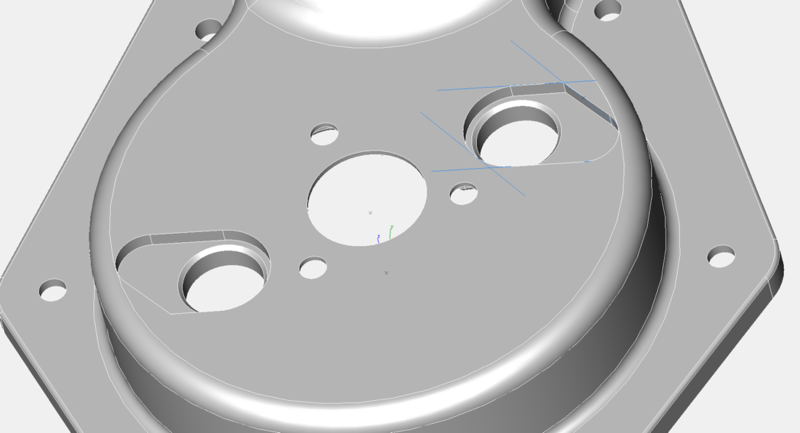 There were two minor issues, one the oil light piston tab washer detail was slightly too small, and two, the O ring seal could be marginally tighter on the sensor holes, but all these have details have been corrected in the 3D model now, so the rest of this batch will be spot on. I am extremely pleased with the results so far, and even better, there is sufficient room for the various trigger wheel configurations I have planned. I will update the pictures again later. 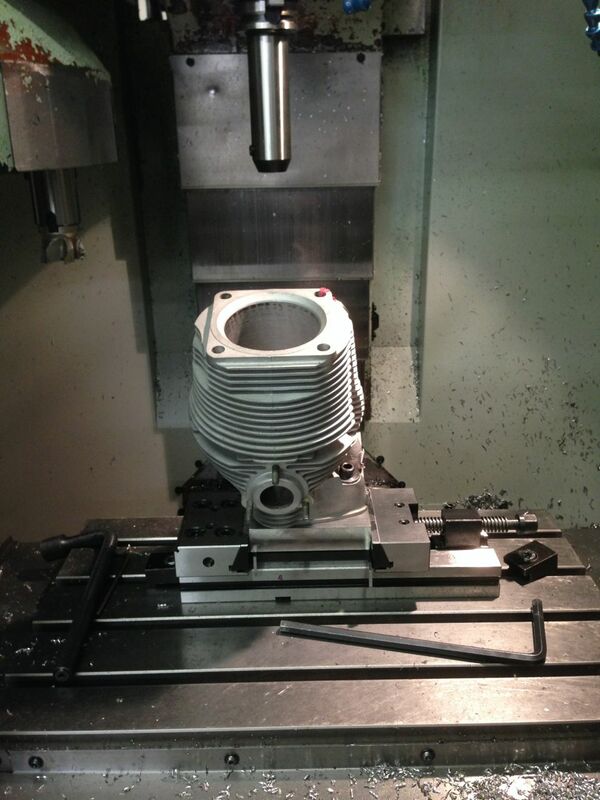 Just a quick update…the timing cover is on the CNC machine and being roughed out. 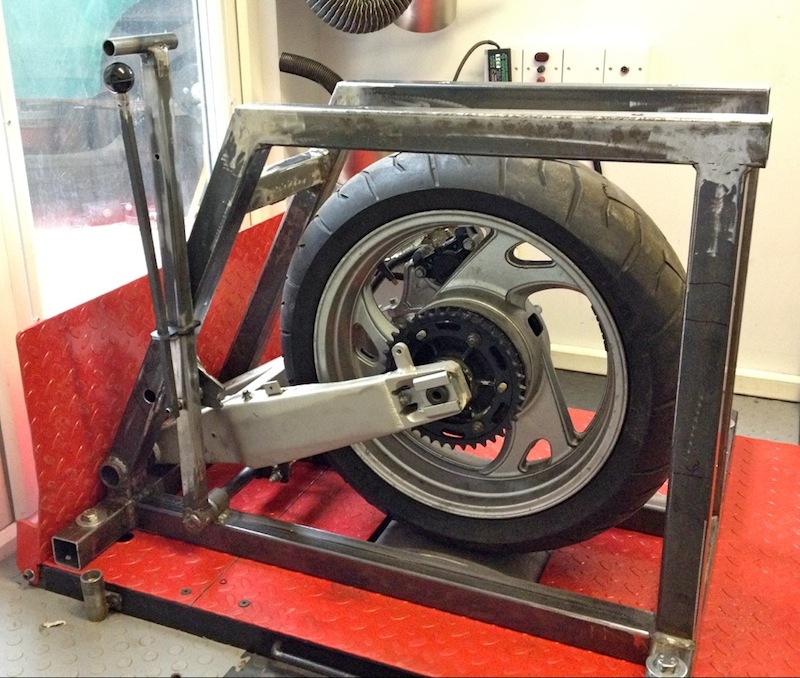 It was 10 years ago that I made a bespoke oil seal conversion for the rear bearing carrier using a small 55x63x5 Viton seal, and I was intending to use this on Brian’s engine. 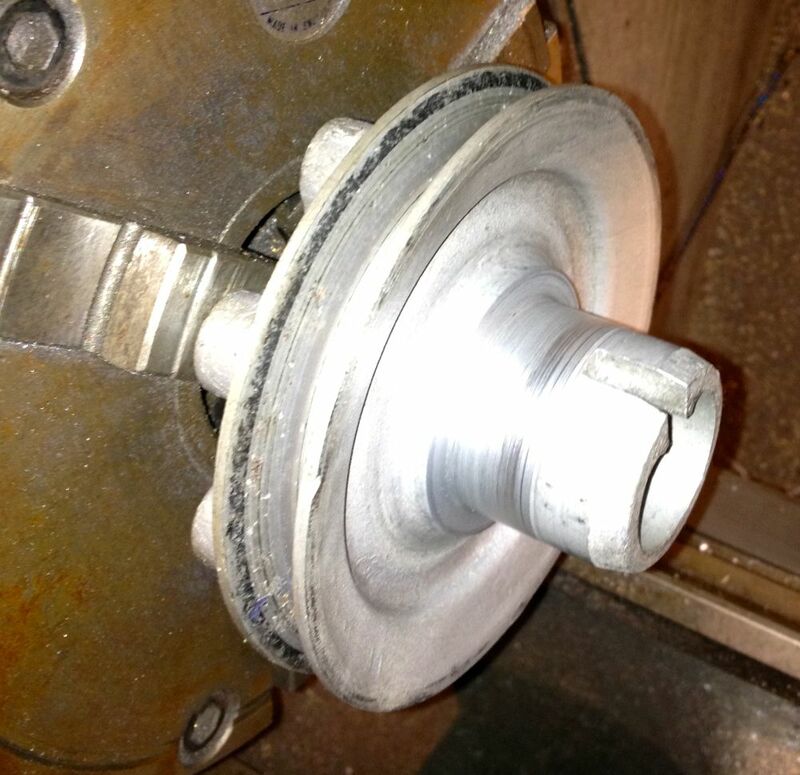 However, as I am close to the lathe it’s relatively easy to modify the rear carrier. Brian’s original carrier was chewed by something since its last rebuild, so I couldn’t fit the rear seal mod that I designed, and was planning on using another one from my parts bin. Today, I decided I would machine the damaged portion away, and rather than use a 70mm seal, I opted to use a 72mm variant, which meant all the remnants of the SIMRIT oil channel could be removed, and leave a plain seal surface, as shown in the photo below. I chose the 55x72x8 seal, because it was available in Viton & as a R23 variant, R23 means it has a dust seal too, but this is opened up after a short time anyway, but Viton is necessary because of the highish temperature and seal tip rotational speed. I also cleaned up the oil hole, adding a larger internal radius and opening up the oil supply hole to match the front. In the future, I will be doing this to all my engines, unless asked not to do so, but please note, I have no need to use a cast iron rear bearing carrier, as contrary to some beliefs, it is actually inferior, and a retrograde step to use it instead of the aluminium one. I was burning the midnight oil last night, and I realised I made a mistake in drawing the crankshaft sensor, because it wasn’t the right shape. 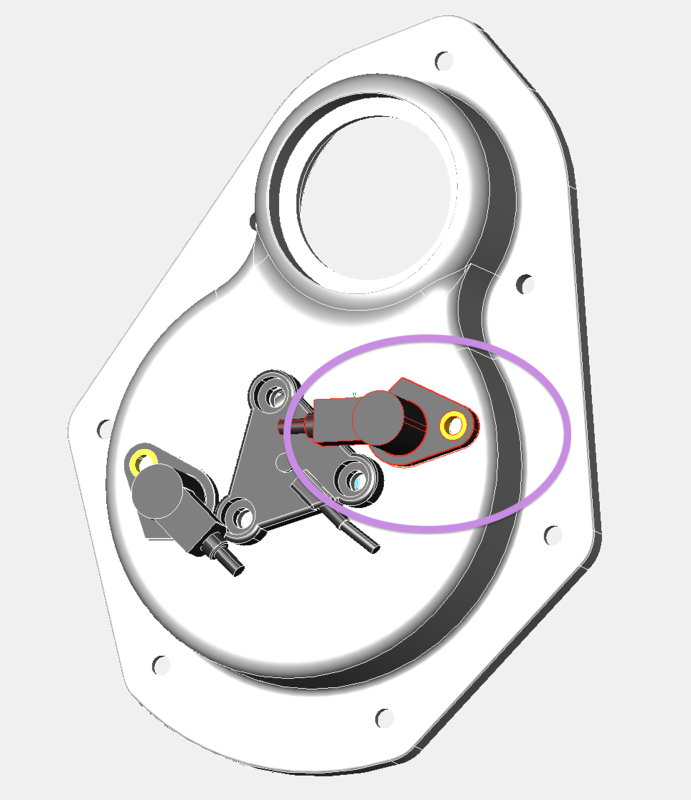 Ordinarily this wouldn’t have mattered, but the crankshaft sensor is rotation sensitive, and after double checking my bench rig, and mimicking the 3D CAD model positions on this, I found the error with the cable output. The sensors can be deliberately rotated on the first batch of covers, as I will be drilling and tapping the M6 fixing screws to maximise trigger detection, but for the next generation of covers they will all be fully finished. I have tried to make the measurements as accurate as possible, but I expect this prototype cover might need a slight dimensional tweak for the second batch. I have also made a decision to make the first batch twin sensor versions by drilling out both the sensor holes, and depending on demand, there might be a blanking plug fitted to convert to single sensor operation. It is pretty trivial to make one. 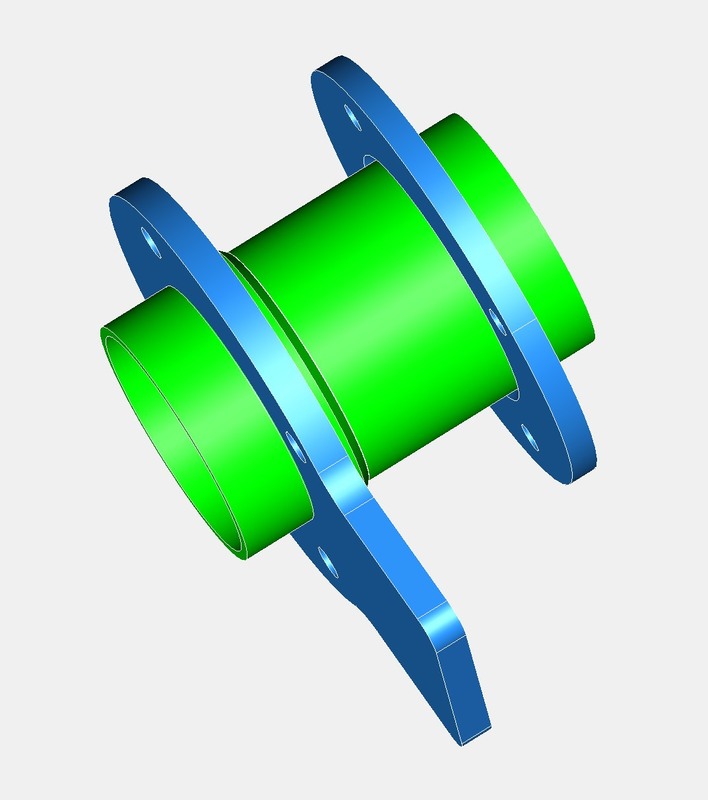 Correct sensor alignment & shape, suitable for Panhard camshaft rotation. There was a slight mod to the cover internally, as there was an interference issue with the Gelbey oil light switch internal assembly, so the drawing has been modified again! 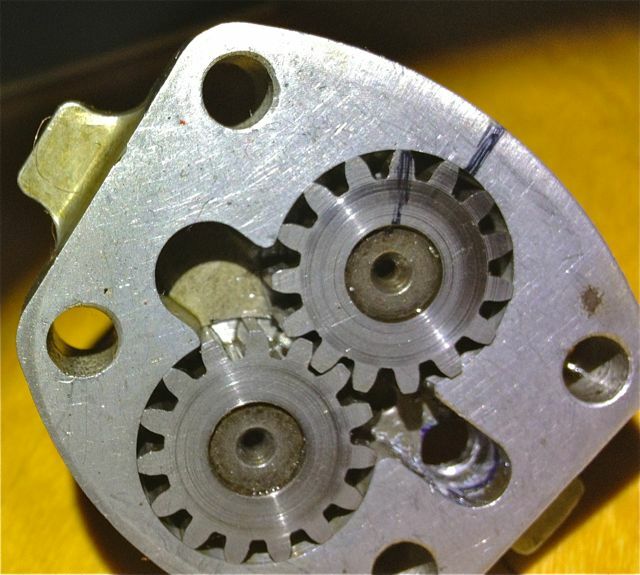 Here is the simple ferrous trigger fitted to an aluminium camshaft gear, which is just a turned down hex headed screw. I am very confident that the system will work now as drawn, especially as chasing down the issue of twin trigger events with square cut ferrous edges, I also discovered these particular sensors run in oily environments, which was one of the criticisms I had got from a few Panhardistes about the timing cover that was still outstanding, even though it was a non issue for me, as motorcycle camshaft sensors do this already. Over the last few days I have been testing sensors with the Imfsoft ignition module, and it’s no surprise the Hall effect sensors are out performing the inductive ones. The results of my latest tests are a no brainer, and I have settled on a new Hall effect sensor, which is cheaper, has a longer supplied cable, and terrific performance. If I used a strong magnet the inductive sensor had great performance at low cranking speeds, such that it would “start” with cranking handle, but when I changed the trigger to a plain ferrous material, the performance of the inductive sensor was obliterated by the Hall effect. 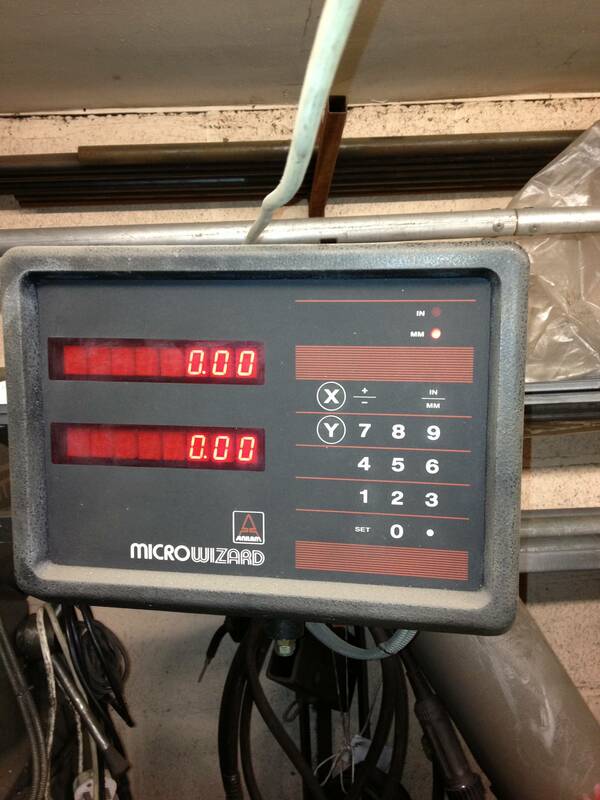 It took 165 rpms before the inductive sensor would work, the Hall effect at less than 7 rpm. 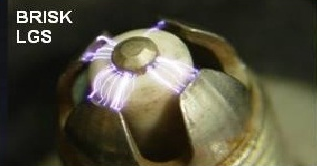 It was so good, the Hall effect would be triggered by the ferrous material, switch on the ignition module, and make a spark in a seemingly instantaneous action. I initially tried it with an 8mm diameter object, but when it was reduced to less than 5mm, it took nearer 400 rpms to trigger the inductive sensor, yet the Hall effect lost no slow speed performance, so that’s case closed on the sensor. There was an observation that the square edged on sudden transitional tooth is a problem for the sensor at low speed, it must be a sawtooth or sinusoidal tooth profile to work well. The only problem was it is now a different size, and so the fit is different in the timing cover, and this had to be modified yet again. Fortunately, the 3D modeller hadn’t started on my covers, so I have revised the drawing definitely for the last time. 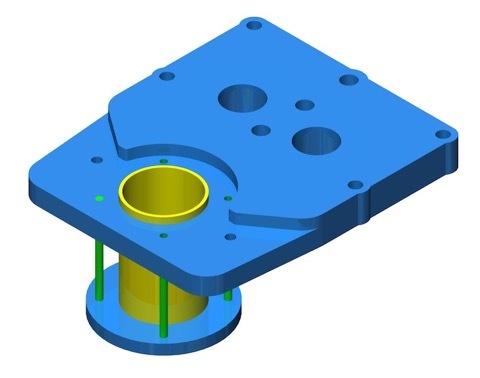 This means, the timing cover will be suitable for a toothed wheel approach like before, or a single tooth set up with the Imfsoft unit, and depending on the number of sensors, whether you get wasted or sequential spark. This is the final version! The boring bar works really well now, but I am running out of time to do Brian’s engine, so I have been looking at other options to reduce the time constraint. 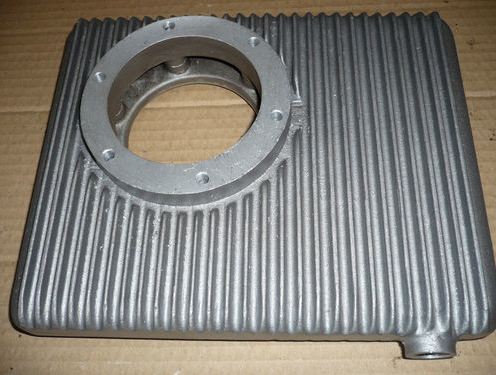 I have researched and got quotes from lminer manufacturing companies in the past, but I recently visited a local cylinder liner company, and was so impressed by their quality, friendliness and pricing, I have decided to have some new liners made for Brian’s engine, and in doing so, test the feasibility of making new ones for future piston batches, and the big bore engine. I wasn’t planning to do this so soon, but the big bore engine is gathering momentum a little quicker than anticipated, as I have now found a possible forging that is close on 96mm or 1086 cubic centimetres, plus I am simplifying the whole process to make it more cost effective. I am now looking at more expensive pistons, to save on cylinder reworking, and as a bonus it retains the original look of things., and reduces the modification count. My base philosophy is to make new parts rather than destroy old stock, but in the cylinders case, it’s a little too big of a step to make new ones of these…yet! 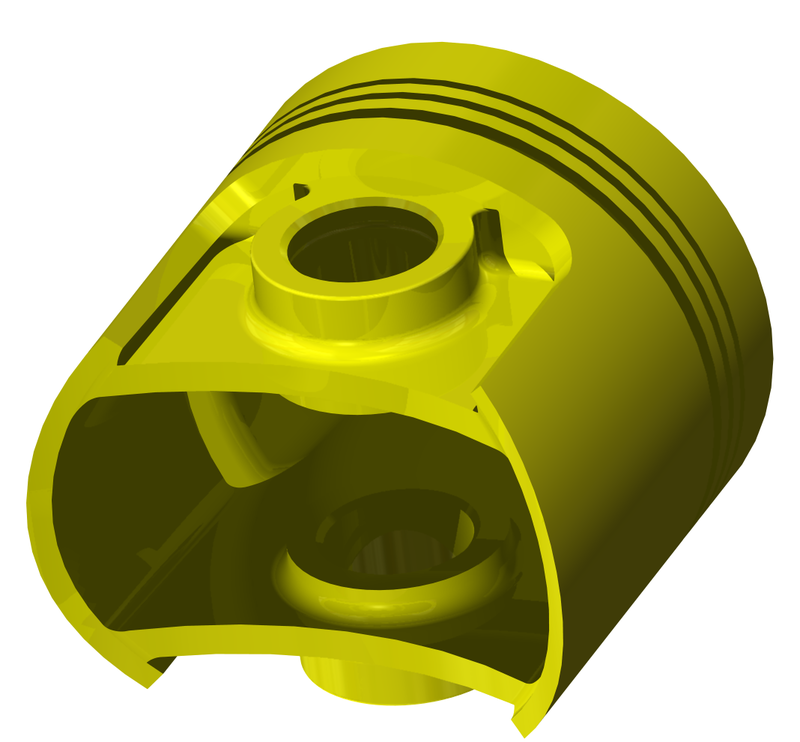 As a result, I have updated the 3D CAD version of the OEM model I did years ago, to fit the new Omega pistons, and sent a 2d & 3D file to the liner company to push this along. I don’t have any orders yet, but these liners will be around £100 each, and be sized & honed to swap into the existing cylinders without any further machining. If anybody else would like bespoke one off liners drop me a line, and I’ll draw them up and arrange manufacture. 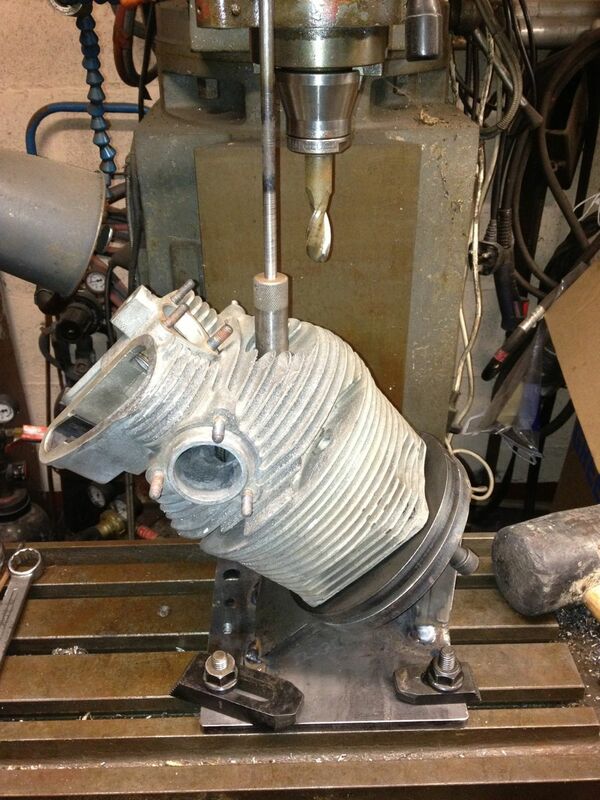 The first batch of four will be ready by the end of April according to the company, but the usual lead time is 4-6 weeks, so I grateful they have arranged to speed up the process, and they will be placed in Brian’s engine and hopefully powering us to the 2013 Dutch International. 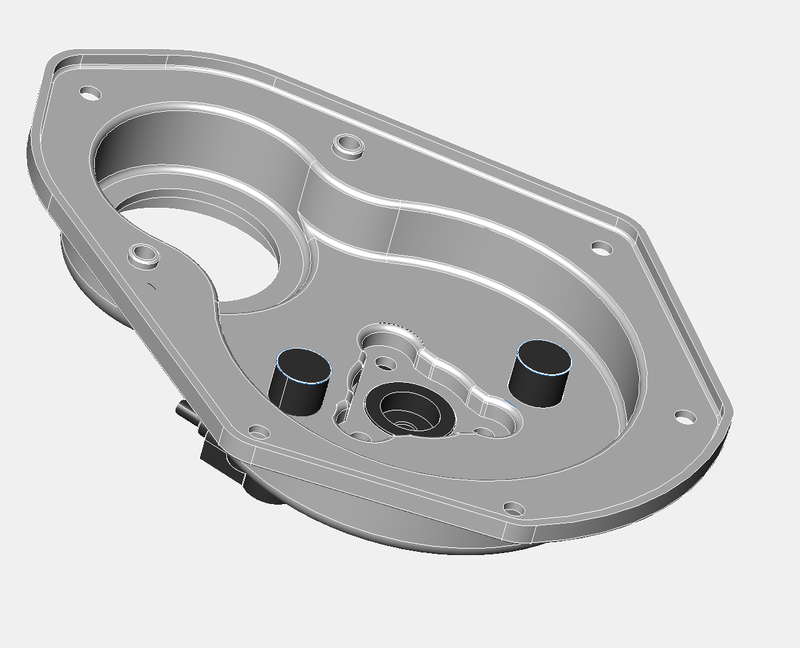 I instructed the 3D modeller to go ahead and make four of these front covers, I have orders for two, and I have decided to make two to suit the Peugeot sensors and make two more plain variants, without sensor locations. I will rework these to suit later, as it gives me a platform to try other sensor options later. 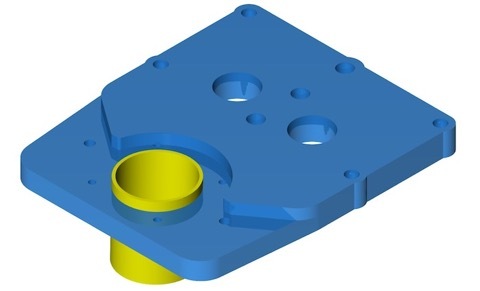 The new covers will both have single sensor locations, with the ability to machine out the other location, which does not have a through hole, so it is essentially an integrated blanking plug. I need this other sensor location for twin plugging when using the Ignition TCI6.1 from Imfsoft, but if I revert to a toothed wheel configuration, the single sensor will be enough to satisfy the plentiful options that exist for standalone programmable engine management systems. 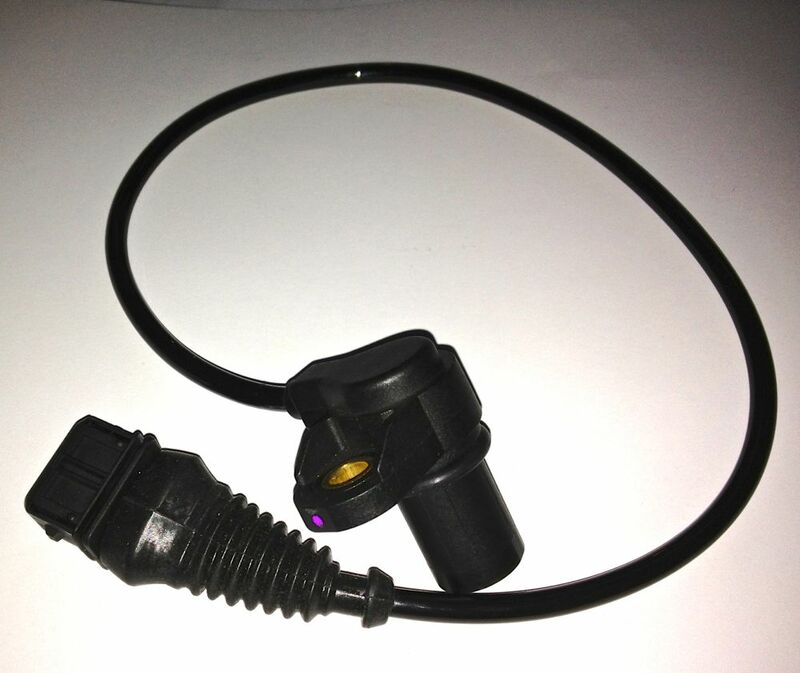 Single sensor version with Peugeot 405/406 crankshaft sensor, and below this, the twin sensor version. I shall order a few 45x68x10 Viton R23 seals for the front pulley aperture in the next few days, and possibly book these in at the anodisers for a coating of OEM black, when they are completed. I have to say without doubt, this is the single most awkward task I have tackled on a Panhard engine. Valve guide removal on a 50 year old engine is not for the fainthearted, and even though copious amounts of heat were used, the whole process requires levels of force that make you wince. After making a suitable drift and warming the cylinder up, (spit just beads off), I inverted it onto my anvil! After a dozen blows, it started to move, by which time it was cooling, so I decided to drill the inner out some more and lose some of the interference fit. 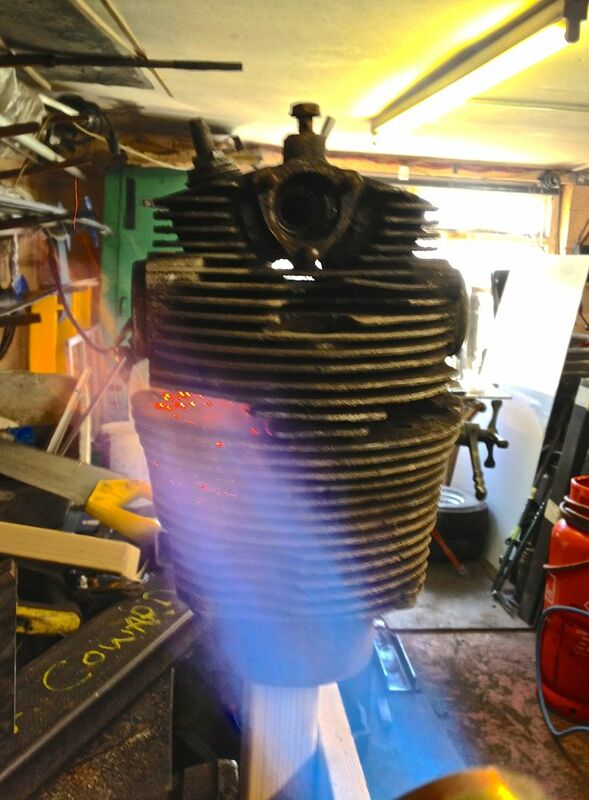 I then heated the cylinder up some more and inverted it quickly on the anvil ( the cotton towelling rag caught alight! ), and hit the guide some more. 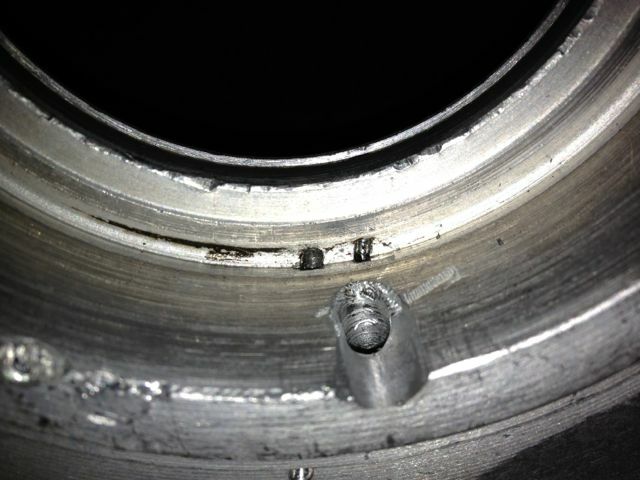 Finally it eased out and the cylinder looked like this. The seat had been removed previously. Now the task of refitting the guide, I decide this was first up as the smaller diameter required more heat to open up, so my thinking was do this first, then top up the heat and tackle the insert.I successfully managed this, but it was a two stage process, because even though the guide was -17ºC, it soon warmed when in contact with the cylinder head and it needed a reheat to ease it into the head. I also made a specially turned up brass drift, so as not to damage the new guide. Anyway, I next did the insert and here it is just installed, blueing on the heat transfer from the cylinder! You can see the new guide too. All this was possible by modifying my seat installation tool, shown below, complete with burnt paper! This is the interference fit, so you can extract the installation tool, as the seat insert shrinks. It was wonderful to watch as the cold insert heated up from outside to middle as it absorbed the heat, proof that there is a heat transfer path at this point. Here is the cooler result about half an hour later, so I just need to recut the valve seat, to finish, but that’s for another day. Definitely not for the faint hearted, and as a result I am going to make some new valve guides next time and re-machine the cylinders each time I do this in the future. Another day, another dollar, and as Jean Paul Cesar suggested, putting the milling head horizontal was the easiest solution to my limited vertical height, but if the jig had been shorter, it wouldn’t have worked because the locking bar would have fouled the milling table. Here’s the mill is centred on the OEM spark plug horizontally now. The Elliott Sturdimill is a really flexible piece of kit, and I didn’t realise the mill table could go so high, but to be honest I have never used it like this, and it turned out to be a master stroke, as I didn’t have to modify my jig. 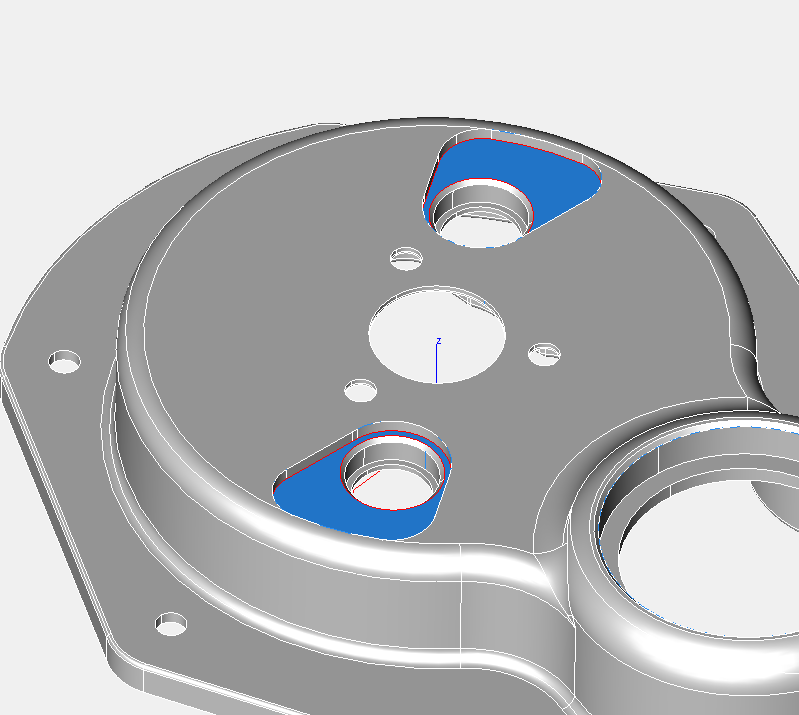 The depth of machining compares well with the OEM plug location. 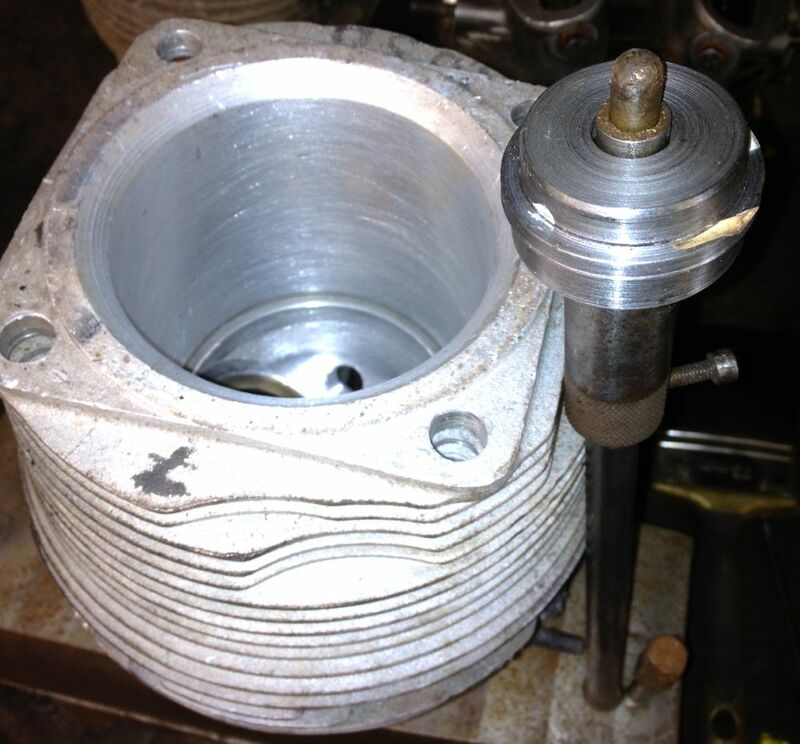 Brian’s other cylinder machined with two plugs in situ, a little more work to clean up the exposed threads and the job is finished. 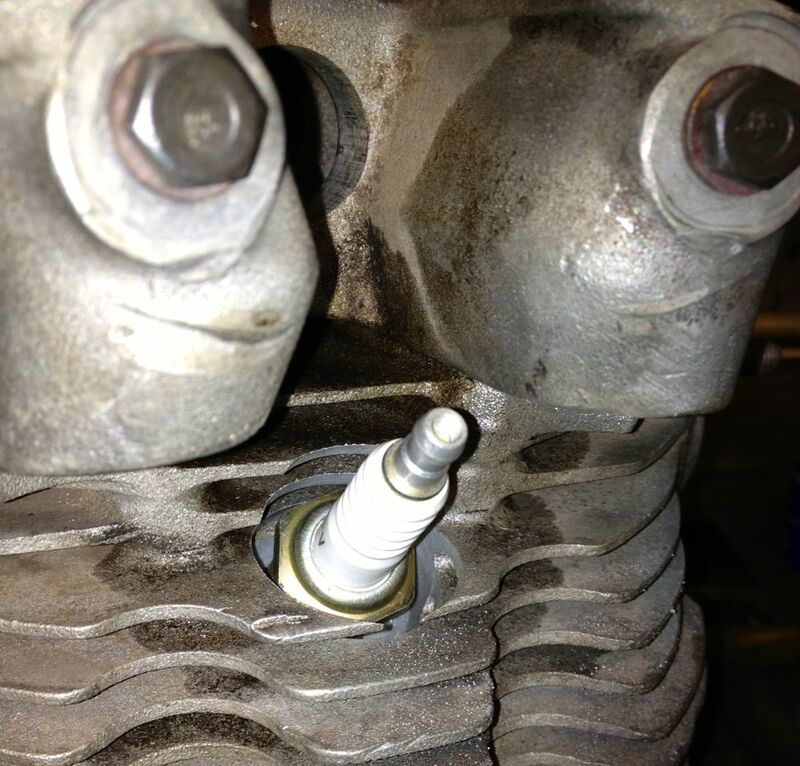 Twin plugging is adding another spark plug to each cylinder, so that each cylinder has two plugs. 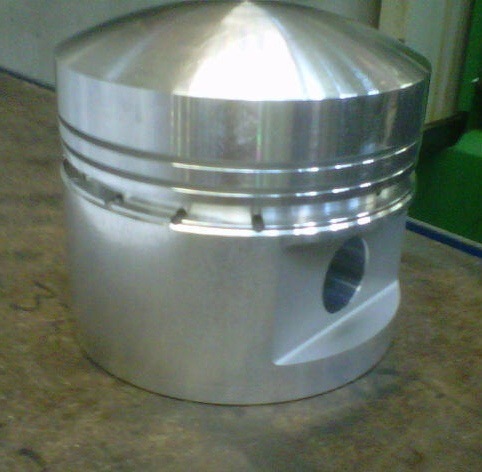 This is beneficial in a domed piston , domed combustion chamber environment, because the flame front can be chopped short by the lopsided combustion processes. To make sure this non ideal combustion is completed, it’s usual to run plenty of ignition advance, and as the rpm goes up this advance figure rises. High advance exposes the cylinder components to a longer heat exposure, so the engine runs hotter too. discharge spark plugs, which are at a disadvantage at low speed, & lean mixtures, so fitting an extra spark plug will negate some of this. How do you twin plug a cylinder? 1. 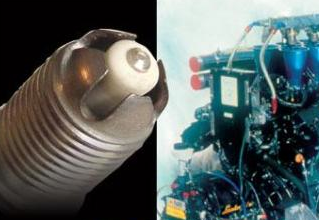 Establish existing spark plug position. 3. Drill, tap & mill the spark plug recess. 4. 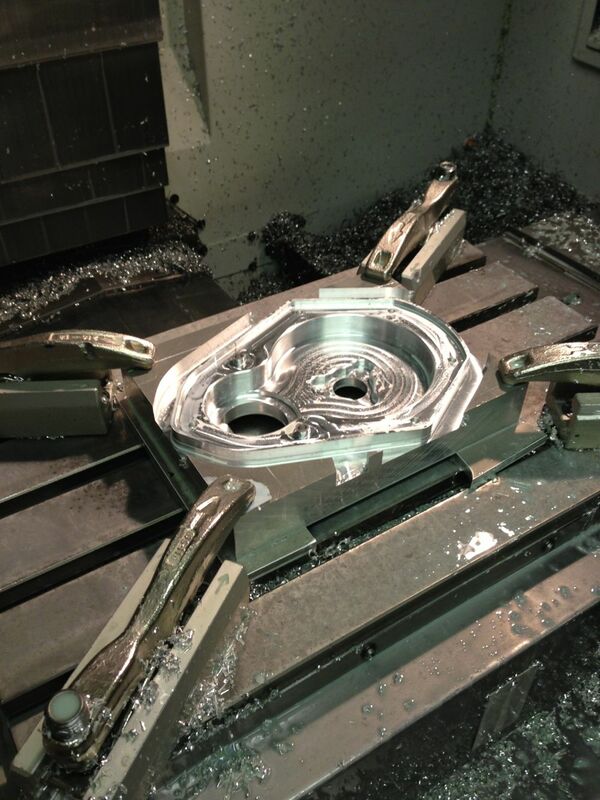 Mill the fins to allow for spanner access. 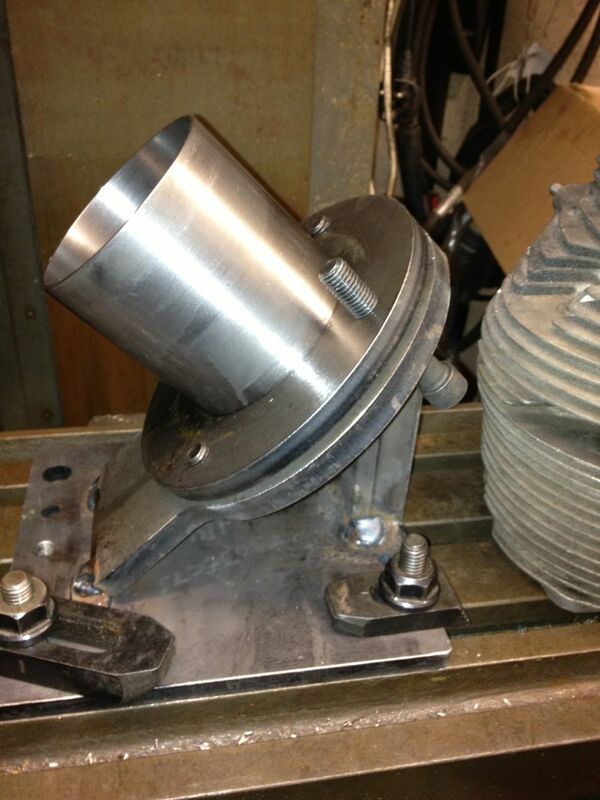 Here is the start of my jig, which was some reused components from the crankshaft rig, and the honing clamp parts. 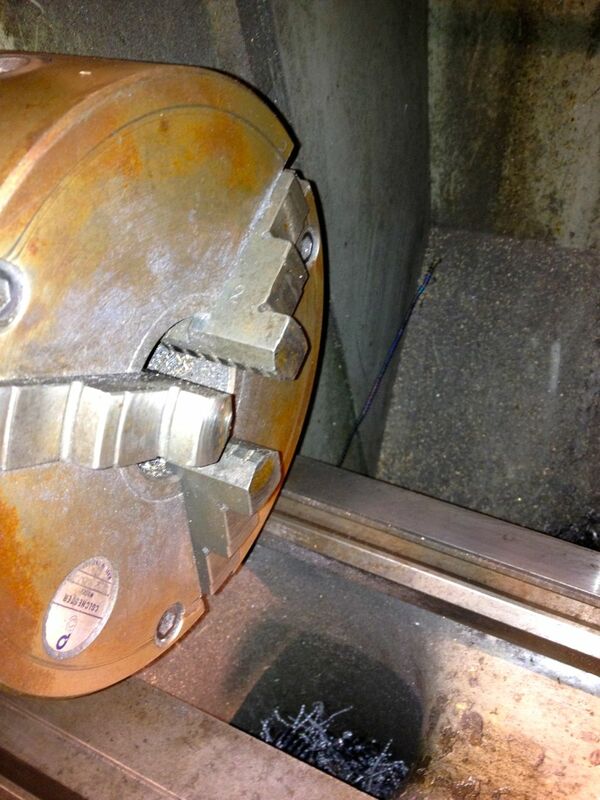 The cylinder is slid onto a turned down liner, and clamped in situ. 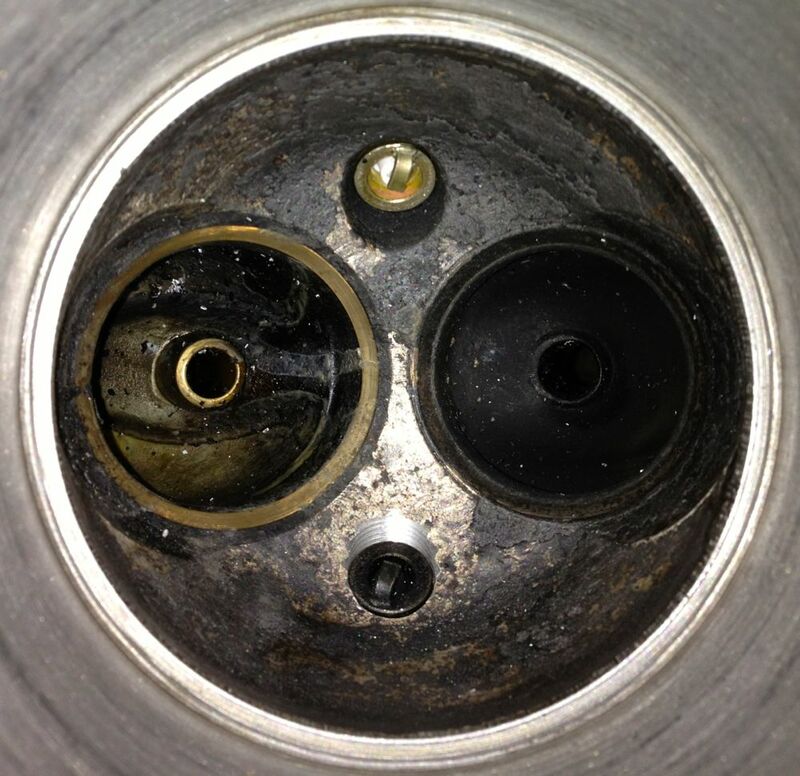 Then we locate the centre of the original spark plug. You have to watch you have enough clearance, and in my case I didn’t have enough height to use the larger milling cutters and associated collets. This mill uses Clarkson screwed shank milling tools, so I needed some long series ones for this kind of work. Unfortunately the first operation is to drill the spark plug hole, actually it isn’t, because i used a 20mm diameter slot drill to remove the fins and create a flat surface for a stock 118º HSS twist drill. When I wound the mill table fully down I couldn’t fit the larger INT 40 collet chuck, so I am looking at shortening the jig, angling the head at 45º, or better still, as fellow Panhardista Jean Paul Cesar suggested ”put the milling head horizontal”. The latter idea is quite appealing, but that’s assuming the mill table can go high enough, and I’ll have to remove the boring bar from the other end of the mill table. I will know for sure tomorrow, and as I don’t have a surface block to place the jig on and hold it down, I might end up cutting the jig down yet, as I thought previously. 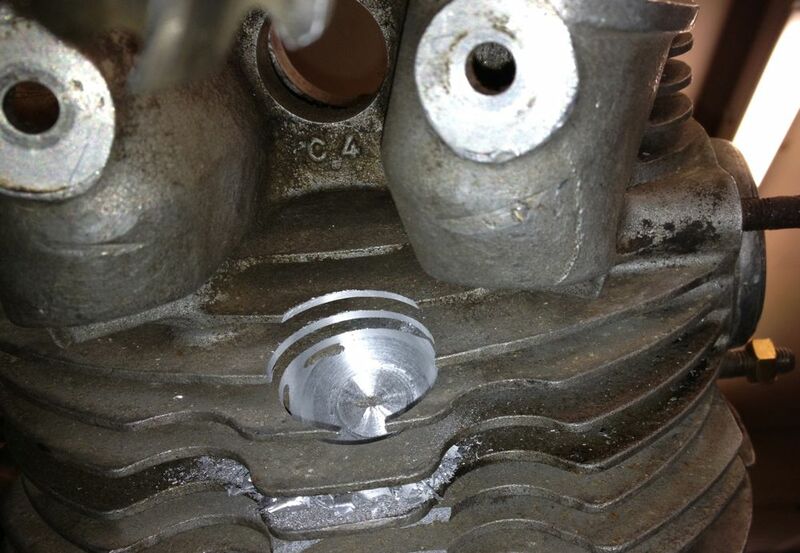 I still managed to do a little bit, here is the cylinder after the 20mm slot drill has cut through the fins, whilst the cylinder awaits the Ø12.5 tapping drill (for the M14 x 1.50 spark plug thread). I just got word today the ignition has been despatched from the supplier, so in a few days it should arrive. I have decided to update the 3D model to incorporate the BMW camshaft sensors, so I could explore different possible locations, and this is the result so far. Looks like I might be making a tweak to the cover again, but this would only be if others were interested. The first batch will be as is shown below, as it will delay the item for Brian’s engine too much. Internal space model, to check how much room is available. This is the sequential ignition variant with a fibre camshaft gear wheel. 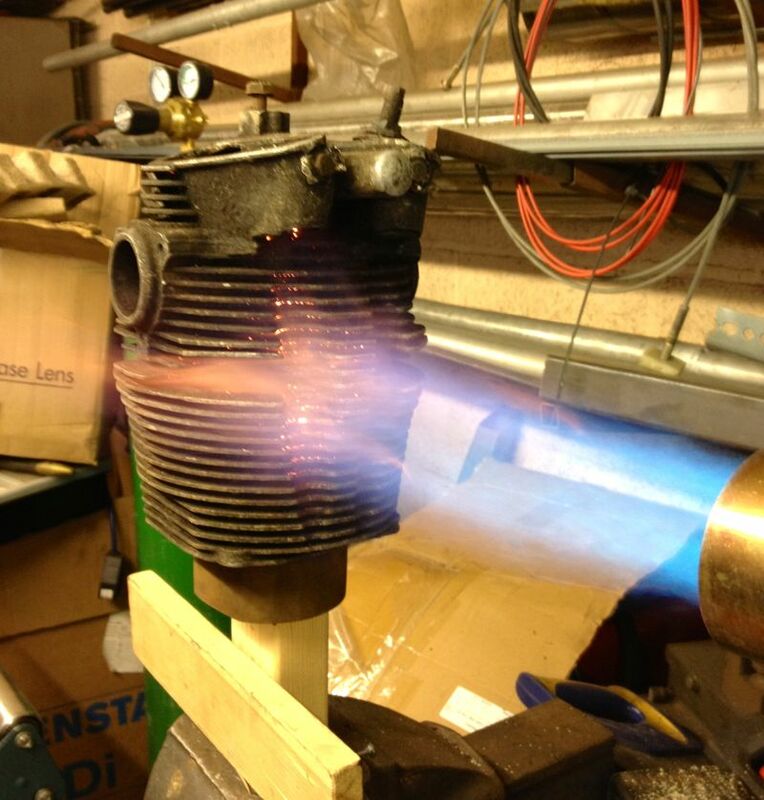 I have decided to fit electronic ignition to Brian’s engine, and although I can do it a few ways, and have done so in the past, I thought I’d raise the bar a little for Brian’s lump. As I don’t know where the advance curve will want to be, and I didn’t fancy a manual advance & retard system, that could get out of range with disastrous results inadvertently by persons unnamed, it was decided to fit programmable ignition that could cater for twin spark, as well as wasted spark aka Citröen 2CV. I have identified an ignition system that I could use, that allowed adjustments via a laptop on the fly, which means as you are driving along, unlike TuneECU & my brother’s KTM, but that’s another story. Anyway, after looking at the ignition system some more and exploring how I could build it in neatly to the existing engine, I decided that the front cover was the best choice for my future plans. I need a cam sensor, and I have looked at using the pushrods, the rocker arms and a proximity sensor, but it was all too complicated. I modified Brian’s front cover to take a modern oil seal, and was going to start making a pulley based trigger wheel like I drew some time ago. However the cost of these parts outweighed their usefulness, so I decided Ito revisit the cover again. 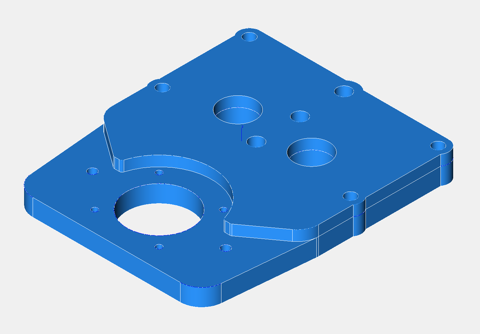 A couple of hours later, I had a 3D model, based on the dimensions of the original pressed cover,, that had the flexibility to accept any manner of different tooth triggering systems, and a front crankshaft seal that could cater for all ranges of front pulley mods others have done. A few hiccups, later, one revision to cope with the planned programmable ignition unit, another because of the cost of the sensor loom, meant I’m on the third & hopefully final iteration of the new front cover. It should be more affordable, especially as I have got rid of those over priced Renault connectors. 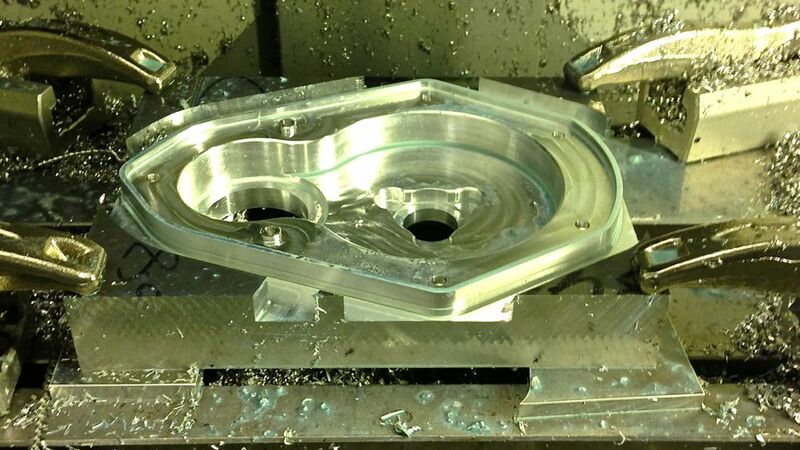 At the moment it is machined from billet, but there is a possibility I can use a casting, however this depends on numbers and whether it is economic to go this type of production process. 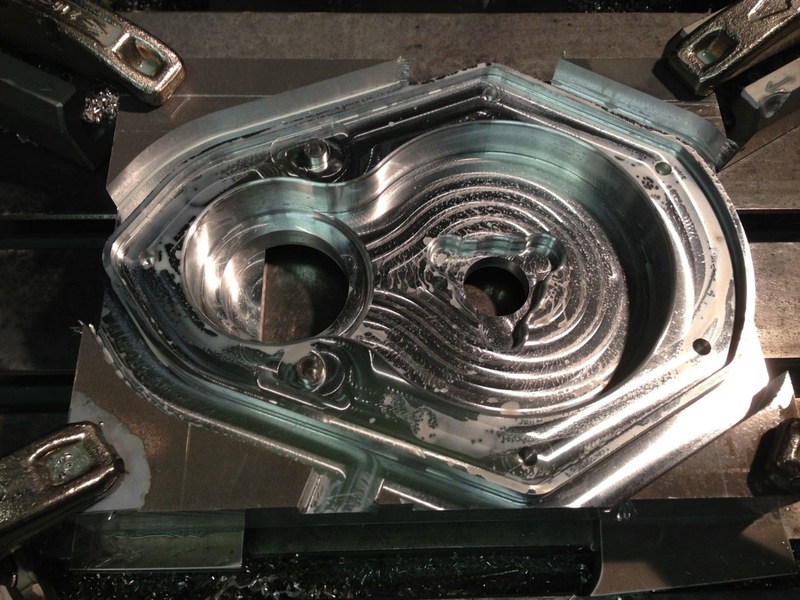 because you still have to machine the casting, although you do save on roughing out the billet. This is the sensor I will be using, which conveniently takes a readily available connector, that doesn’t require exotic crimpers. 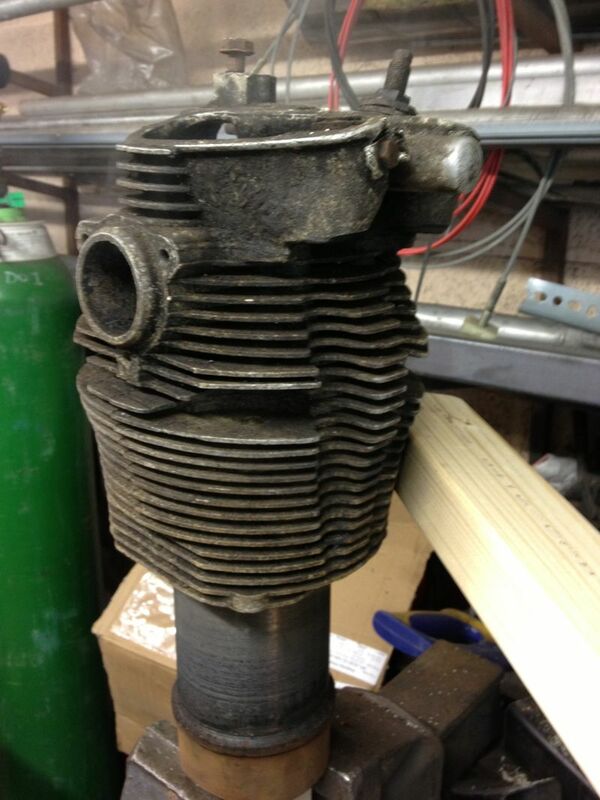 I have ordered another one for Brian’s engine, as this needs two. This is the third time I have seen exhaust valve issues on Panhard engines. 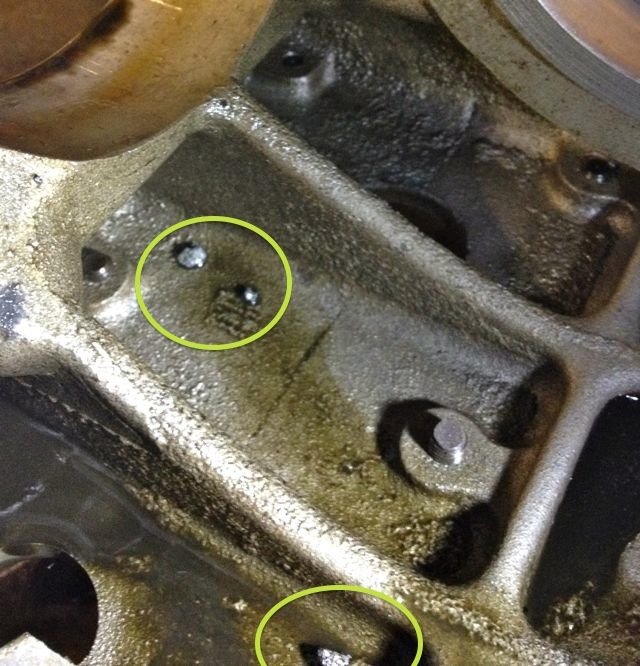 The first one was intermittent loose, the second one dropped out, and now this one in Brian’s engine which was damaged by valve seat recession. Many years ago, I looked at a loose valve seat and wondered how if these things that were put in using cryogenics they could come loose, because it is rare in modern engines. 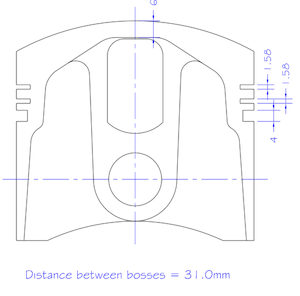 I used a spreadsheet calculation to plot the relative sizes of the machined seat recess and the insert outside diameter as the temperature rose. 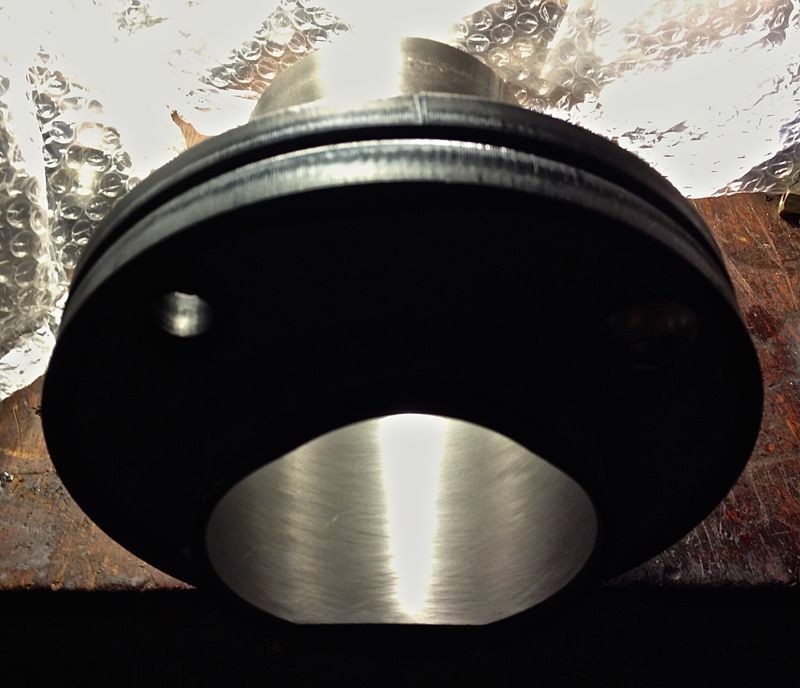 Ultimately as the aluminium head gets hotter the dissimilar materials will expand, and loose their interference fit. It happened at around 320ºC, and the percussive action of the valve would almost certainly be moving the seat by then. 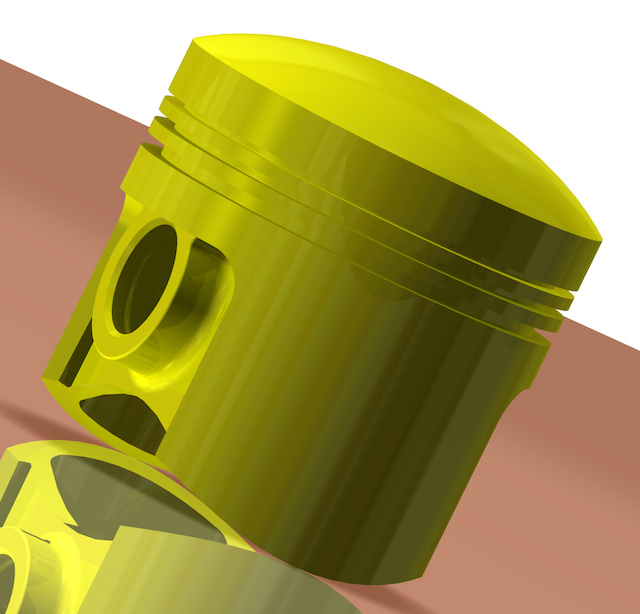 I have been told the expected temperature of the piston will be around 280ºC, but longer advance values from say, a tired distributor will mean the average head temperatures will almost certainly be higher. 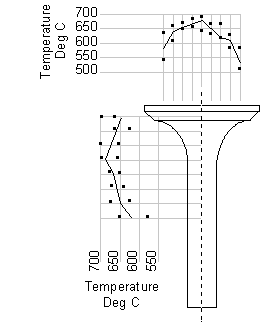 If you throw in a weak mixture to one cylinder being driven by a good one down the motorway on a hot day for example, and you’ll could easily meet this high temperature condition, but the valve runs much hotter at certain parts of the combustion cycle anyway. 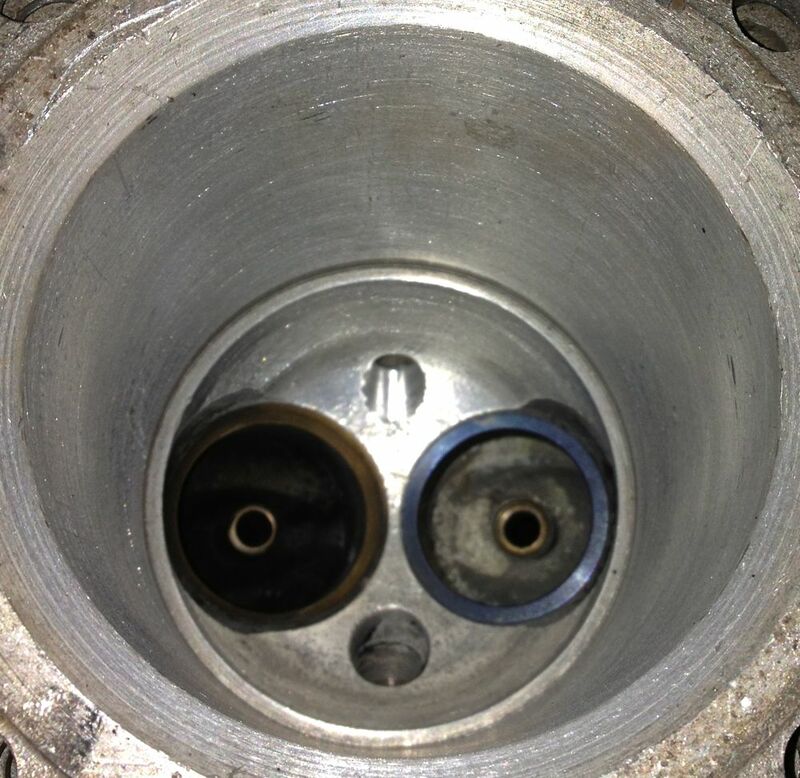 When combustion is initiated the exhaust valve head is heated on the face closest to the piston, and when it opens, the hot combustion products wrap around the valve head, heating the back of the valve head, the seat insert, and the stem. 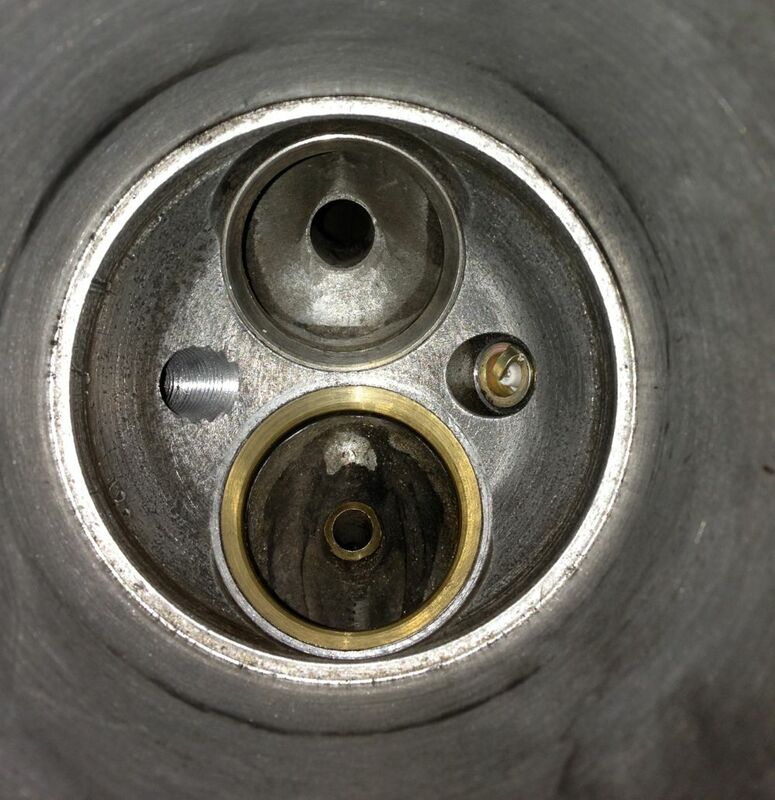 Whereas the inlet valve gets a cooling effect from the fresh charge, the exhaust relies on loosing this heat through the seat insert primarily, which can be as high as 75%. Typically the stem to guide takes the other 25%. These values can vary, depending on what you read, but the primary heat path is the valve seat insert to cylinder head interface. 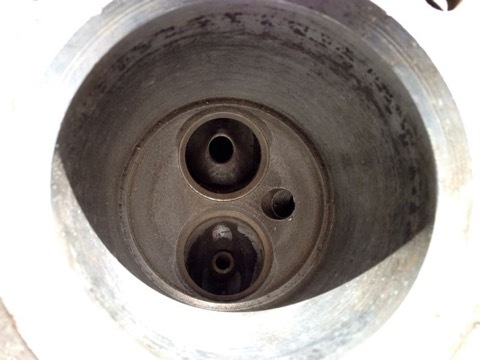 If this has poor conductivity, then the valve seat will not lose its heat, and run hot. The other side of the coin is other air cooled engines and do they drop valve seats? I don’t know of a problem with Citröen 2CVs, but it was an occasional occurrence with 412 VWs, so perhaps it is the way of things to be. 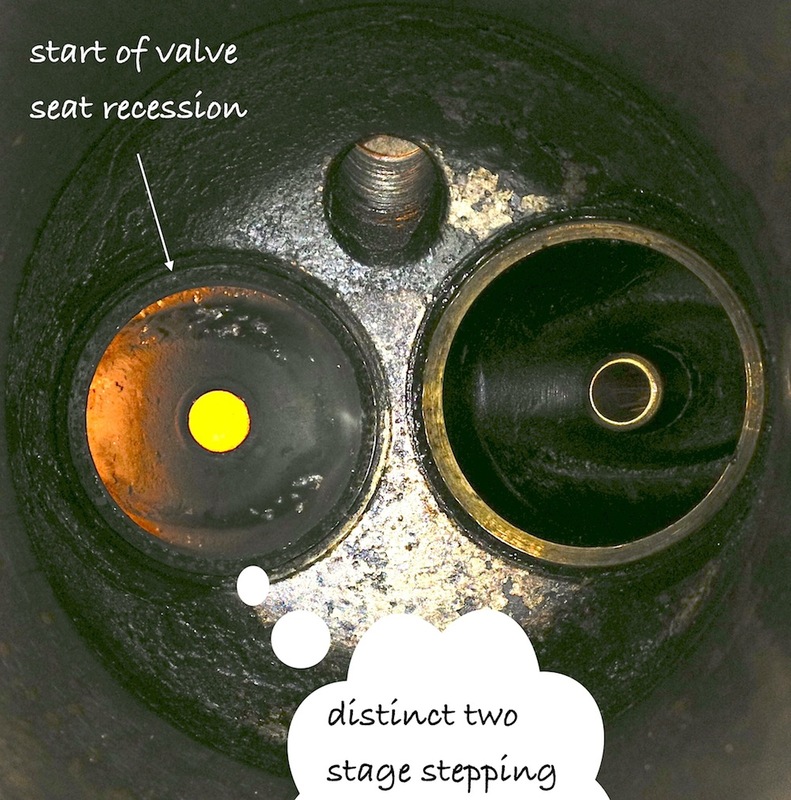 However, cooler oil, non weak mixtures, better ignition control and within specification valve guide clearances should all help reduce the temperatures that the valve seat is exposed to, but is there anything else that could be done. A quick look into the history books, might reveal a few answers, and they do with exotic materials being used, valve gear exposed to airflow, excessive finning to lose heat, rich mixtures to create a cooling effect, and even reducing head diameter to reduce the surface area exposed to the combustion process. Anything else? 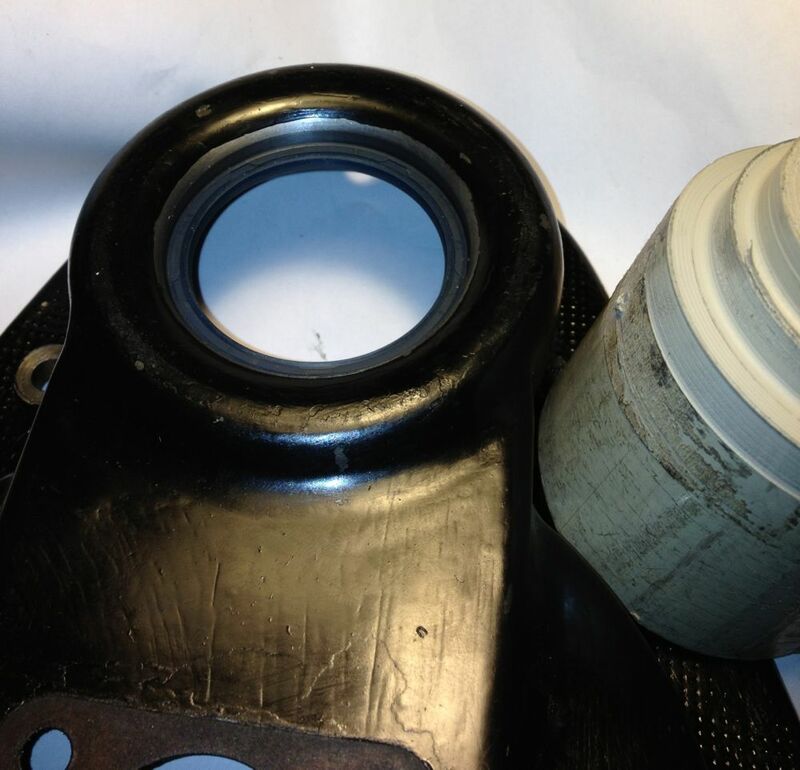 Here’s a Panhard valve seat insert, and below that is the same Panhard exhaust seat insert & a modern equivalent from a Harley Davidson…spot the difference? The clue is in the sides. Notice the carbon deposits from the combustion products caking up the sides of the seat. 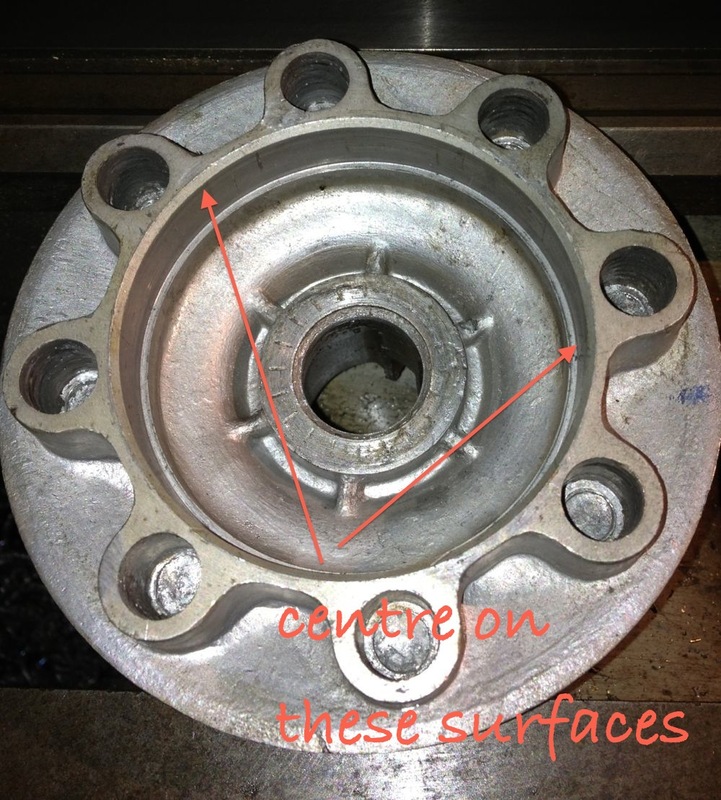 Panhard valve seat inserts, have peripheral grooves in them, nearly every other seat has smooth sides to maximise the contact area, so perhaps this explains the issue more than anything else. 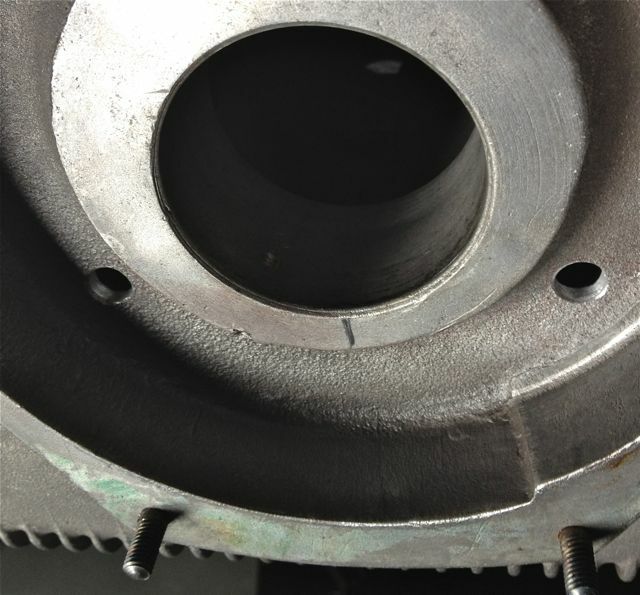 Panhard valve seats should be replaced with smooth bore equivalents, and possible have slightly more interference fit. 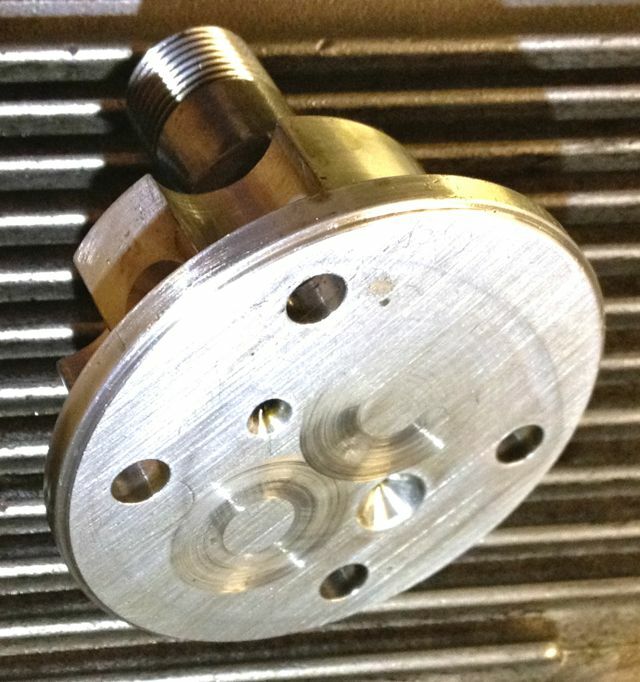 Brian’s engine will have this fitted to his affected cylinder. I always intended to fit a modern oil seal to Brian’s engine, but I was going to make a new pulley arrangement, however the ignition has taken another direction lately, so I don’t need the crankshaft triggering I was going to use, but more about that one later. 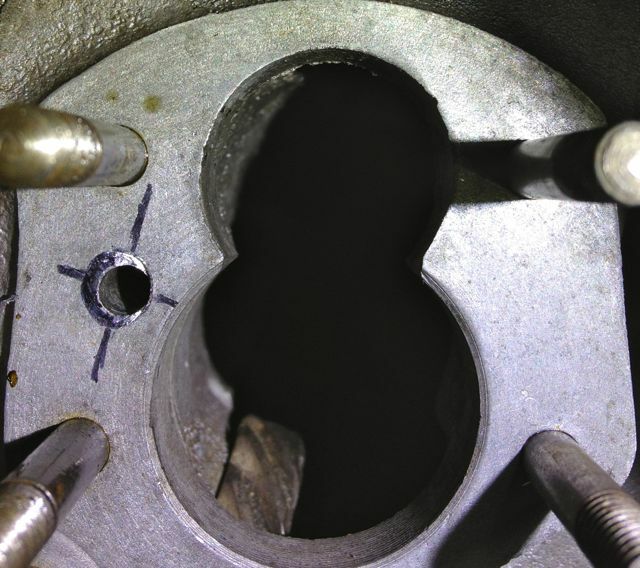 There is a groove in the front pulley (arrowed) to accept a piston ring type seal, with a hardened surface in the cover for it to rotate in. Check it’s running true, and machine to 40.02 mm, but don’t worry if you go too small as bearing retainer will save your bacon. Next up modify the timing cover, I used a local engineering company to open up the hole to Ø52mm, the idea being I could use a 42 x 52 x 4, 5, 7 or 8 mm deep R23 oil seal. These are available in Viton in the smaller widths, but Nitrile or NBR is adequate for this diameter. The 5mm is shown, but I am changing this to the 8mm version when it arrives. There is a slight step, which acts a s a seal stop when fitting, which you can see in the close up. To make it easier to fit the seal square and not push it in so far I made a stepped mandrel out of some scrap ABS. To fit the seal, place on the tool, and then push into place. 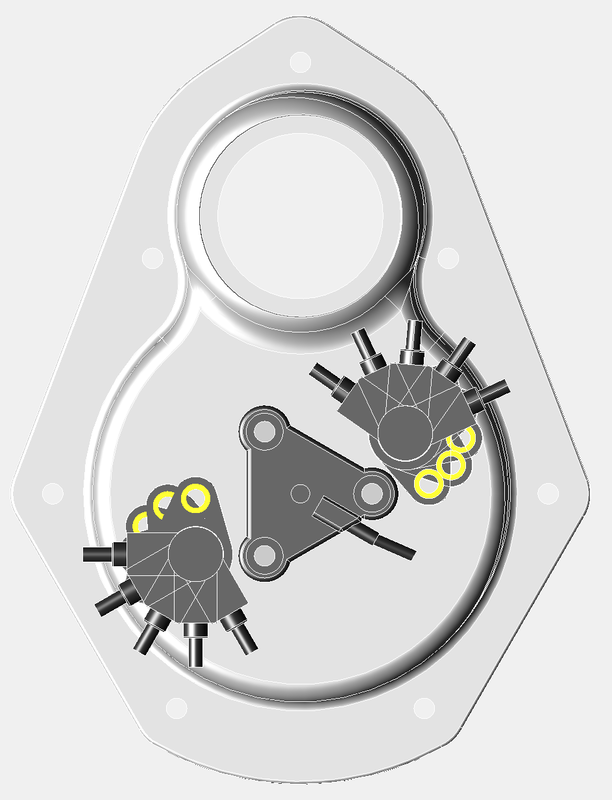 Note I will not be fitting the slingers (G & F in the diagram at the start of the blog) inside the timing cover, as the oil mist and splash lubrication to the gears will lubricate the seal, and stop it sticking or drying out. I always thought that Panhard valve seats were immune to valve seat recession. 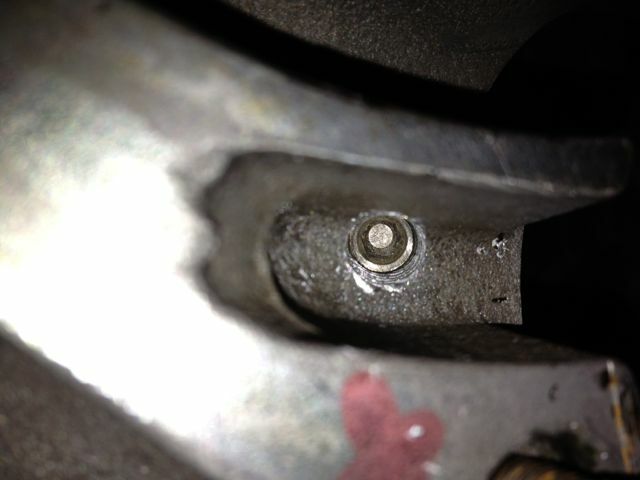 I was just stripping down Brian’s rear cylinder, when I noticed the exhaust valve sticking when I removed the collets. This is the reason why. 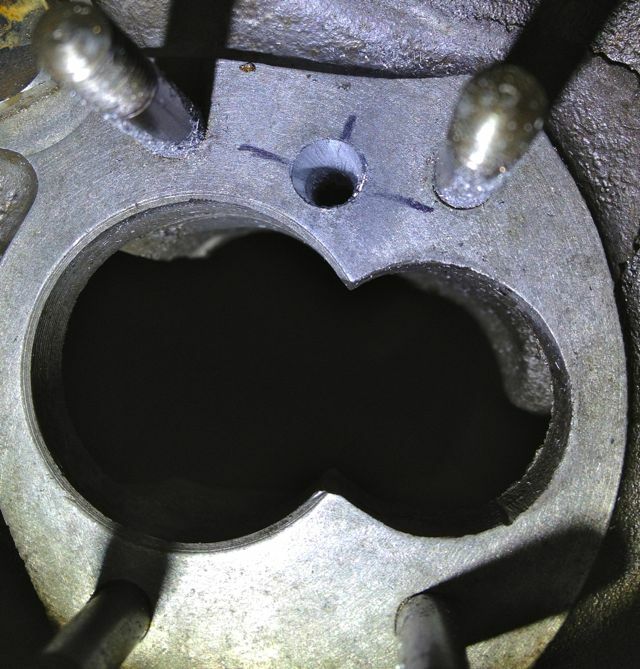 The exhaust valve had receded into the head by about 1mm in places, and the seat now looks like it has two 45 degree faces cut in it, so it looks like a new valve seat is in order, or it might be quicker to swap out the cylinder. I have a valve seat, but it means heating the cylinder to about 380ºC, which is when the differential expansion rates should loose their interference fit, but it looks like I will have to do the valve guide too, as it’s rocking once the valve is off its seat. I am finally getting there with the cylinder liner reconditioning. Just experimenting with a few test liners before committing myself to doing Brian’s, and this is the result so far, but without being plateau honed as yet. 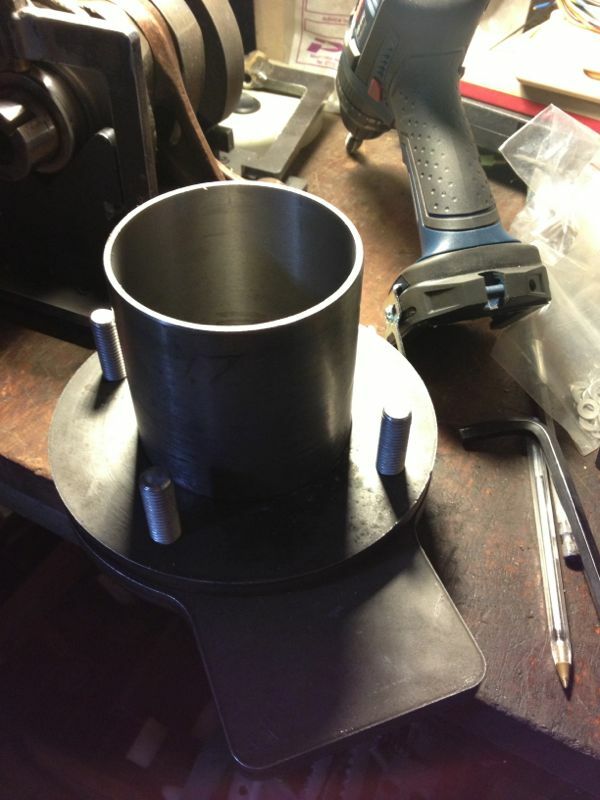 I am using the liner clamp rig I made last weekend to hold the liner and the bores are honing up nicely. 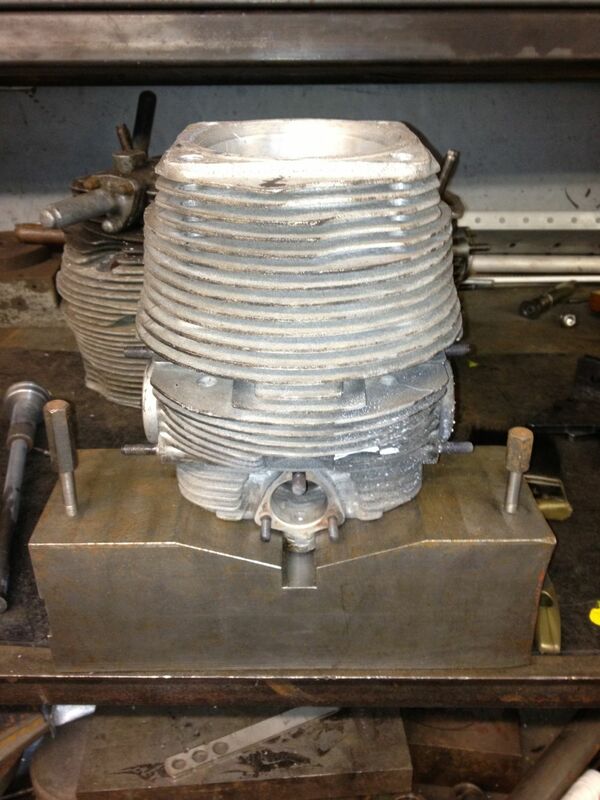 Now that I can bore the cylinder liners, I need to make a jig to hold the liners whilst they are being honed. If you use an annular ring clamp, a dummy cylinder, this will always squeeze the liner, and cause distortion,which is exactly want you don’t want. 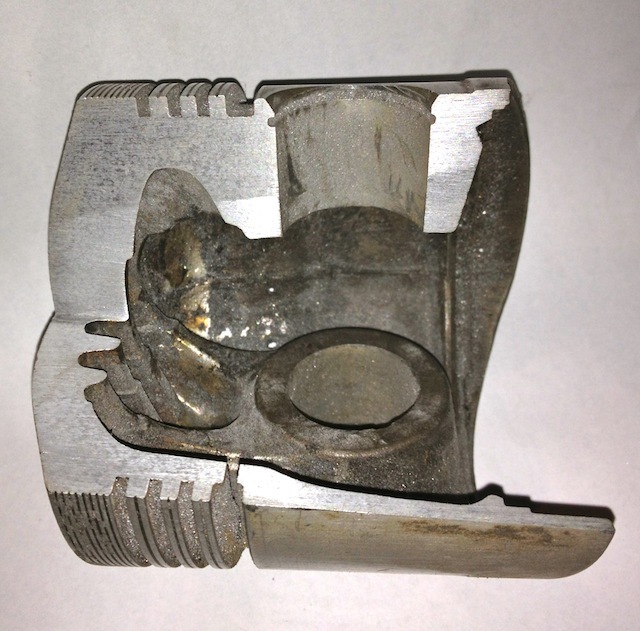 To get around this problem I have made an axial clamping system that uses the original abutments on the external faces of the liner. I drew the parts on the computer, and then had them laser cut from mild steel plate. After a few moments on the lathe, they looked like the sketch above, and a quick test with a previously machined liner and some oversize M12 screws, proved the clamping was secure and didn’t affect the internal bore diameter. 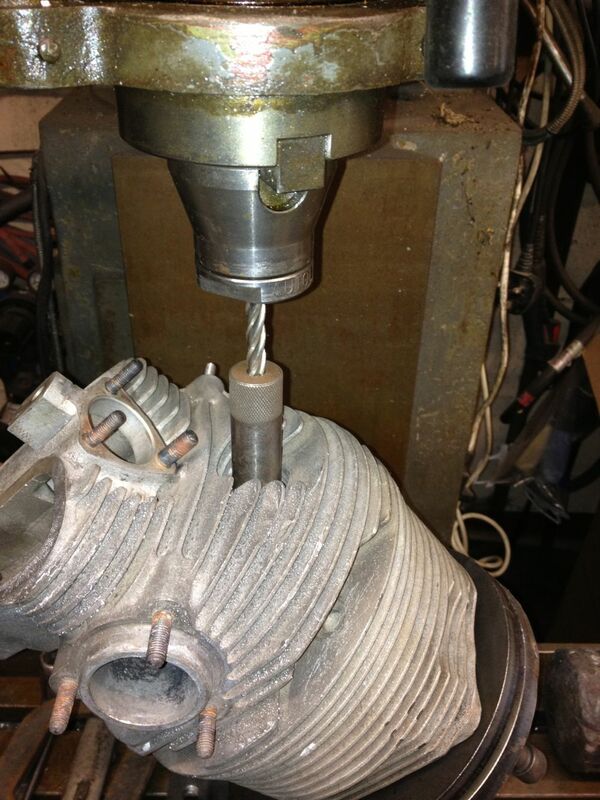 Hopefully, I should get the honing stones from the USA this week, and then I can transform the old worn cylinders in Brian’s engine, into perfectly machined and honed oversized replacements, that match the new pistons. As I said in my blog, it was a little too cold to work in the attic today, so I spent a few hours at the workshop. I had some bespoke round bar stock lying around, that I was planning on making a crankshaft truing tool, but I wasn’t ready to mess with crankshafts whilst I was doing all the liner related work. Anyway that is virtually done now, bar a phone call to the piston company, so it was time to jump on the Elliot mill, and make a new tool. 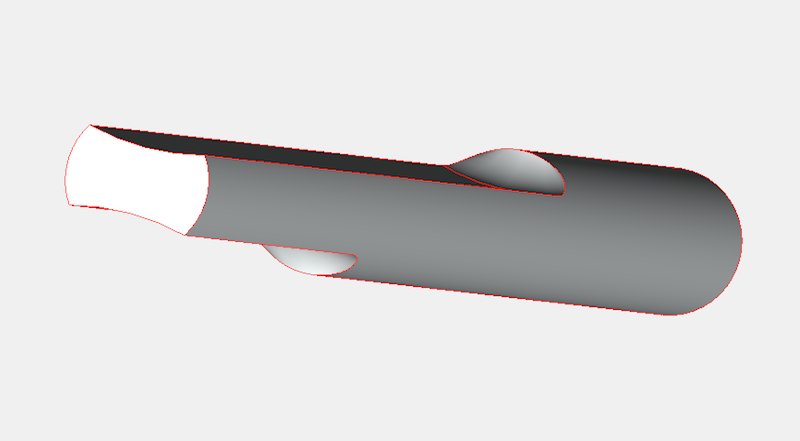 This is what I had in mind, but I was limited by what bullnose endmills I had, so I used a smaller radius than I would have liked. After a couple of hours, it was done. It took longer because I needed to keep checking by placing it in a crankshaft making sure I wasn’t taking too much metal away. 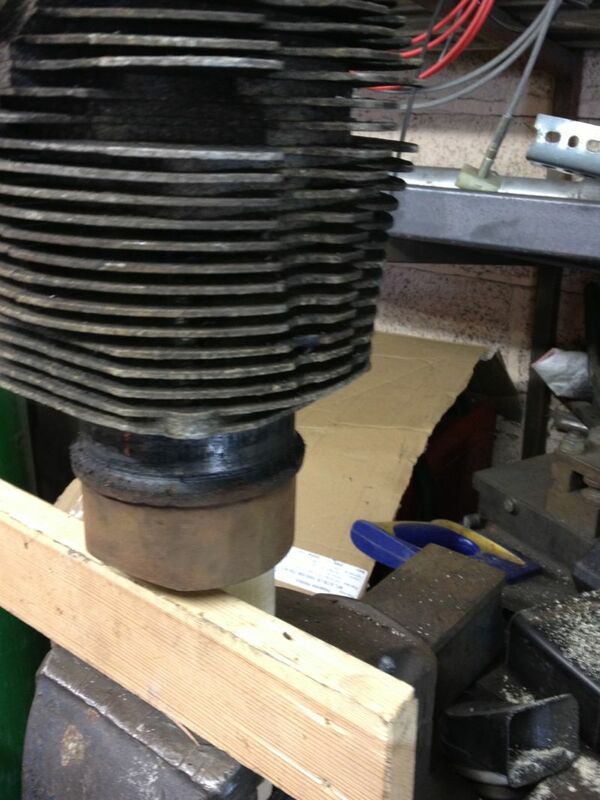 As I was making it I was testing it in Martin McClarence’s crankshaft that had turned. Fortunately it was the rear web that had moved, so I could refine the size of the tool to fit it. Imagine my surprise when i got home and tested Brian’s crankshaft, and I discovered this had moved ever so slightly on the front web. I knew the rear web had moved, but interestingly it had been pulled outwards, because the crankshaft was too long between the main bearings. I can only put this down to rear bearing movement, due to a shimming error in the rear bearing backplate, but this was assisted by the oscillating crank due to the misalignment. Anyway, the front web of the crankshaft is true now, after giving it a very hefty whack with the #4 Thor copper hammer, but the rear web is ever so slightly out. Next up on the crank is to press it together again, so the rear web has the correct connecting rod clearance, and then I’ll true the crankshaft up finally. As usual I have been working away, and work has been taking all my time, but today I collected some test cylinders from John Passfield. These were early Dyna ones, and I just needed the liners to machine. First you have to get them out of the cylinders, Panhard suggests using a U shaped gas torch, but to be honest any large roofing torch, or an electric fan oven will do it. The latter is a no no if it is in the house, as the old oils etc leave a nice odour that Febreze won’t shift! 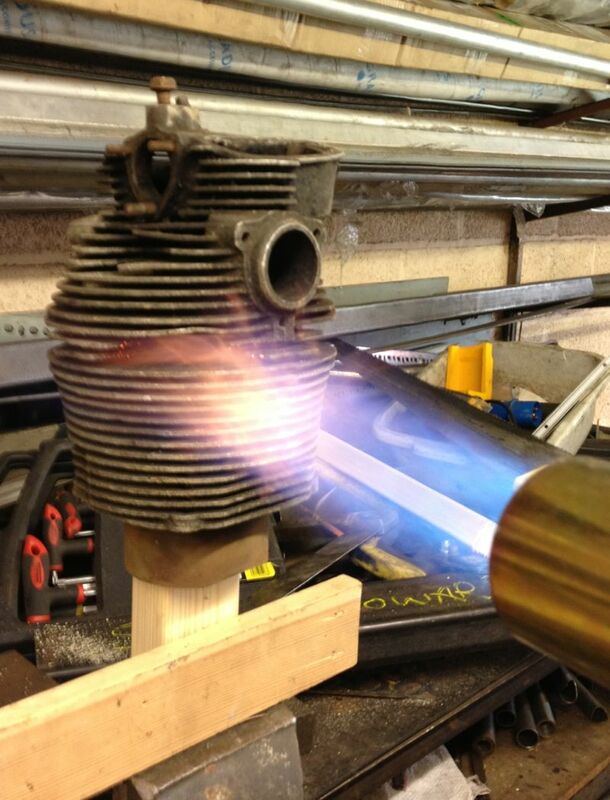 So after placing the cylinder on a lump of wood, clamped to a vice, using a large soft flame aim for the area around the finning where the nuts go onto the crankcase studs ( the metal is thickest around here), and keep moving the flame around the cylinder to spread the heat evenly. After a minute or so, the liner will drop partially and that’s why I have a piece of wood below, for it to land on. In realty it doesn’t drop to far, as the liner tends to stick to the wood, but if you tap the cylinder, it will drop clear of the aluminium cylinder. Easy really, but they will be VERY hot, so be careful and wear a heatproof glove, and let them cool naturally, which was easy today, as it was 2ºC outside. Today I measured the capacity of the OEM Double Sump pictured below. This sump extension increases the sump capacity by 1.1 litres and assumes no intrusions into this volume. History suggests there should be an extended oil pick up, or double pump arrangement fitted, which would reduce this further. It still represents an increase of around 50% over the standard oil capacity, and was a major factor in why the racing Panhard engines lasted longer. 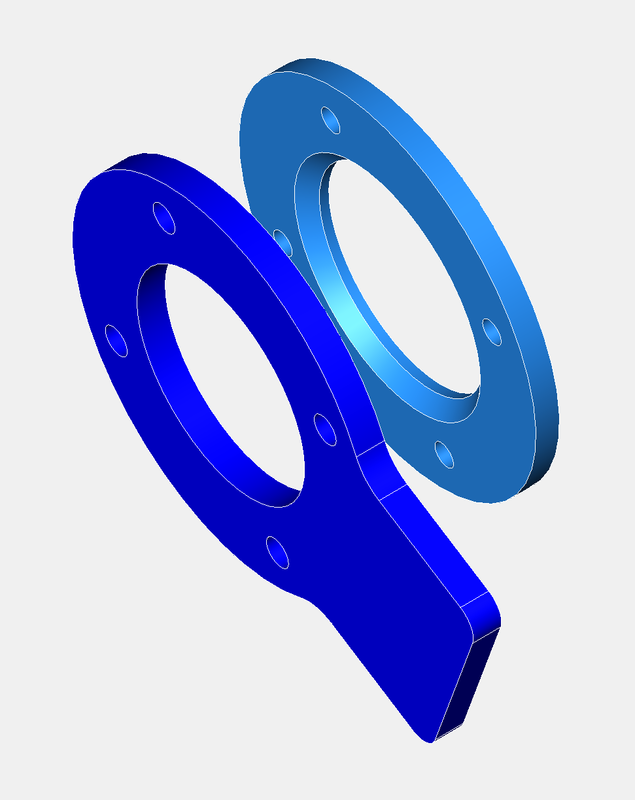 I have also included the thread specification for the cast boss, as you can use this and get adaptors to take various types of oil temperature senders. You can also buy an extension piece that lowers the original mesh type filter, and a pick up pipe extension for the double sump conversion pictured above, so it can take advantage of the cooler oil. 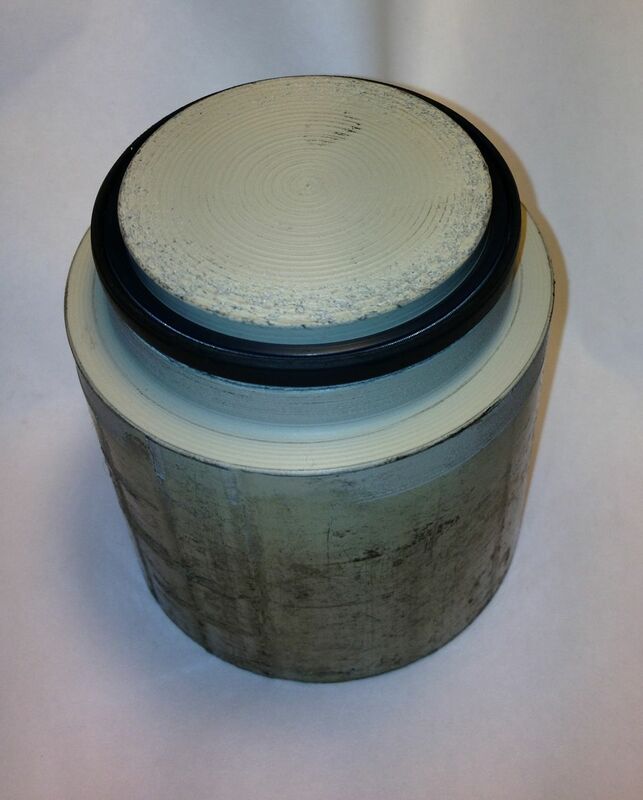 However, why you’d want to use the OEM mesh filter is totally beyond me, as roller bearings need clean oil with smaller particulate contamination than shell bearings to maintain their reliability or prolong their life. 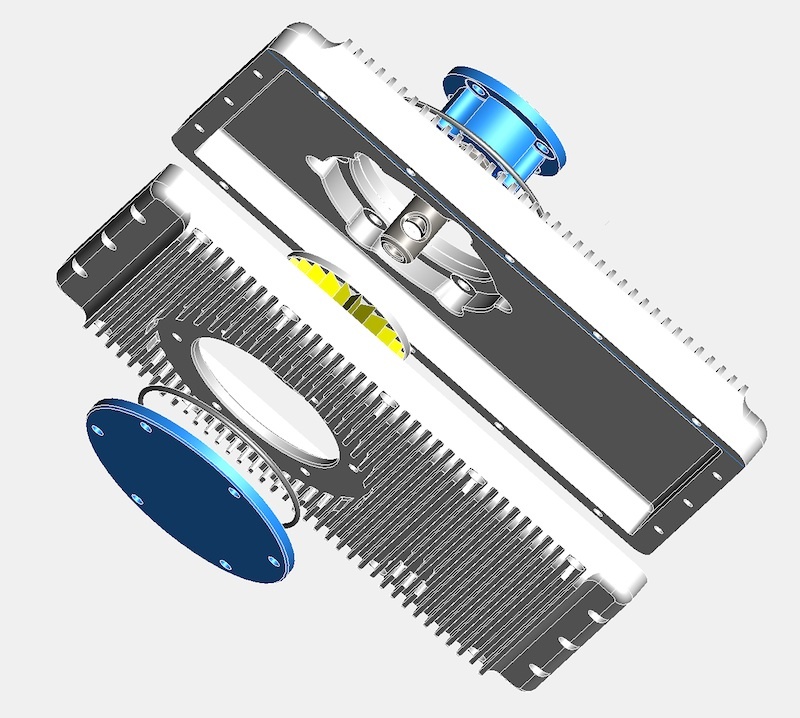 This is the latest CAD for the double sump filter kit that is being manufactured. 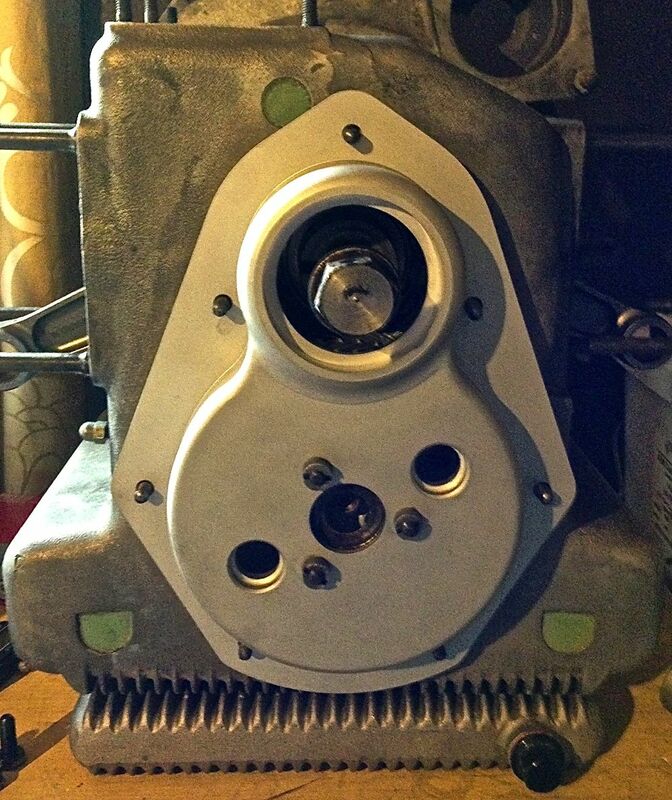 It combines the proven baseplate from the original filter kit, with some new parts for the factory double sump & OEM oil pump application, and this new version will be fitted to Brian’s engine. 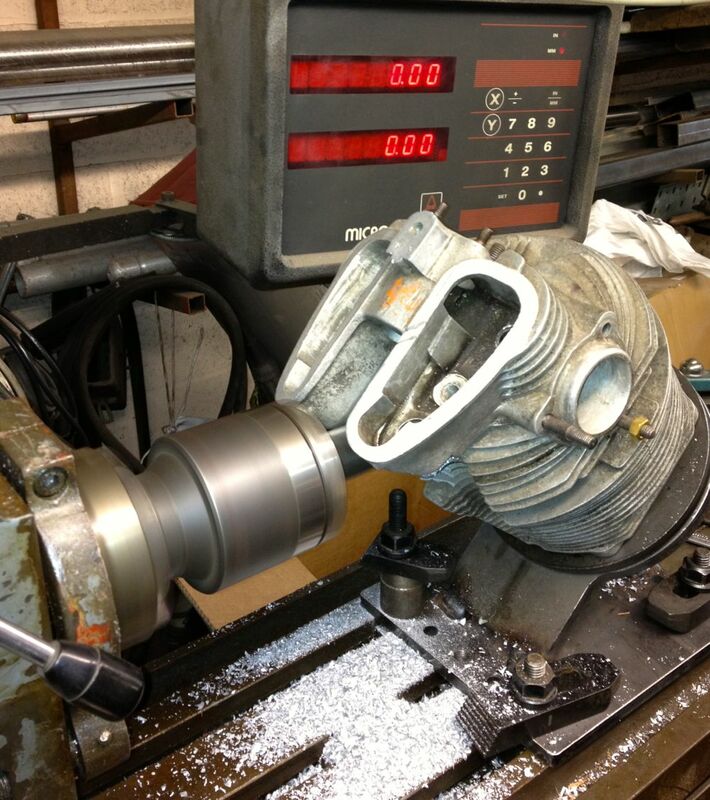 Just had an update from the piston company, and they have sent me a grainy picture of the piston part finished. The underside still needs machining, and the barrelling etc is still to do, but it’ll give an idea of how much shorter & lighter the piston will be. I am going to improve the oil capacity on Brian’s engine, and as a stop gap I have bought one of these, which incidentally was also fitted to Ron Tyrrell’s engine. When it arrives, I will measure the oil capacity increase, and make a new filter conversion kit to take the revised filter cartridge, but all I am doing here is going over the old work I did on engine #4. 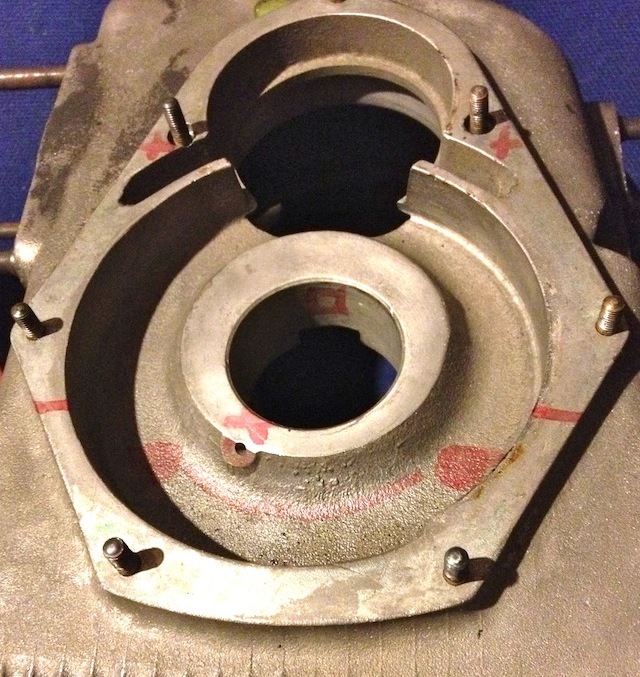 OEM double sump casting pictured above, with no sump plate fitted or oil drain plug. This conversion helped increase the reliability of the race engines, and was standard equipment for any modified engines. The picture below represents an improved version, that I hope to make in the next few months. Another couple of busy weeks at work, and a bit of metal from the laser cutters has arrived. The first batch of parts were for modding the engine dyno rig, which will be need to test the Panhard engines, and the second batch are for the Whatton boring bar adaptor plates to the Elliot mill bed. Earlier I was going to make a bespoke centrifugal clutch to isolate the inertia roller from the crankshaft sprocket, but in the interests of simplicity, I decided to remove the turnbuckle that loaded the motorcycle wheel onto the inertia roller, and replace this with a quick release tensioning mechanism. 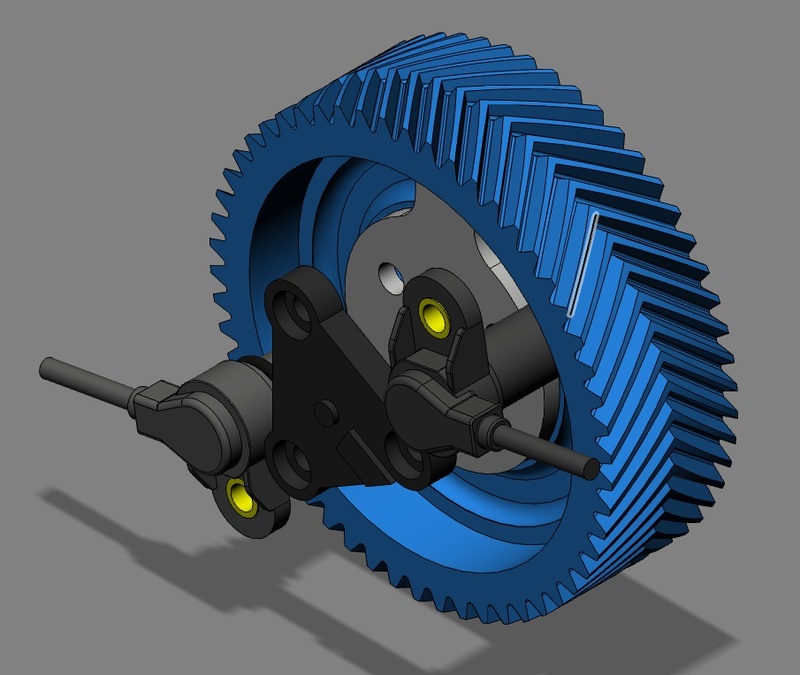 This would allow me to manually unload the engine from the dyno roller for starting and also at the end of the dyno run, just like the centrifugal clutch would do, but without all the teething problems from a bespoke design. I still have to make a chain tensioner, but the pictures below show the unloaded and loaded positions. The wheel is loaded by pulling the T handle to the right, and simultaneously pushing the ball ended lever inwards, which disengages a sprung loaded pin from a series of circular holes, and allows the tensioning lever to move to a new position. I created an even further stop to jack the wheel clear of the frame base, so that I can manoeuvre the rig around the workshop floor. Hopefully tomorrow, I can bolt the Panhard engine up to it, explore the tensioning options, and try and draw something up for the laser cutter. As the piston is being finalised and the Whatton Boring Bar is nearing competition, I decided it was time to concentrate on the cylinder liner reconditioning processes. The ductile iron liner is removed with copious amounts of soft heat from the one piece aluminium cylinder and head, preferably in an electric oven, although you’d best wait till the missus has a day out, because the stench lingers. 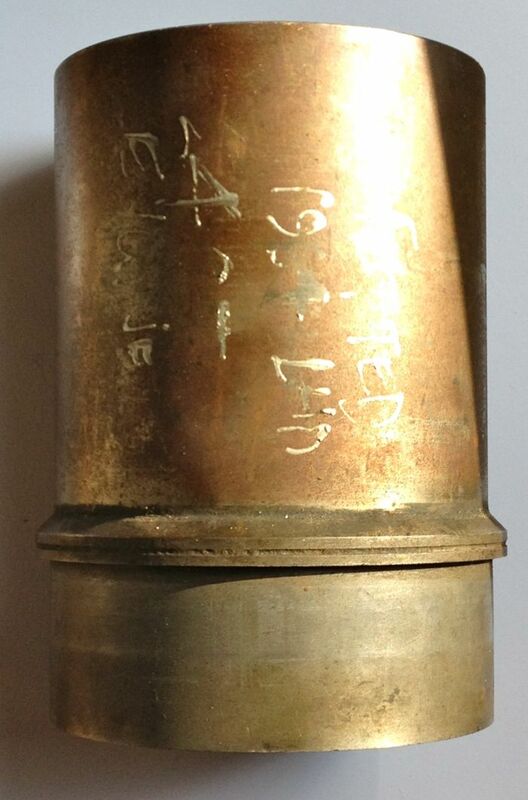 The Panhard documentation uses a U shaped gas torch, although to be honest any big flame gets the job done, just don’t get giddy with an oxy acetylene torch, as aluminium goes plastic at around 550ºC. 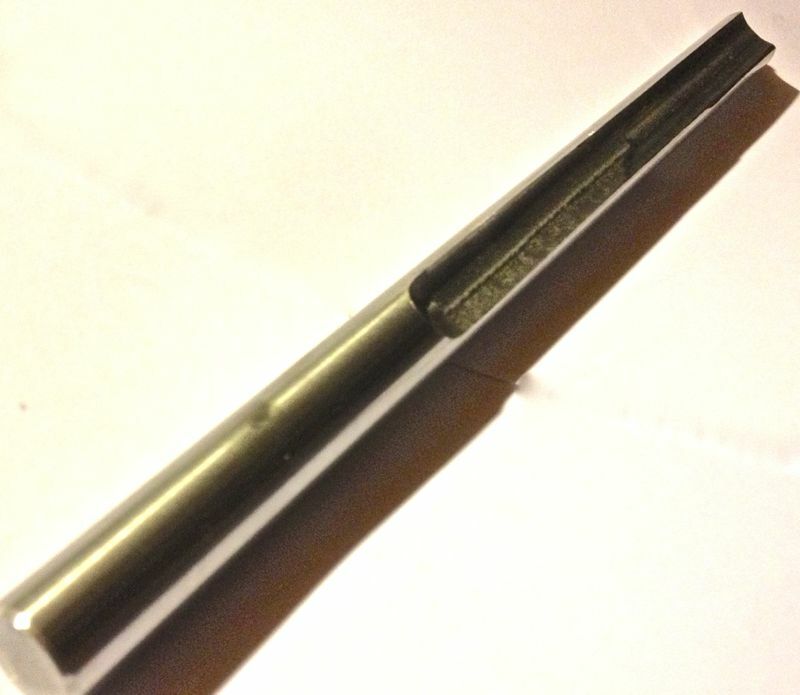 The longer portion is an interference fit into the cylinder shown below. In order to bore the cylinder liner, I have to make a support plate to hold everything perpendicular and true, and as I don’t want to be crawling at low level, I am going to fit this to the Elliot mill bed, using T slots and fasteners. The Whatton would normal be attached to the inline cylinder block, and everything bored in situ, but this wouldn’t be possible with a flat twin Panhard engine. Here’s the plates that I will get made up this week all being well, that’ll convert the mill to a boring table. I need to space the Whatton off the mill bed some more, to allow for the micrometer to affix to the boring head, which is why I have used two plates. The liner will affix to the underside, depicted in yellow in the picture below. 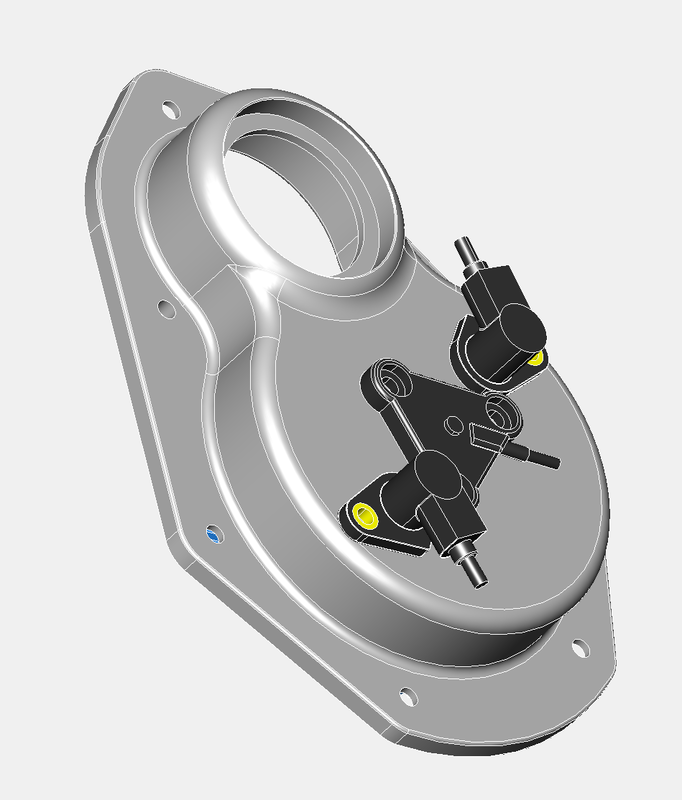 The clamping system envisaged using the standard abutment detail, four studs (shown in green) and a skull cap to hold the liner in place, although I might use a cam lock system around the flange detail. The maximum feed rate is 3 thou per turn, and by modern standards very slow, so the reactive forces will be small too, and the 25mm & 15mm plates should be more than adequate for the task. However, if there is an issue with the cantilevered portion, I will attach an A frame to the underside, and there is an allowance for fixing this in the 25mm base plate. 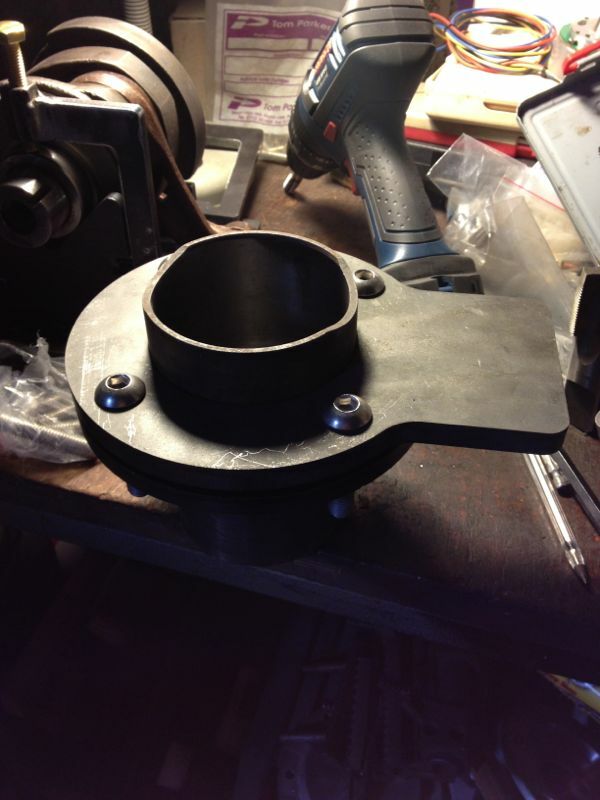 This is the latest iteration of the high compression Panhard piston that I am having made for Brian’s engine, and it will be substantially lighter than the OEM set up, but there is a slight compromise with the weight, because I want to use the standard cylinder and liner positions. 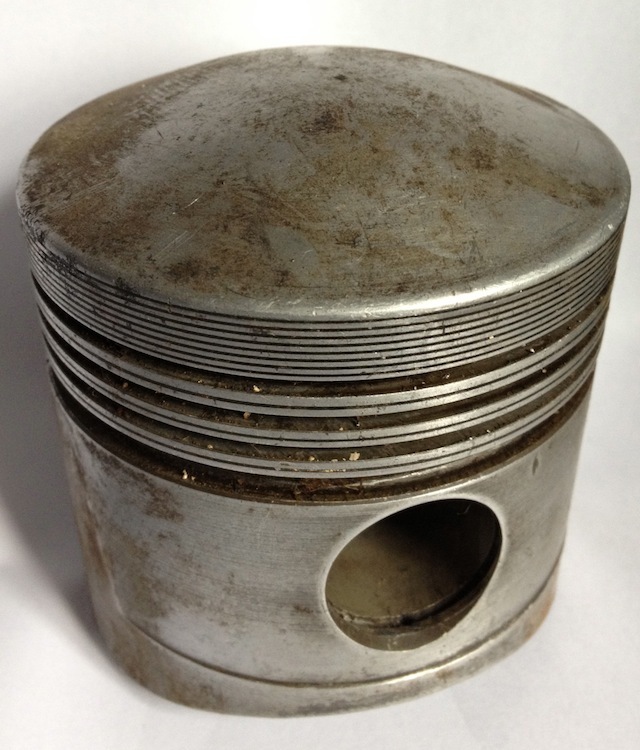 This piston will be used to modernise & improve the standard flat twin engine, and be a suitable replacement for the majority of the air cooled Panhard engines. It will need a new piston pin bush to cater for the standard crankshaft, but this is required whatever parts are fitted to the engine, as the original set up leaves little to be desired. This piston set will include a fully floating pin with improved lubrication to the piston pin bosses via cross drillings from the behind the oil control ring. As the piston offers a higher compression over standard, I will be making some conversion shims to lower this for owners that want to run the standard ignition & carburation. I have ordered a minimum set of pistons today, which is 12 number or 6 sets in total. The price for this batch has been fixed at a special developmental price, the next batch will cost £350 for a complete set of two pistons, rings, pin and clips. They are expected to arrive around the 18th June 2012, and I will add more details as I get them, but the picture above shows the basic design. 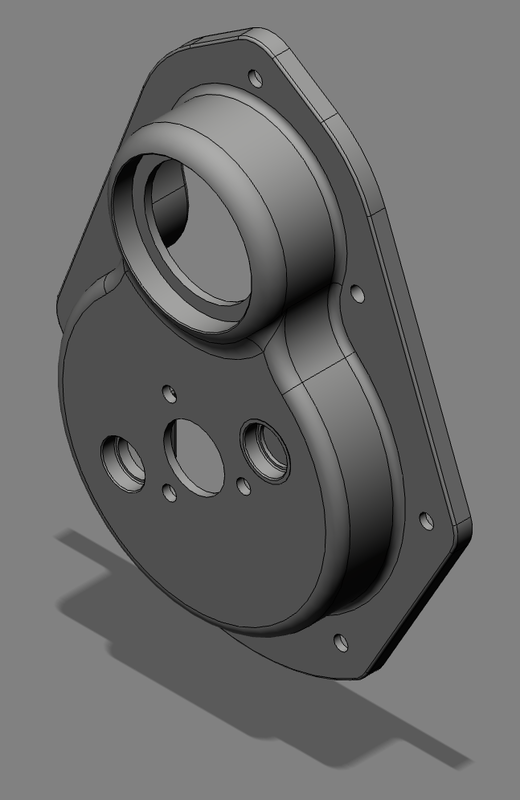 The actual piston is based on a 1950’s car forging, uses readily available motorcycle rings, but the cylinder bore will be 85.3-85.4 mm, depending on the ring set I can get for this batch. 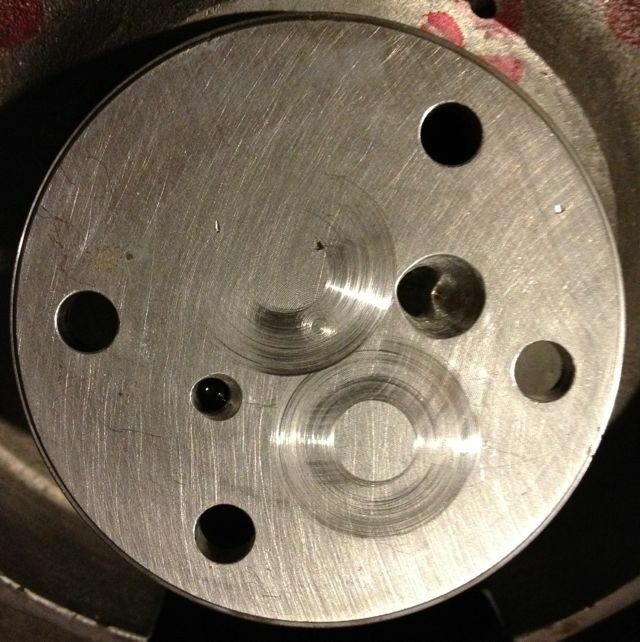 They will be higher compression capable, lightweight 3 ringed pistons, with a 3/4” or 19.05 mm pin diameter. 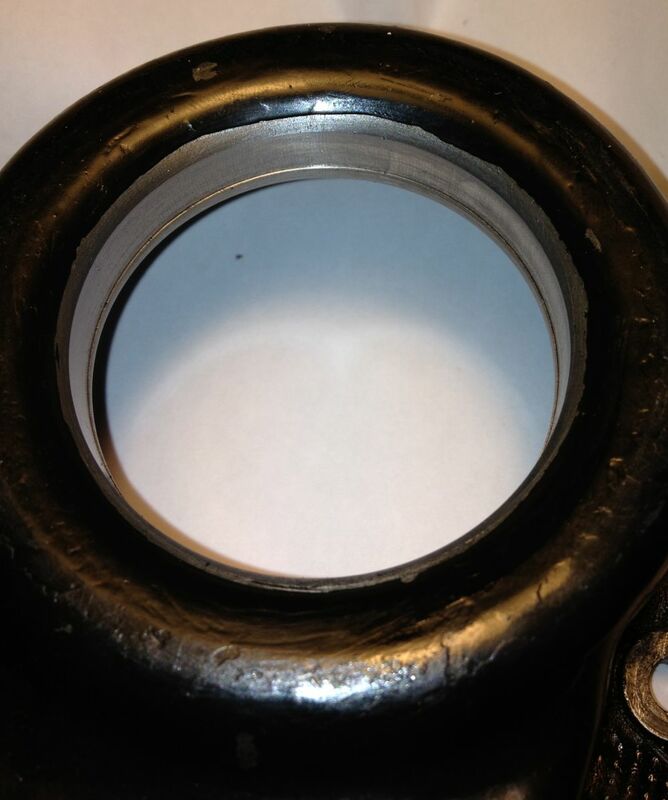 This will require a special interference fit conversion bush to be made for the connecting rod little end, which is an additional cost item for the early adopters. I managed a little more of the engine, after getting sidetracked with the Whatton Boring Bar. 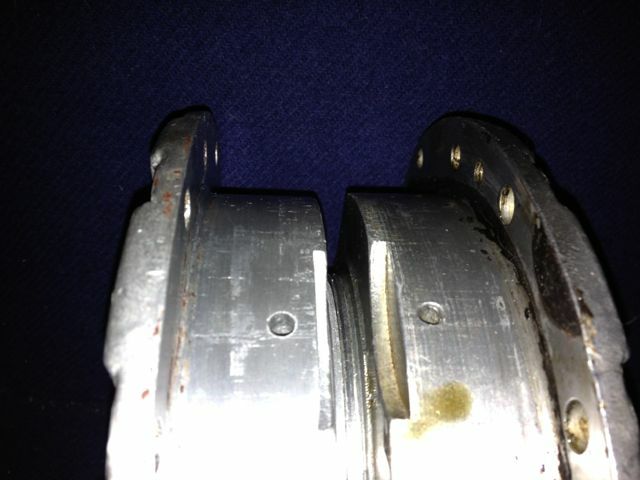 Here’s the older design M6 on the left, and the newer M8S rear bearing support casting on the right. 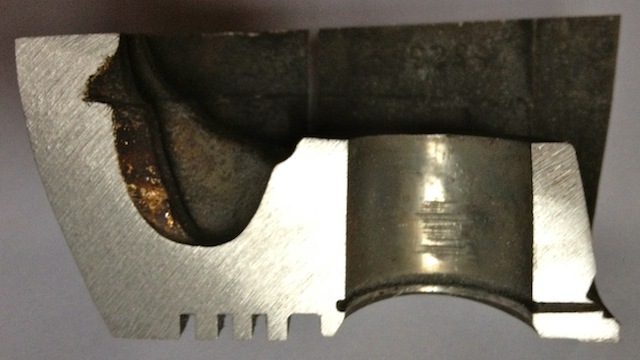 There is a difference in hole diameter at the inlet, and more of a restriction at the other end too. The hole has been smoothed and with a dummy bearing fitted you can see the difference in surface area, versus the older design underneath. 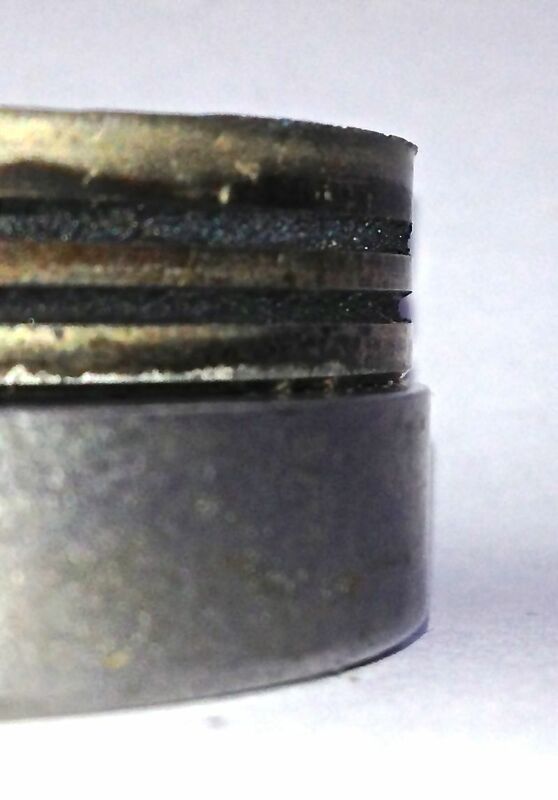 What is not apparent is the hole is only 3mm in diameter just under the bearing on this M6 casting. With the improved design of the oil circuit, especially the mod to the camshaft gallery, more oil will flow into the bearings and also be at a higher pressure. Next up the oil light piston and the rear seal mods. 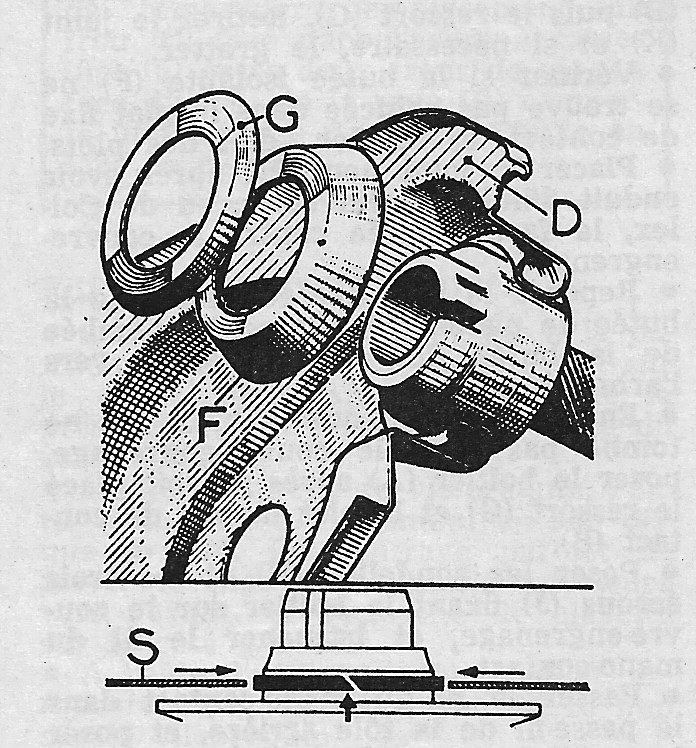 Panhard pistons are quite heavy and bulky items compared to todays’ equivalents, examples shown below, but that’s because the piston has to be domed to make the compression high enough due to their hemispherical combustion chamber layout, whereas modern day pistons have minimal surface areas applied to the piston and combustion volumes, thinner rings and latterly thermal coatings, which allow for even thinner sections. 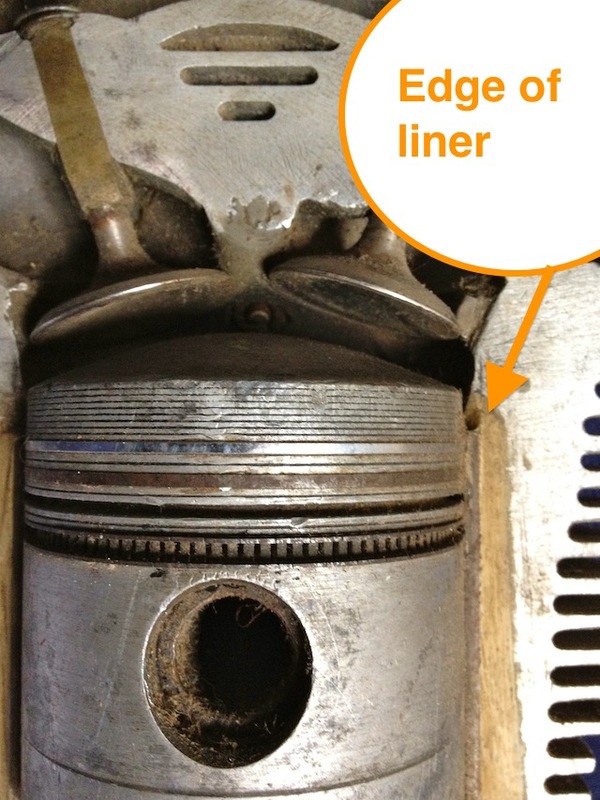 The biggest limiting factor is the close proximity of the top ring to the end of the steel liner, and as shown below the top ring is quite far down the piston, around 10mm from the top deck. These engines are from the junk pile, but they still have their uses, as this piston was cut up to show the typical cross-sectional areas that exist within the original. 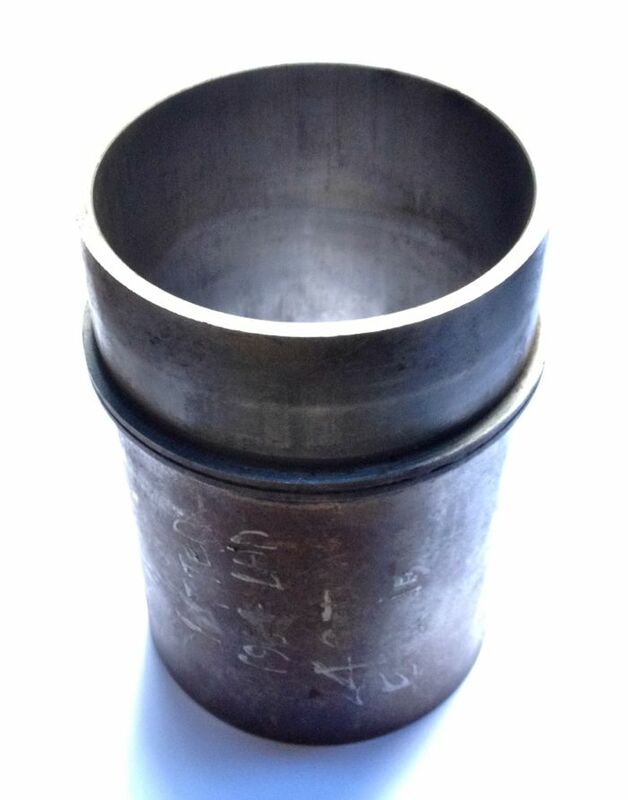 There are more than one type of Panhard piston used in the flat twin engine, but this is the later 4 ringed type, that was cut up today. Why is this done? 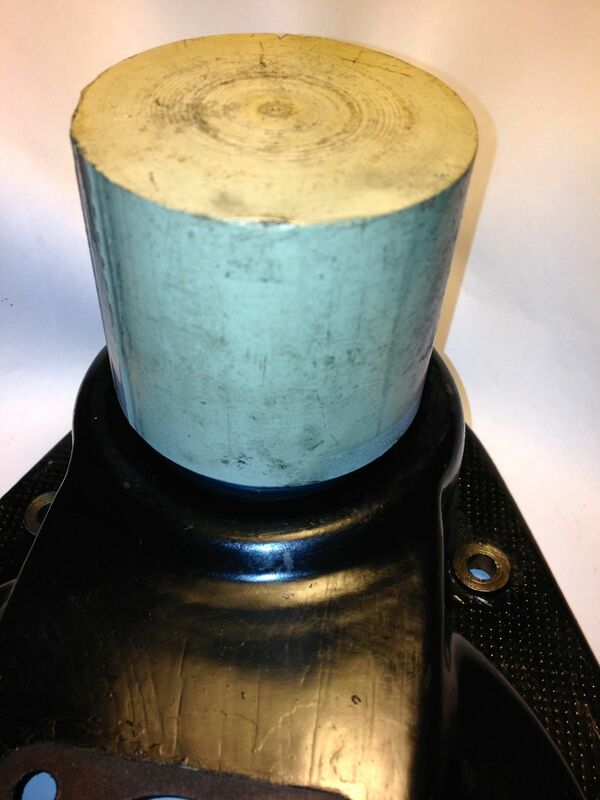 I need to understand why the naked Panhard piston weighs 505 grams, when my target weight for a heavily domed piston is sub 400grams, which is double the weight of a single cylinder Supermotard piston from 2002, and probably three times heavier than a complete MotoGP piston! I need to replace the pistons and rebore Brian’s cylinder, as this engine will represent a rejuvenated and refreshed Panhard engine using mostly OEM parts. The original pistons are only available in certain sizes, and the design of them isn’t really good practice nowadays. 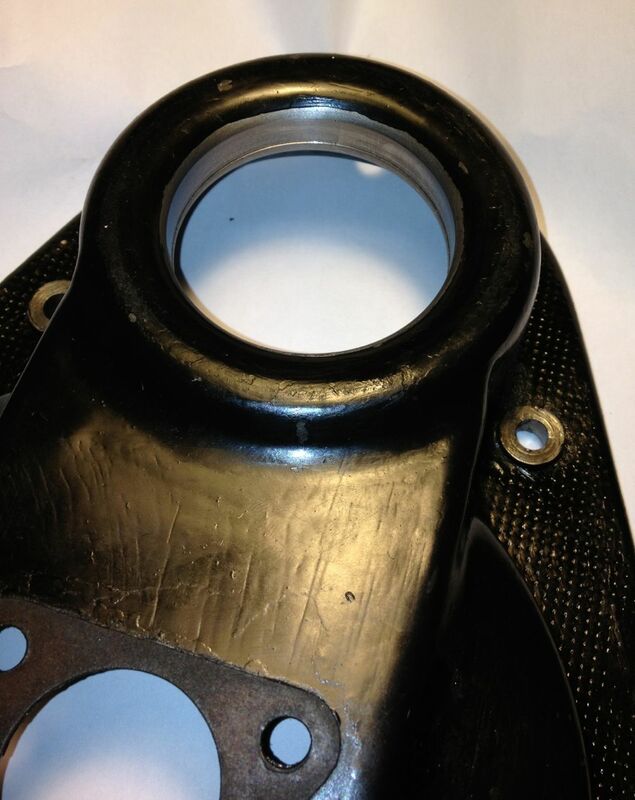 There is little that can be done about the domed area or the piston pin position, because these are factors of the combustion chamber, and also the crankcase limits using longer rods. Obviously you can shorten the cylinders, but it is a lot of work, that few people will want to pay for. Under examination, it is fair to see that the tall & shallow OEM ring construction is at odds with the more modern thin & deep thinking. 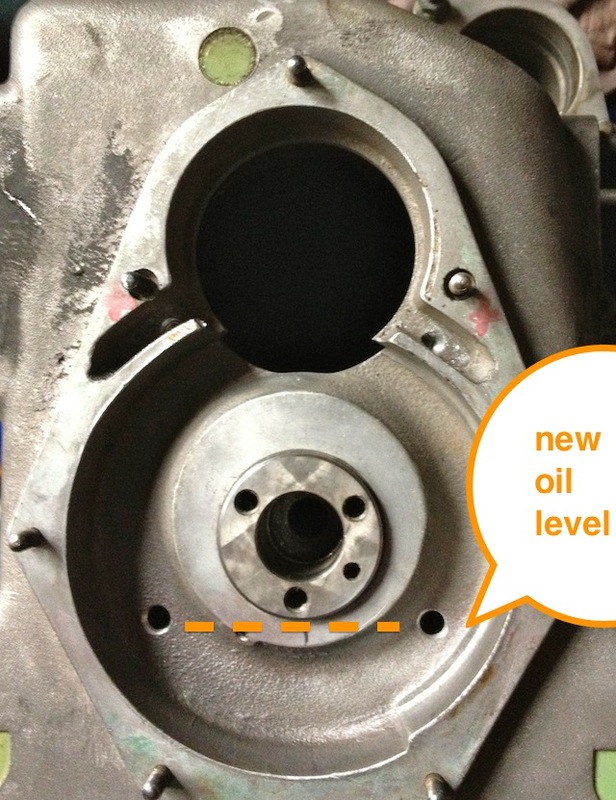 The oil scraper functions have been analysed and there are several upgrade options that can be used too. 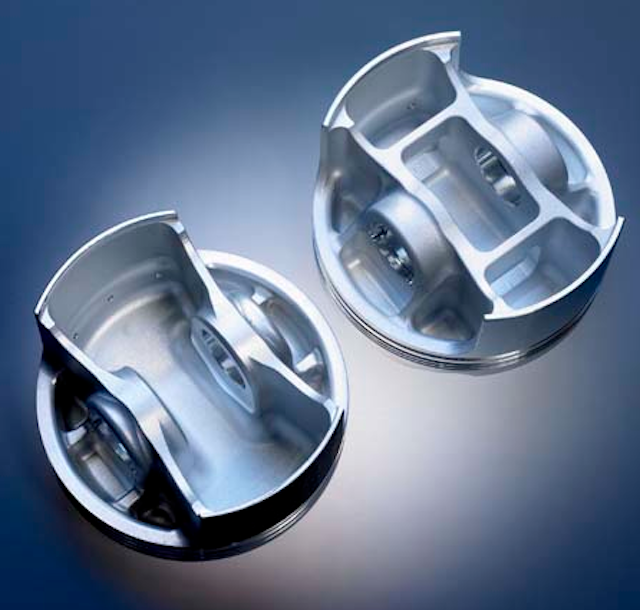 Piston skirt design, and gudgeon or piston pin location strategies have all changed, as well as different materials and coating technologies, which all enhance performance or give longer life when used in marginal conditions. 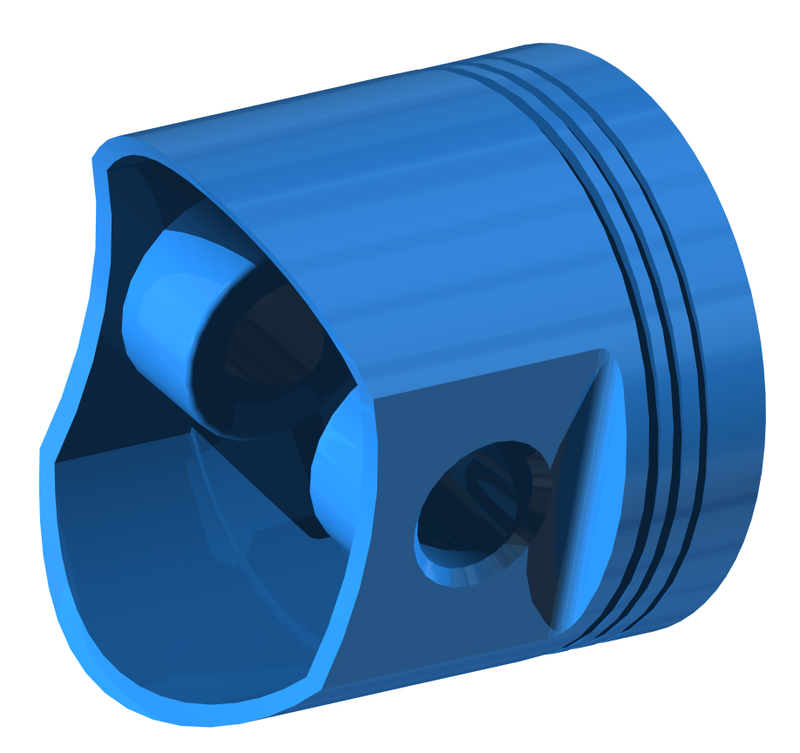 So ideally finding a modern day piston that would fit would seem to be the answer, but although I have known about several pistons that I can use, they all have potential issues around the top ring placement and the fixed liner. On reflection it would be more logical to design a replacement then, but what benefits would this give? Obviously, this will give a slight capacity increase, as you are essentially reconditioning the standard Panhard liner, which has a finite thickness, but what about the tapered bores. Hmmm, we’ll pass on this for a minute while considering other points. Fundamentally the piston should be a lot lighter, which will reduce crankshaft loads and prolong the life of the rotating elements at higher rpms. The ring technology has changed, so these get lighter and generally use combustion pressure to effect a seal. 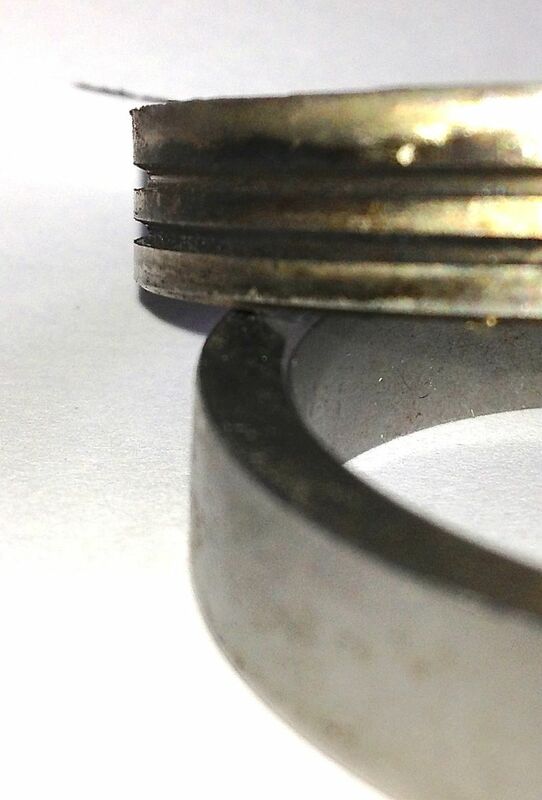 The thinner rings also have less friction and can reduce crankcase compression blowby, but the cylinders have to be finished to a higher standard for the rings to seal correctly. 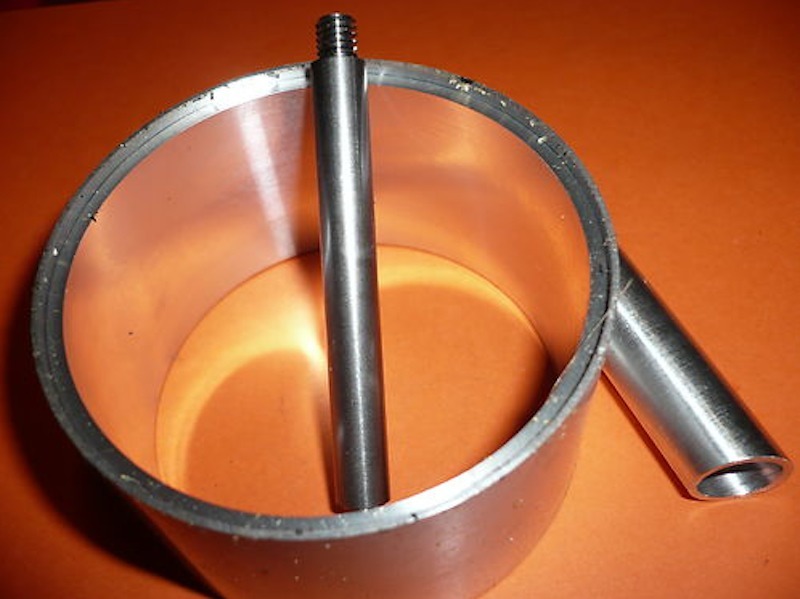 There is a possibility that an offset piston pin can be used, which reduces piston noise when the engine is warm, and more importantly reduces the shock loading on the connecting rod, by spreading the reciprocating load changes over a fractionally wider area of rotation. 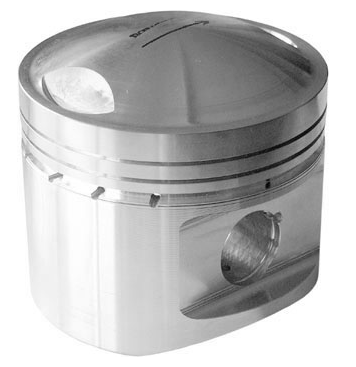 The slight offset or bias to the exhaust side of the piston also reduces cylinder bore wear, but this is not used in racing, because the engines are maintained more frequently, so most forged pistons don’t use this. 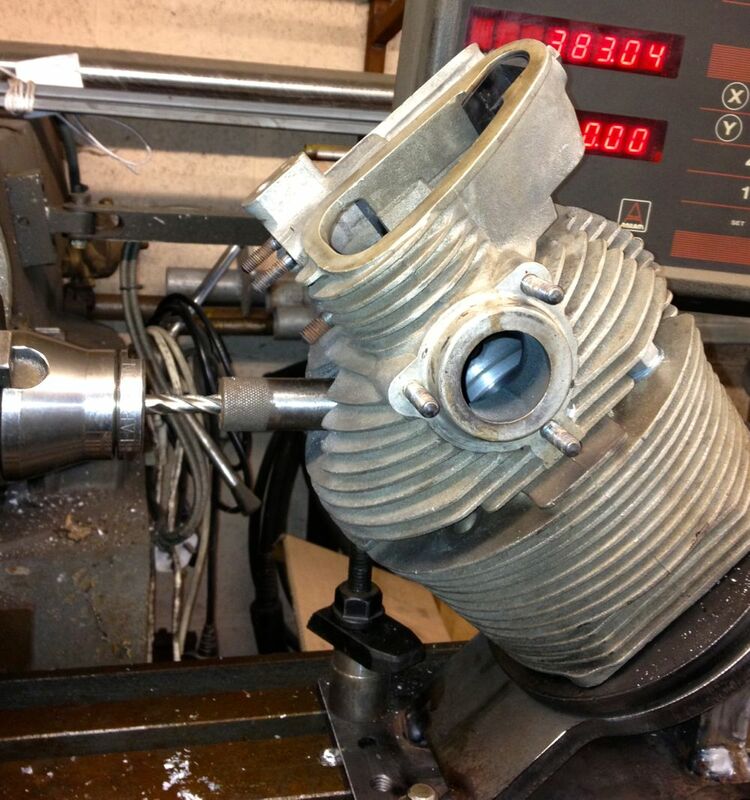 In fact there are a few ways of achieving the same, Honda offset the cylinder to achieve something similar, and piston manufacturing companies use assymettric profiling of the piston surfaces. 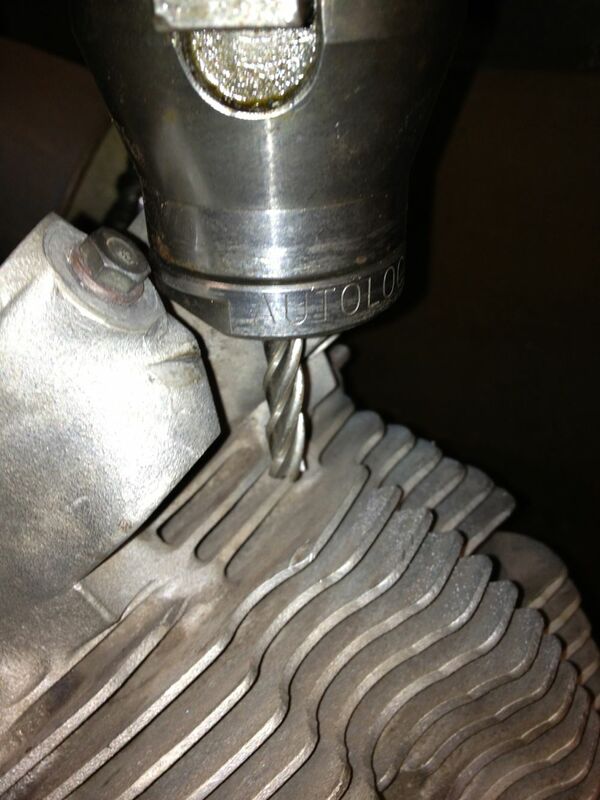 In fact, piston pin offset is regarded as old hat, like trying to use side valve technology in an OHV engine! 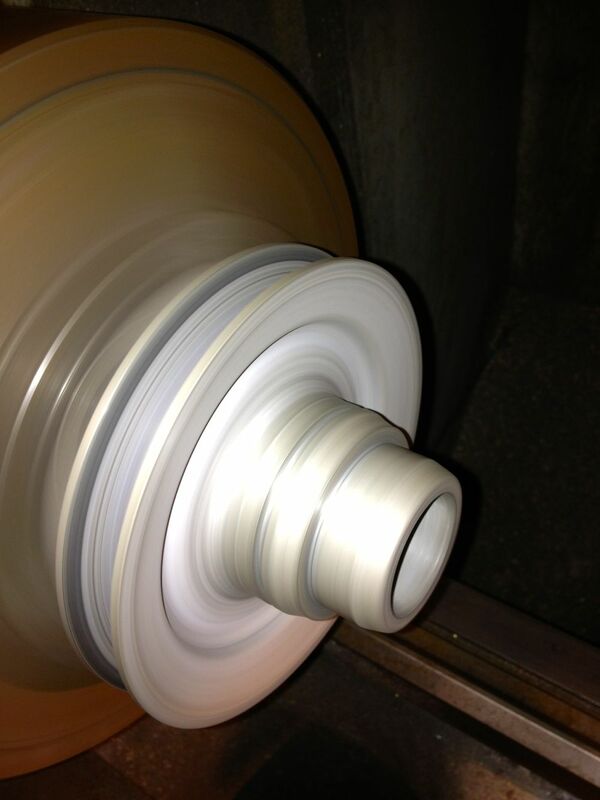 Lastly, there is a wealth of coatings technology that can be applied, although this does add expense to the final product, it does offer protection from nasty combustion events, and does improve reliability in more highly stressed applications. These doodles are some of my thoughts from today, and obviously I can reduce the sections some more, but the target weight of sub 400grams looks like it will be achievable now. I need to do some finite element stress analysis to take it further, but hopefully those following this will understand the direction the engine is taking. PS The tapered bores will be for another blog post. I was going to remove the rear NU209 main bearing on the engine, but needed to make a small adaptor to measure the end float on the crankshaft before I do so. 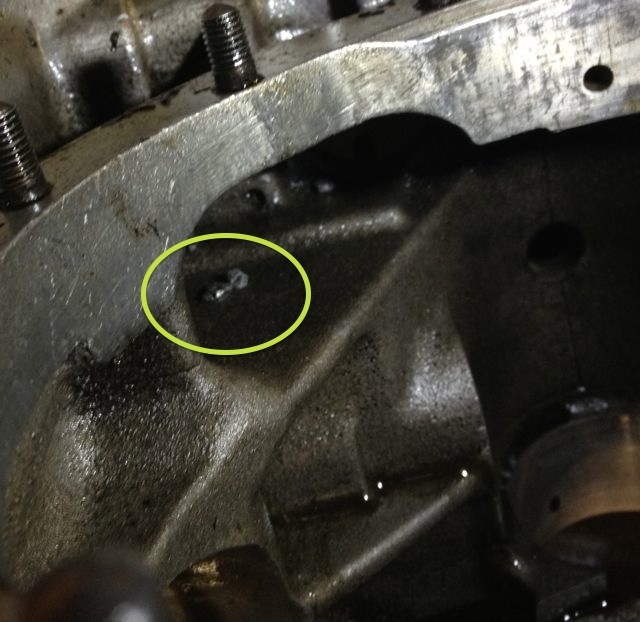 This particular engine has a little bit of movement in the rear crank pin, and I need to find out why it has moved. The early M6 back plate is on the left and the later M8 is on the right. 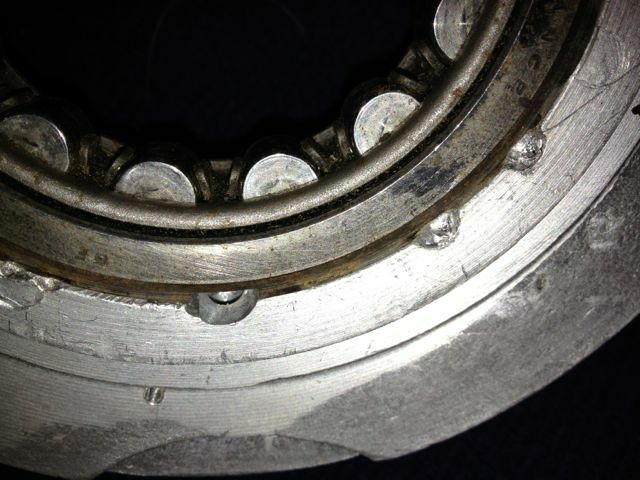 The holes are bigger on the later one, which means more oil can be supplied to the rear bearing. 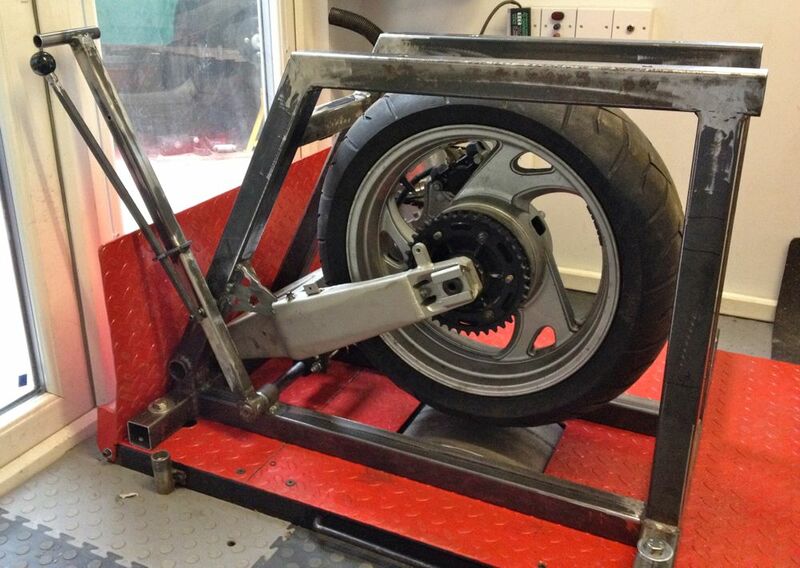 After measuring these it equates to an improvement of 15% over the earlier design. 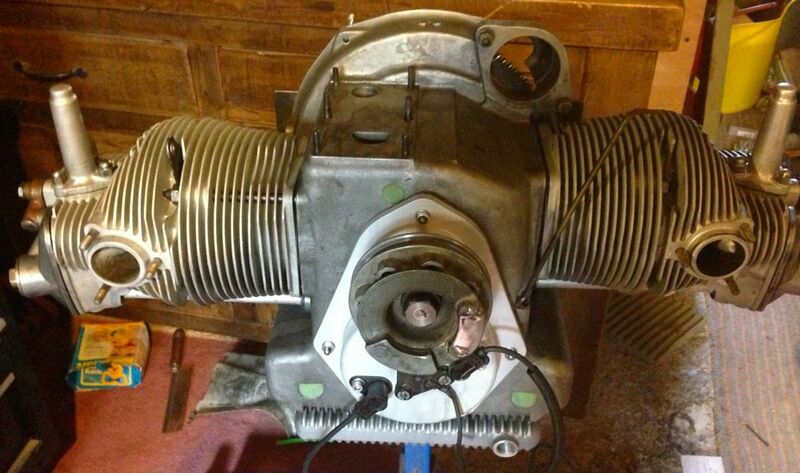 Brian’s engine will be increased further still, to match the front crankcase drilling. In the meantime I am waiting for another plate as Brians is damaged around the rear seal area, and it looks like something, a fastener possibly, has got between the flywheel and the rear plate! Next up to bring Brian’s engine up to date with the oil supply modifications is restoring the earlier oil supply method, but this time bypass all the negatives. The later engines didn’t have this option, as can be seen here. 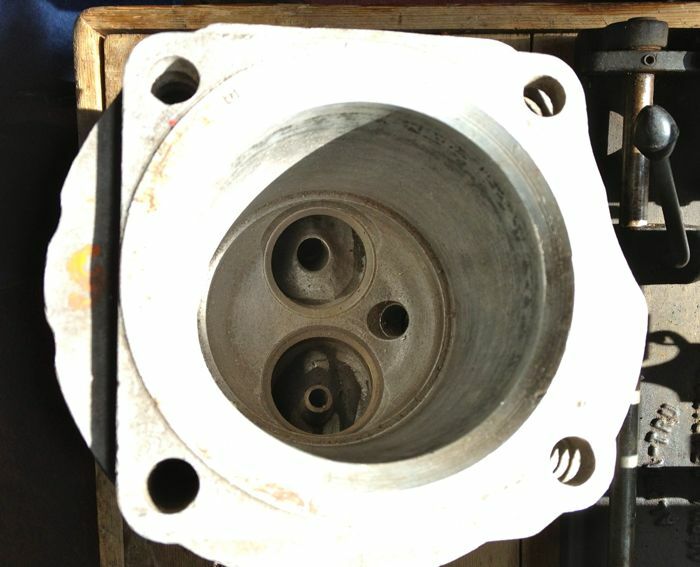 The original engines had this oil feed visible above the camshaft bore at the very front of the crankcase, which is shown below. 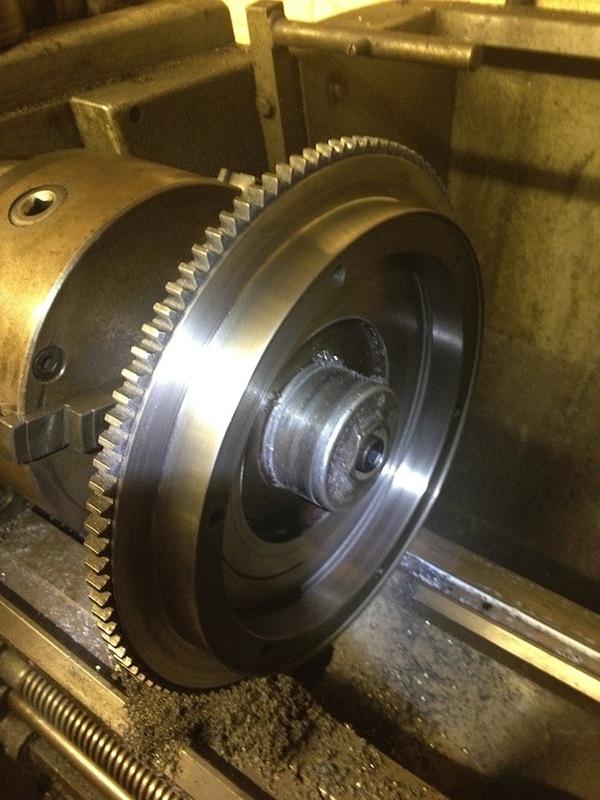 As the camshaft rotates this drilling is filled two times per camshaft revolution, and after this it passes underneath the bearing and jumps into the slingers. 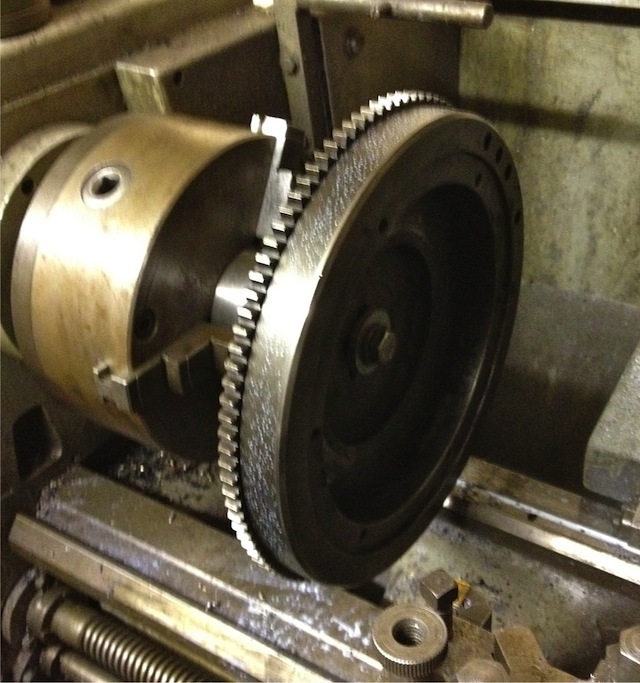 Some oil splashes back and passes through the main bearing, but the rest is accelerated by the slingers on the crank web, and passes through the big end bearing before exiting and splash lubricating the little end. Unfortunately this hole is too small, and it led to a 50% reduction in flow rate over the rear, which is why I mod the front like so. It might not be obviously apparent from the picture, but the hole size is now 6mm diameter, whereas the one above is just 4mm, so you are looking at a two stepped drilling. 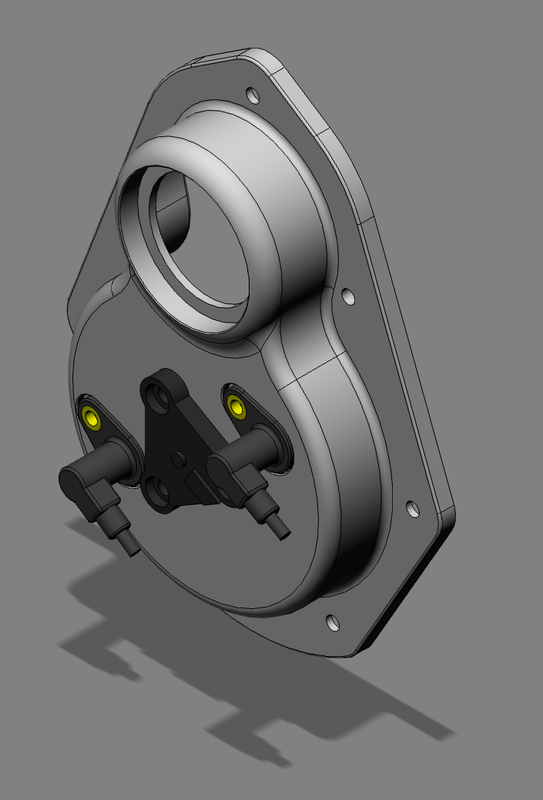 This new oil feed now matches the camshaft aperture, so that all openings, front and rear are timed equally at the rotating surfaces. 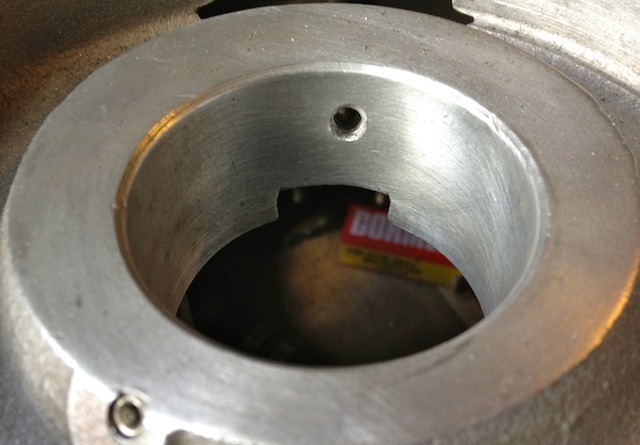 The 4mm diameter hole of the earlier design will have to be enlarged to 5mm, as the rear oil feed is actually 5mm in diameter internally, but at first it is more important to get the hole in the right position, and work from this. 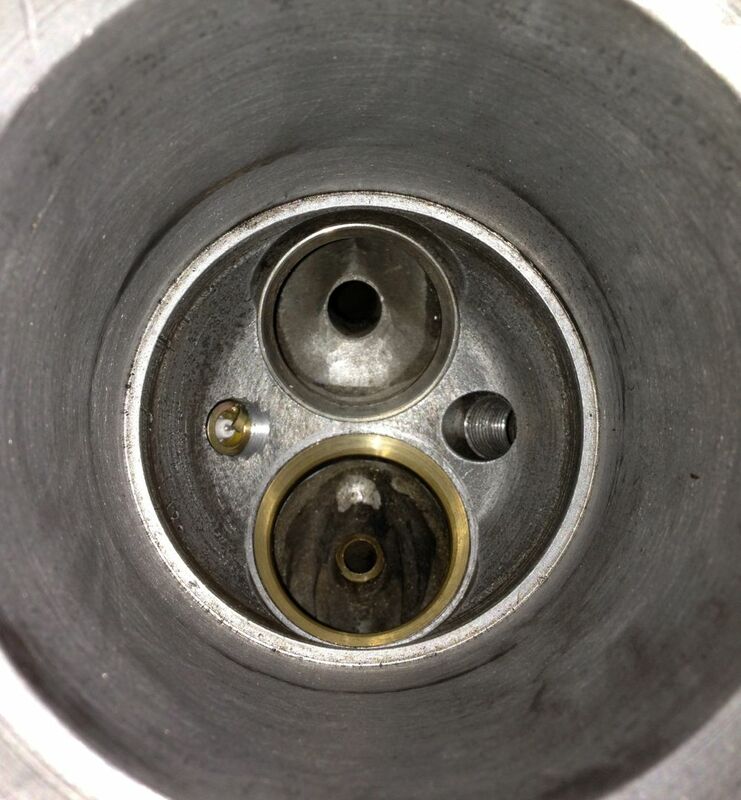 The internal oil feed pictured above now opened up to 5mm diameter, which is 50% bigger than the OEM drilling on the earlier engines. This new size matches that of the original rear bearing feed, which should equalise the flow rates. 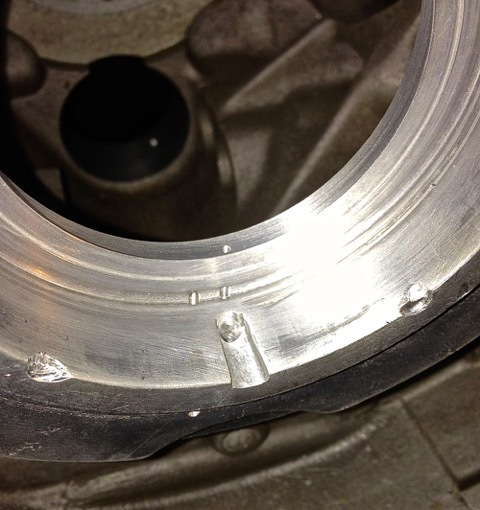 Next up, modifying the aluminium rear main bearing support casting to take a double lipped oil seal. 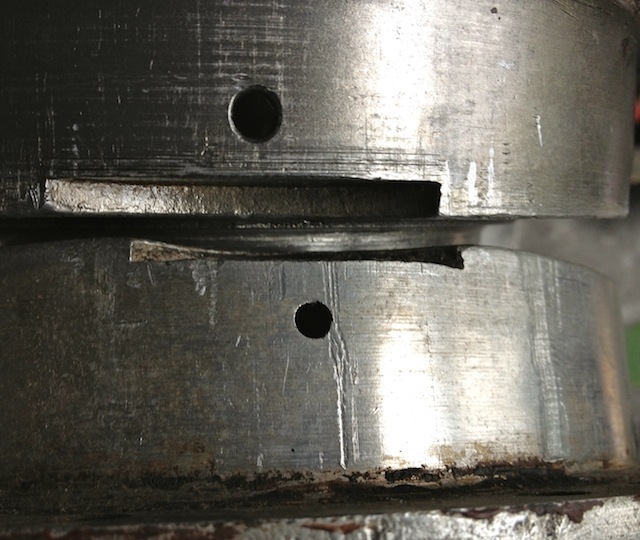 The step is removed by tapering the hole from 6mm to 5mm. 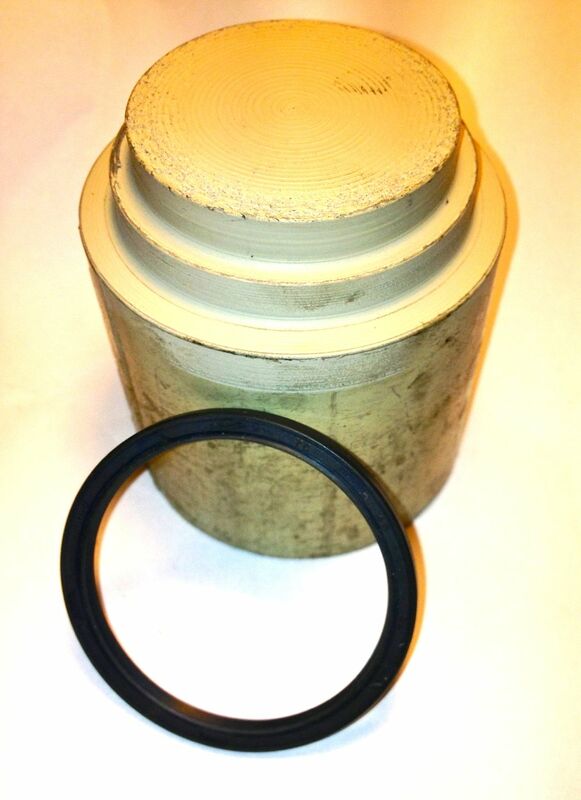 A little mod that improves oil quality, reduces heat build up in the oil, and improves pumping losses to the engine. 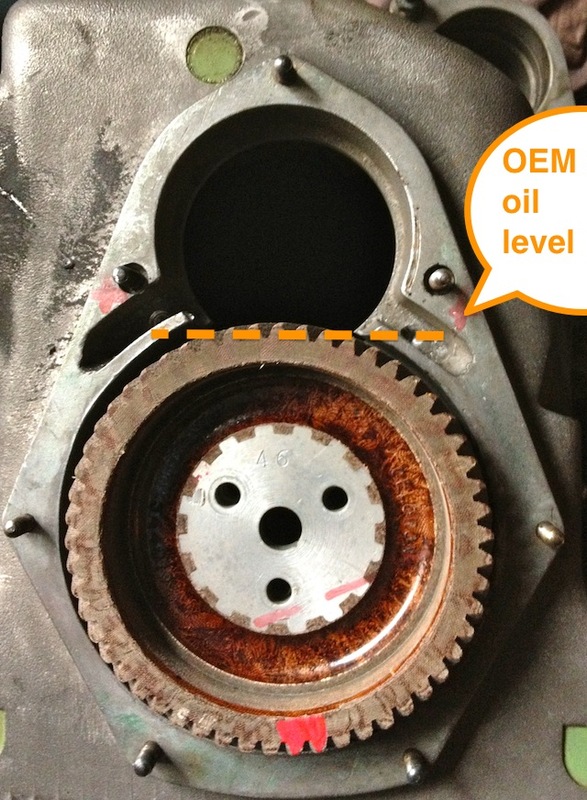 At the moment the Panhard timing case oil level is determined by the hi level drainage points shown here or leaking past the front main bearing. 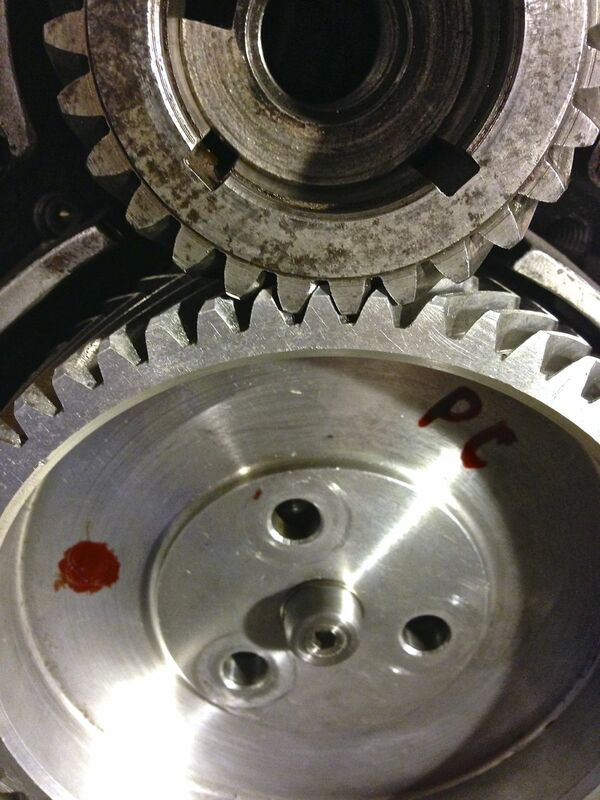 Normal practice for a splash lubricated gear is to have no more than a third of gear diameter immersed, so why Panhard did this surprises me. Originally they had a fibre wheel of massive proportions meshing to a hardened steel gear, and in all fairness it probably didn’t need much lubrication. Brian’s engine has a dural gear fitted, a specialised aluminium alloy version, that available from most Club sources, and it is made in France. These new drillings, now restore the status quo, and at the same time allow for this area to get some oil changes. Technically these wouldn’t get fully drained, unless the steel timing cover case was removed, because there is no low level return point. I think it is realistic to revise this mod and lower the oil level further, but as this is the third engine I have modded, I will wait until I get some better feedback on the wear characteristics before doing so. 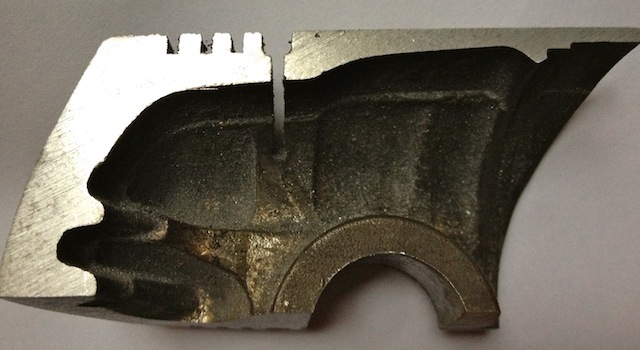 Next up is restore the crankcase oil drilling that originally existed, before Panhard revised it. I need to get a long series drill to do this properly, as the entry angle into the casting, means the drill chuck would catch otherwise. This modified oil pump will now flow more oil at speed, when you want it and there will be less bubbles in the oil as a result, which has the effect of improving the oil quality. 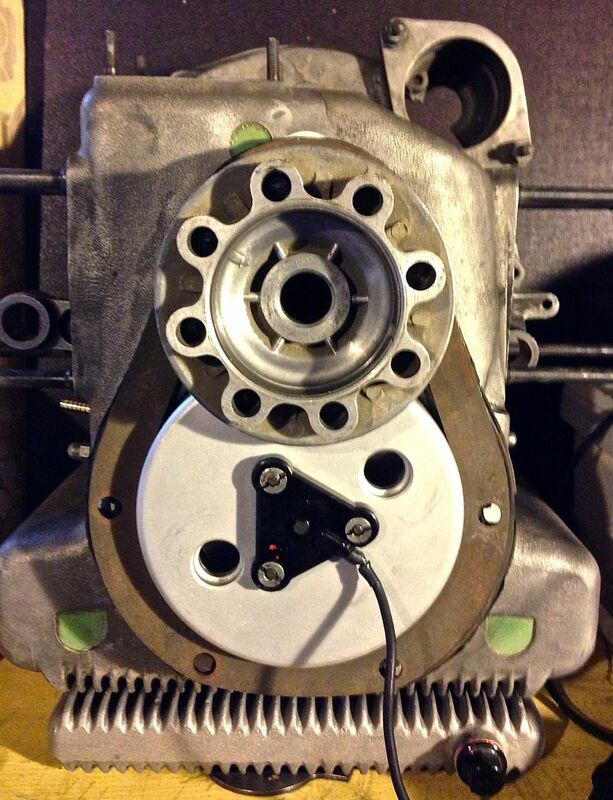 You can see the small inlet pipe into the crankcase, and also see where the oil pump mates up to it, which is the black circle I have inked in and the centre of the outlet is represented by the black lines. So again the flexible shaft is used to reshape this area, and the important thing is to match the mating diameters more closely. It makes sense to machine and open up this drilling to match the oil pump, as this will increase the flow rate into the main oil galleries, and it has no effect on the pressure of the system, contrary to what you might think. The pressure in the unmodified camshaft is controlled by the cross drilling after this, and the cylinder head feeds likewise by the size of their respective openings too. It really doesn’t make sense not to do it. A quick history lesson on Panhard engine failures. 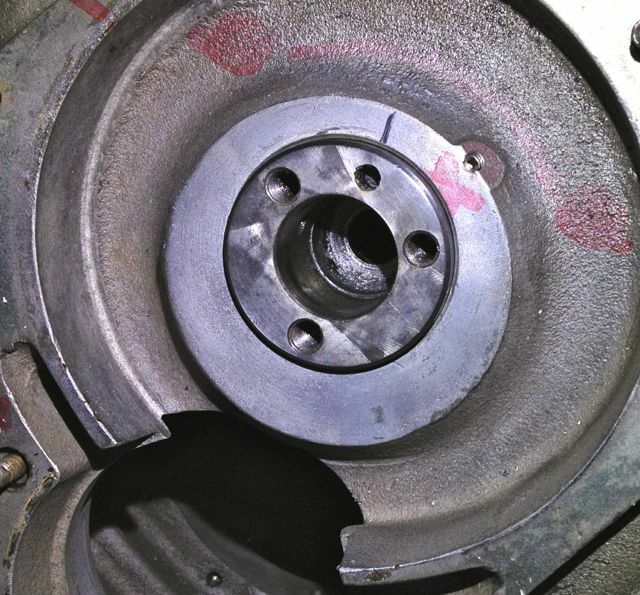 The front main bearing and front cylinder crankshaft big end started to develop failures, as they increased the horsepower. It was attributed to insufficient oil supply, and so the front end lubrication was revised, and the camshaft timing gears were used as a splash lubrication system and the oil drilling that provided that role under the front main bearing was removed. This modification was introduced from around the early 1960’s, and ran to the end of production in 1967. This engine is the later type, so needs modifying back to the original oil supply route, but adding the improvements necessary to negate the other faults. The first area to tackle is the front end crankshaft oil supply, so plugging the newer oil drillings and creating a matched new one under the front main bearing housing. 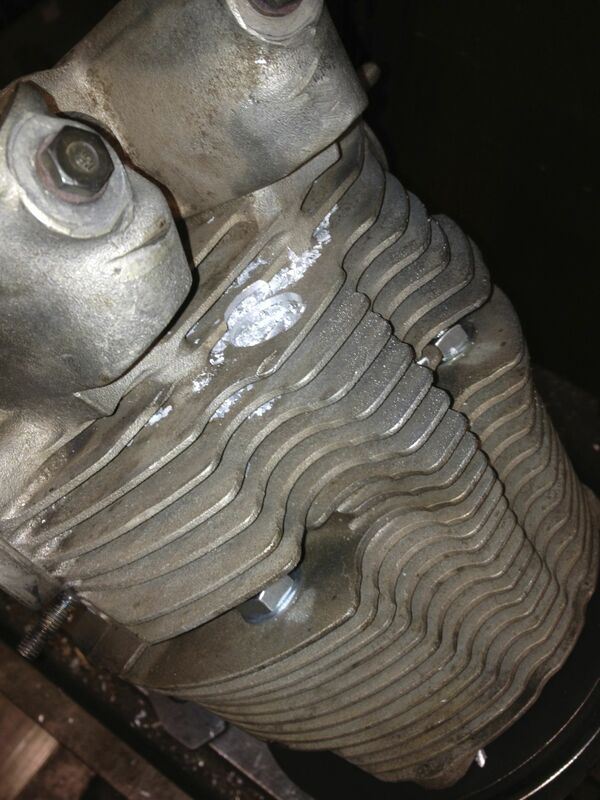 These will be fixed with Loctite once all the drilling has finished and the crankcase has been thoroughly cleaned. 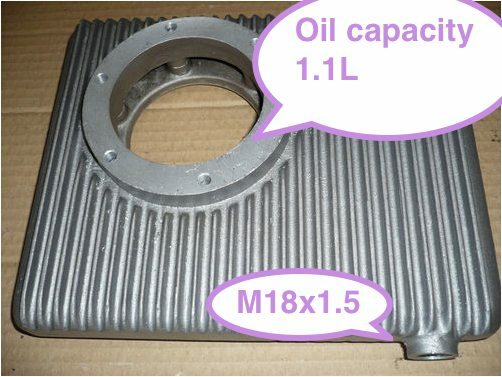 Plugging the timing gear lubrication drilling, helps to restore the equal phasing of the front rear crankshaft oil supply, but fitting a new design of oil light piston will guarantee this. Then the oil distribution in these areas will be directly related to the oil pump performance, which is still affected by the priority needs of the cylinder head & valve gear oil supply, but at least the OEM imbalance is negated. 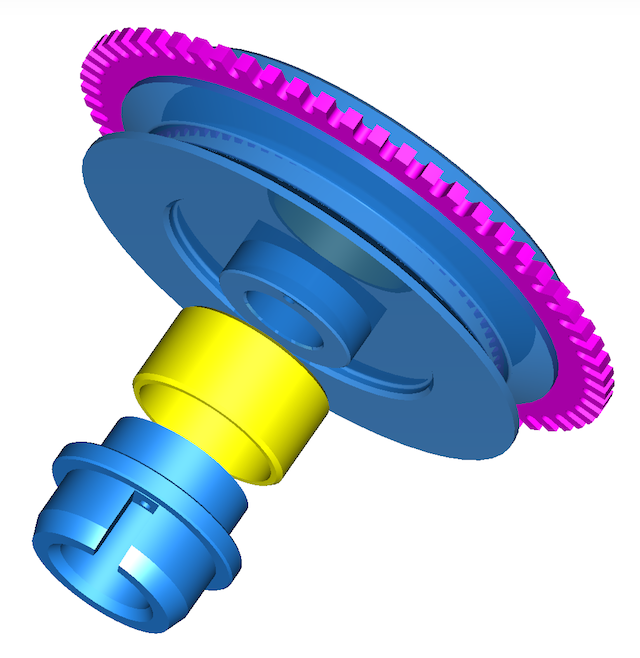 Later I will reduce the oil level & flow in the timing gear casing, so reduce pumping losses, and oil degradation. 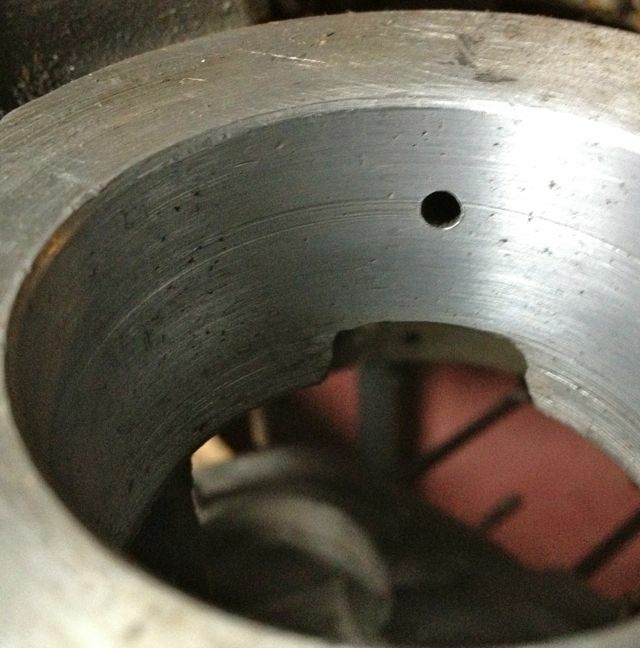 On examination the deposits in the slingers at the front part of the crankshaft were almost double those at the rear, which is mainly due to the oil supply being much greater to the front and also the timing gear casing is a stale oil residue trap. 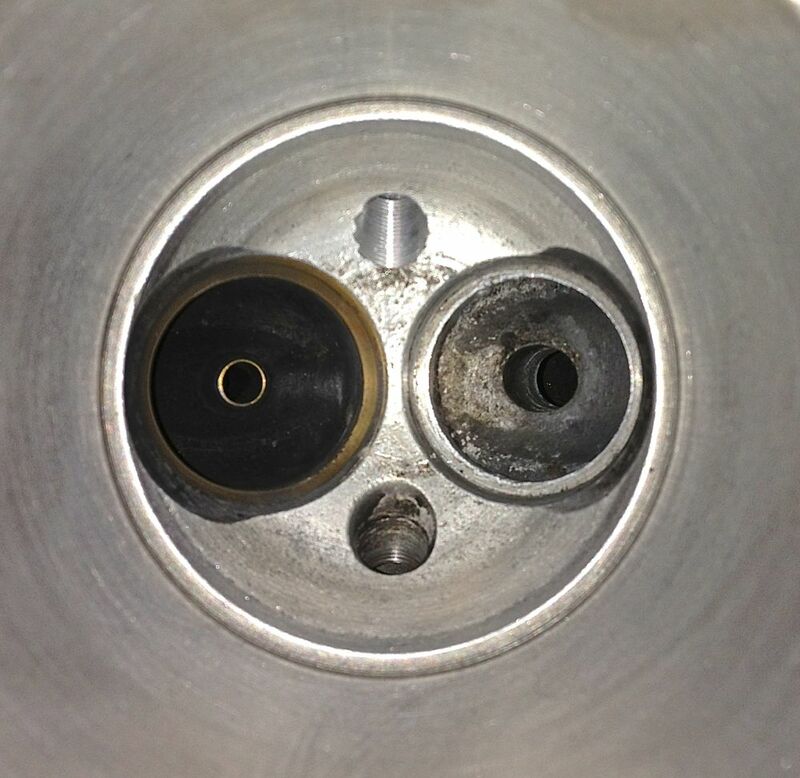 Once contaminated here, the particulates have no option but return via the main bearing aperture, and then be centrifuged in the front slinger and as there is no drain out of this area, the oil is never fully refreshed. 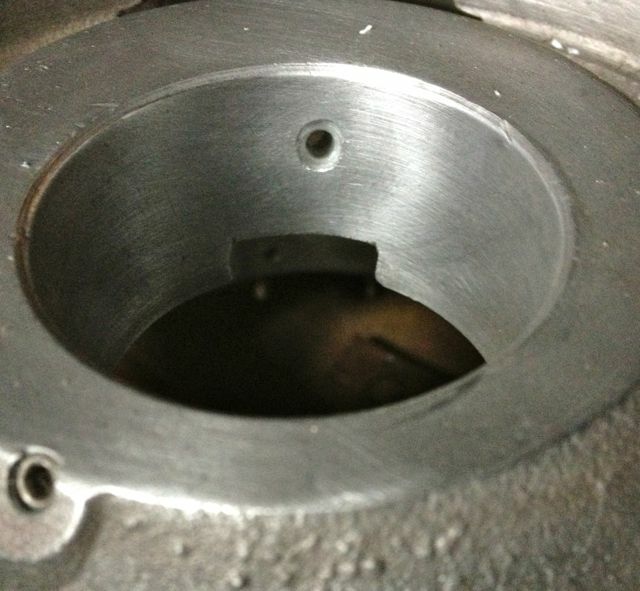 This is the cleaned crankcase marked up and ready for the knife or Foredom. 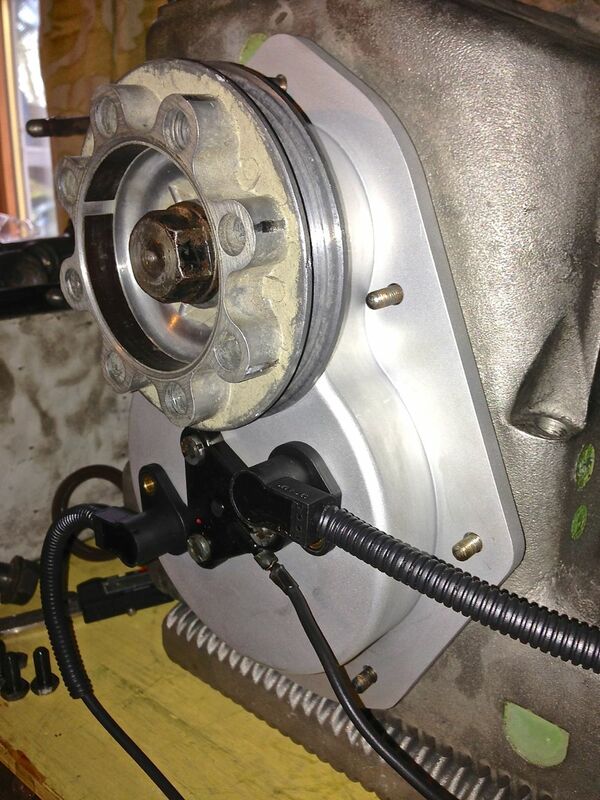 I have to modify the later style crankcase to adjust the oil circulation. This will mean creating a new big end feed under the front main bearing, plugging some of the existing galleries, and making new drain holes for the front timing gear. This will reduce pumping losses, lower oil temperatures and improve oil quality. After this I will be refining the existing oil galleries to reduce back pressure and cavitation, so increasing the nett flow rate of the existing oil pump. Contrary to what others are saying or you might have heard elsewhere, this oil pump is more than capable of feeding the demands of the Panhard engine, and these mods to the front end boost pressure to the plain bearing surfaces, especially when combined with my camshaft oil light piston, so it’s a win win situation, but if I was going to spend money on something extra to improve things further, I would boost the oil capacity by increasing the sump volume. Please note no Panhard oil pumps are destroyed making this modification. I had to remove the oil filter kit on this engine, so I could heat the crankcase up to remove the front main bearing, and begin the oil gallery modification. 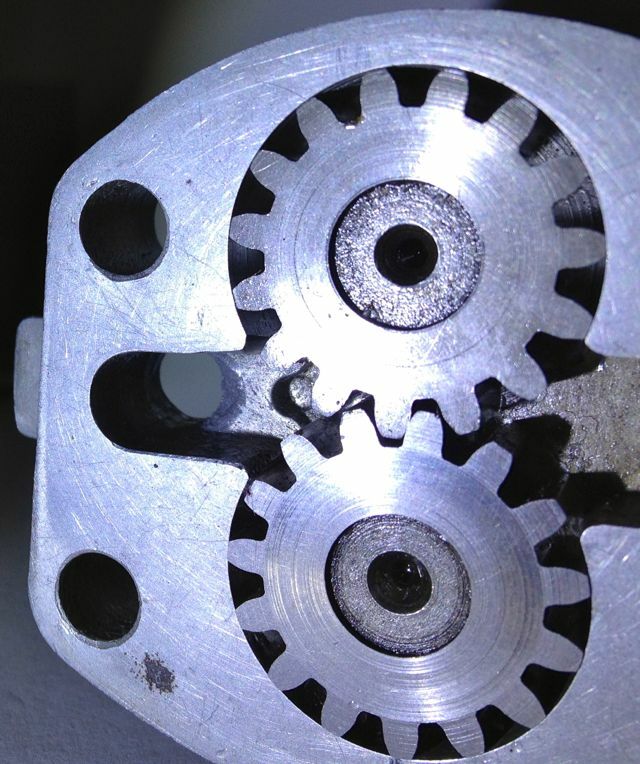 On stripping the oil pump out, I was surprised to see a slightly lopsided wear pattern to the cam driven oil pump rotor, but this suggests there is a slight bit of play in the oil pump shaft, as it’s a reaction against the thrust forces produced by the gears meshing at the camshaft drive. One big positive is how fine the scratching is to the baseplate surface, where the steel gears rub against the aluminium. That is a good sign the filtration is working, as I’d normally expect to see heavier scoring, if an original mesh strainer was fitted. 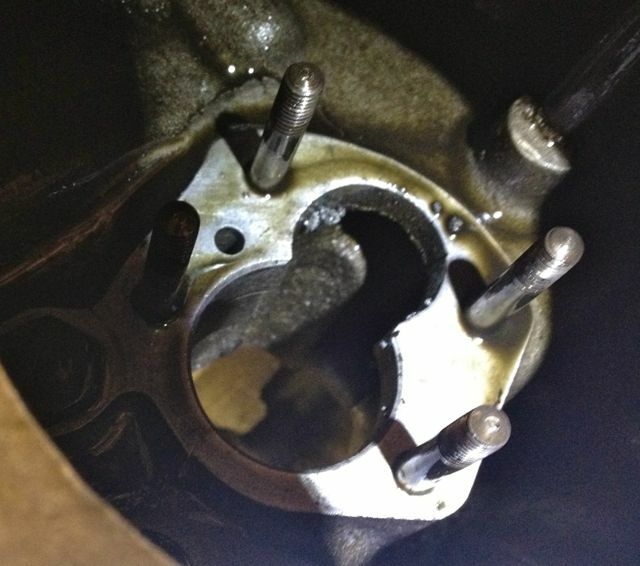 The engine is up North ready to go under the knife, but prior to this when it was stripped down, it had a broken piston ring, extensive blowback on the other cylinder bore a piston crown running hot, and a connecting rod hitting the crank web. 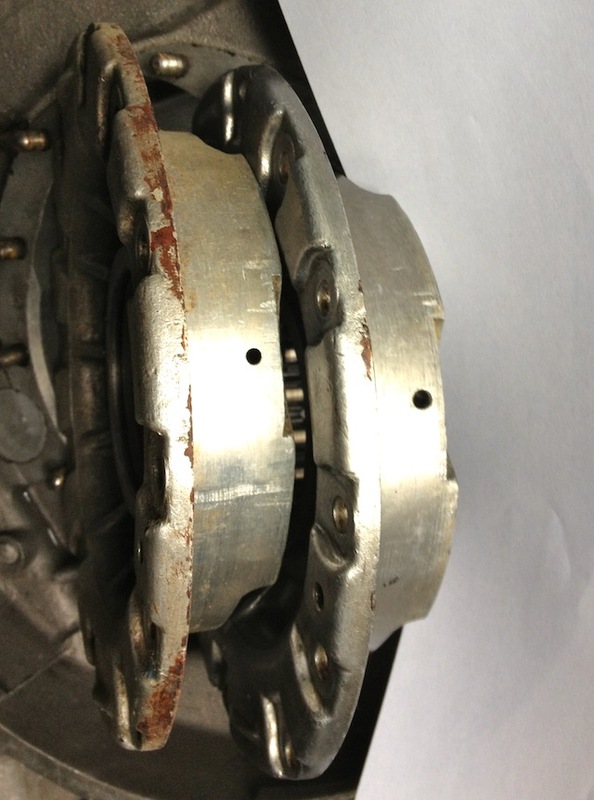 The rear crankshaft web had been pulled apart slightly, and it looked like some metal component had caused this, because there was impact damage to the middle web between the web and rod. 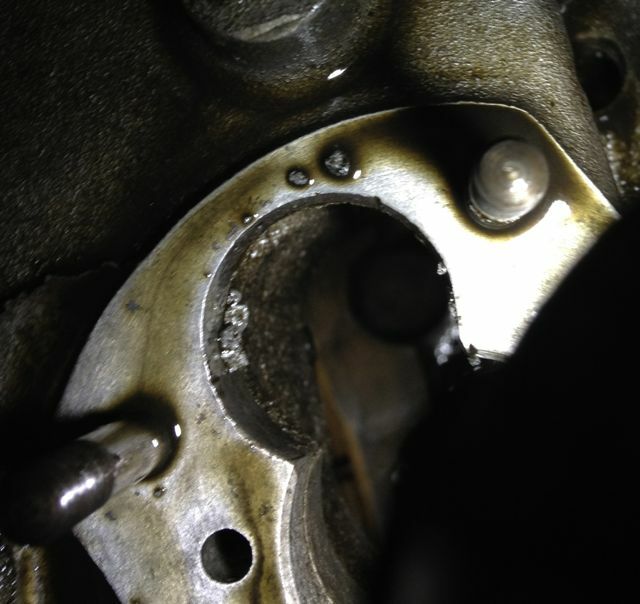 The ring that was broken was still in the piston groove, and the bits sort of added up when placed together. On inspecting the crankcase today, as I was removing the oil pump, but prior to removing the front bearing I saw these metallic components within. I’ll need to check the pistons and cylinders more closely and try and ascertain what this stuff is! 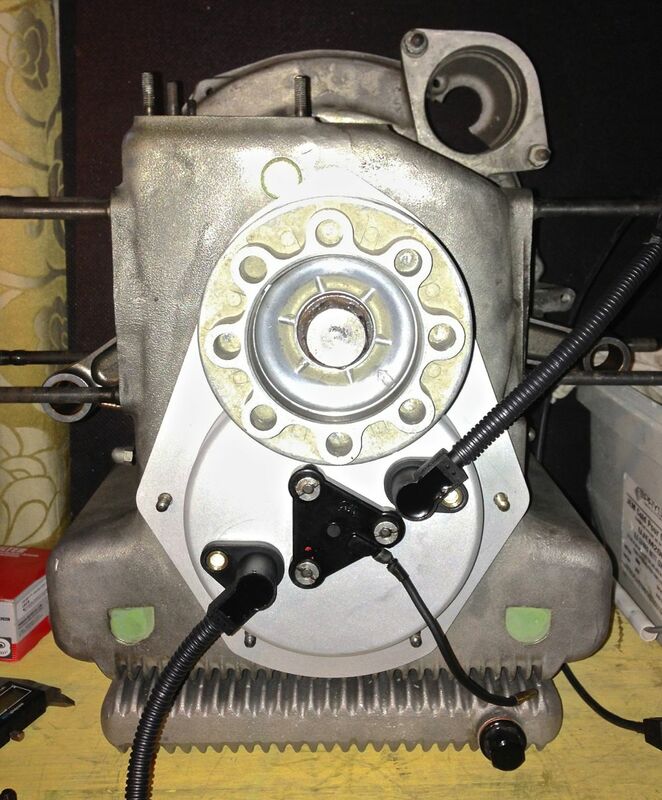 I have made several distributor based electronic ignition prototypes over the years, and although cost effective, they all have a lack of precision, because they run through the existing drive mechanisms, which are a slotted drive on the end of a geared oil pump, which is powered by another gear on the gear driven camshaft. Ultimately I need to fit a crankshaft timing trigger to this engine, as part of the ongoing ignition & fuelling developments, and the traditional locations for these are the flywheel or front pulley. 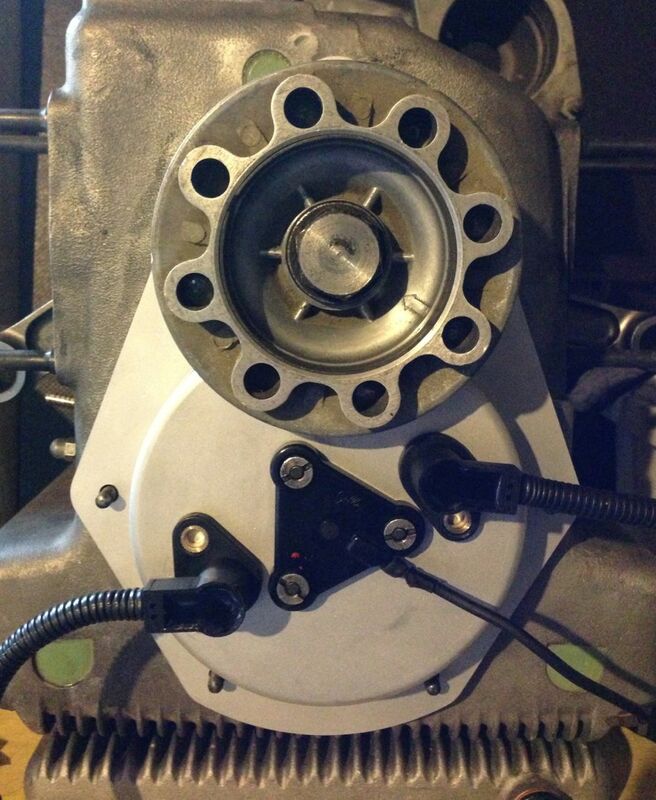 If I want to gear this up for retrospective and easy fitment, the flywheel really is out of the question, because this is an engine out exercise in a Panhard, and that is a no brainer. 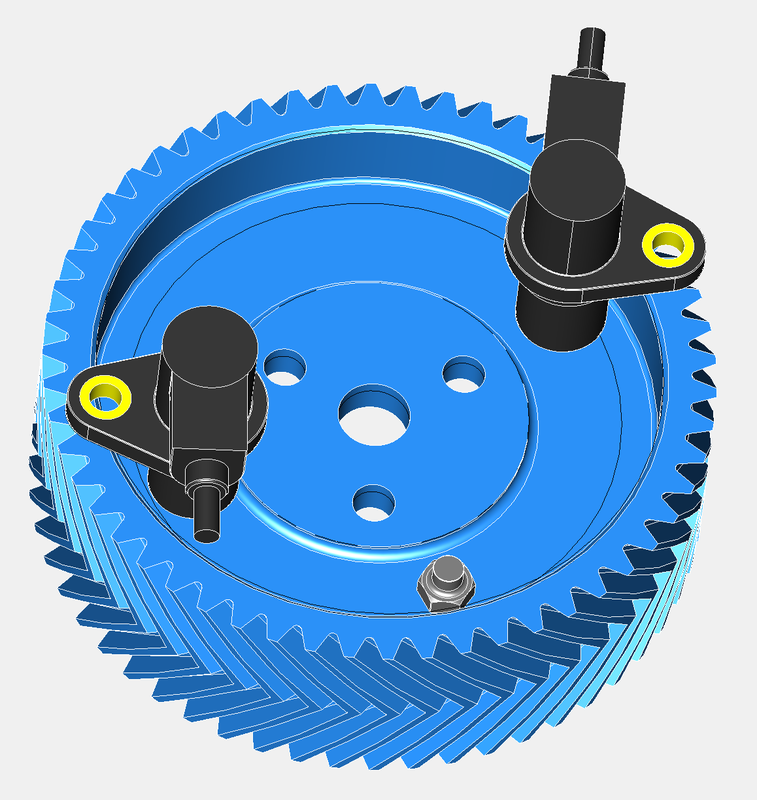 That now means the front pulley arrangement has the most potential, and that is what the majority of modern car manufacturers use anyway. Although it is possible to add a trigger wheel to the existing pulley, like I have done in my bench testing to date, there is a slight variance in sizes that negates this. It’s my philosophy to always make new parts wherever possible, so that old ones don’t get destroyed unnecessarily. 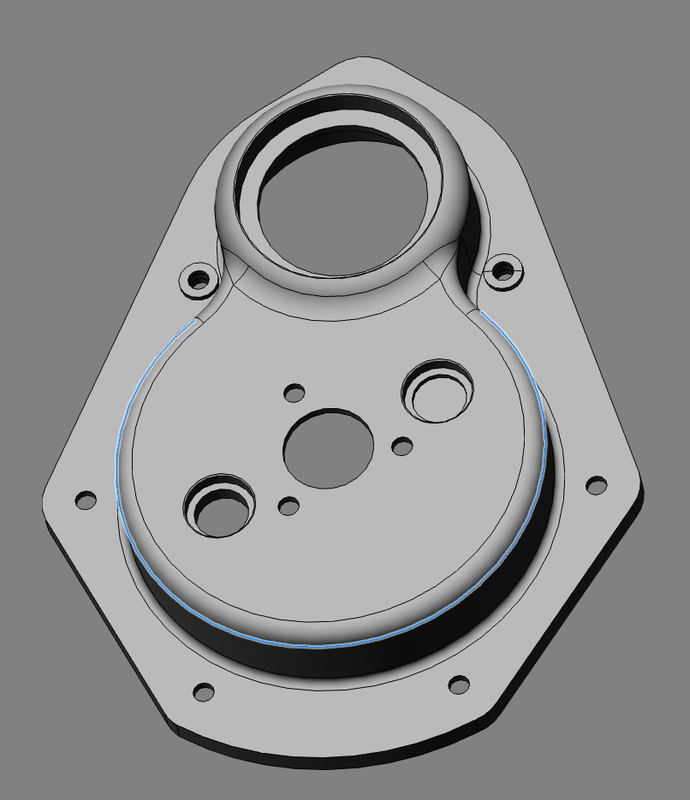 At the same time there might be other design changes or benefits you can bring to this area, so for example I can incorporate a modern oil seal, assuming you tweak the timing gear casing, and also make the pulley rebuildable. 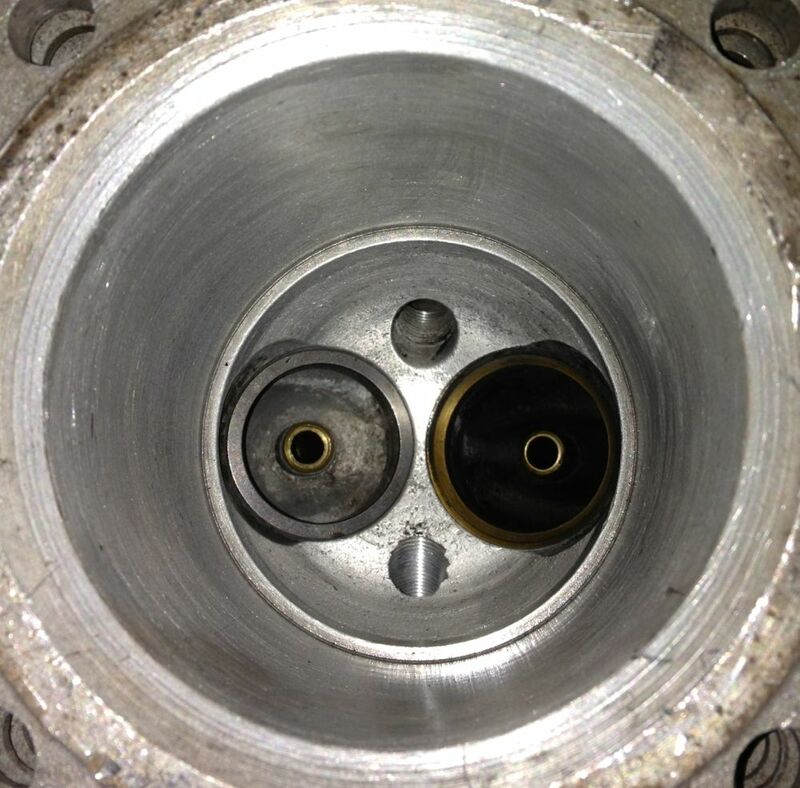 If this is not to your liking, and you want to keep the OEM piston ring seal the design can be modified to accommodate this too, by replacing the yellow part for another. 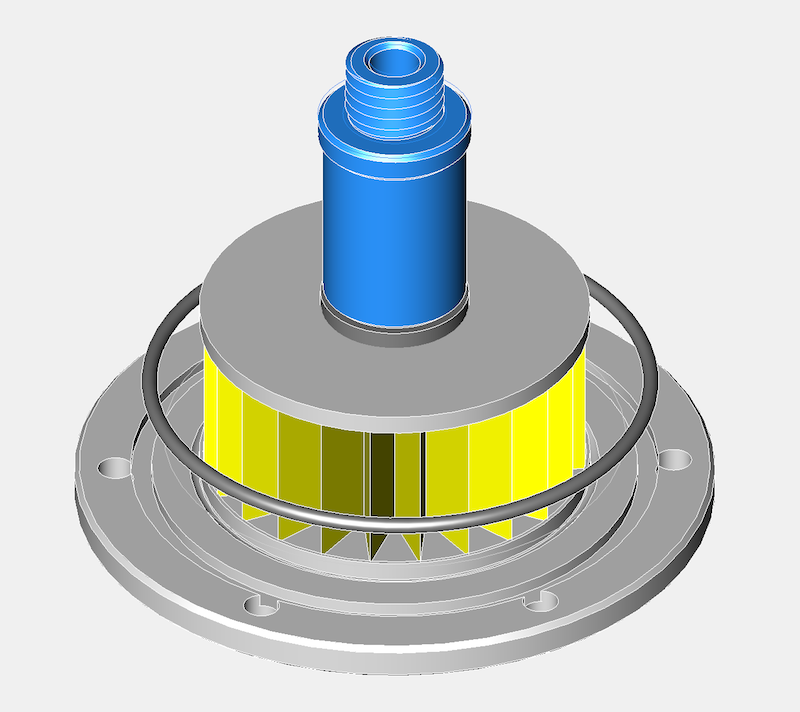 Latest CAD thoughts are pictured below, and the pulley now has a renewable inner ring shown in yellow, which acts as a running surface for the double lipped oil seal. The aluminium parts in blue now have a location dowel for timing purposes. The trigger wheel shown in purple is also a standard 60-2 pattern, which gives improved triggering over the lesser toothed versions I was experimenting with. 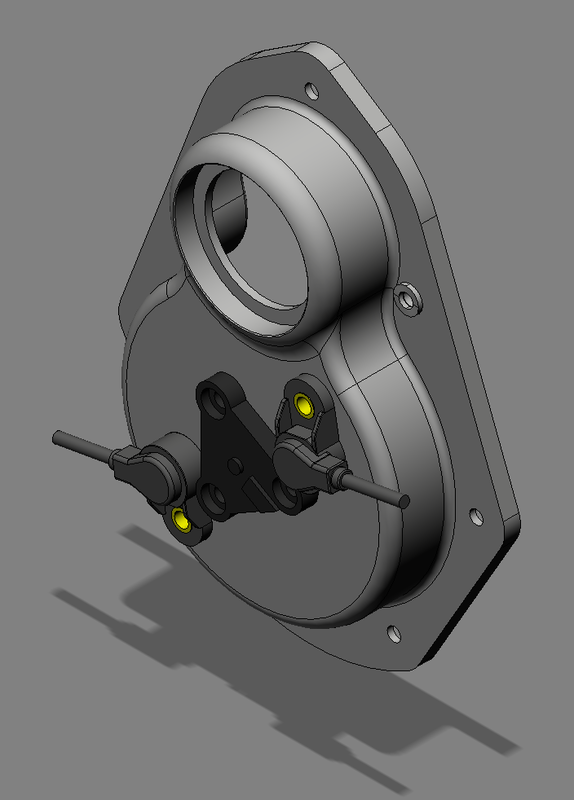 Next up, look at the VR sensor support bracket, chase up the pistons, and hopefully acquire a boring machine. 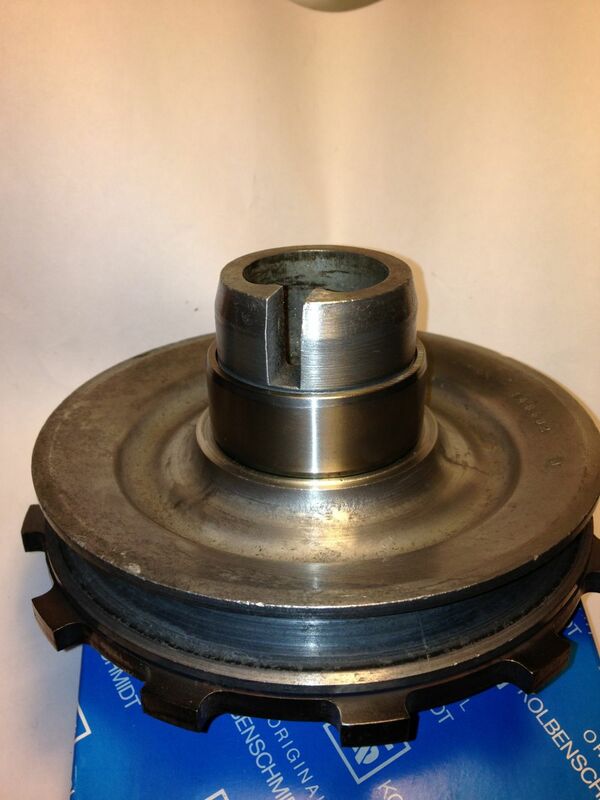 Here are the before and after pics for the flywheel. Obviously it can go lighter, but it’s about 5.9kg from around 8kgs originally. This is a good 25% lighter, and the inertia reduction will be even higher. I never thought I’d be doing another one of these again, but a good friend was in a spot of bother with his Panhard engine, so I decided to have a look at it. After stripping the engine down, there were quite a few issues, and the source of the shuffling noise was discovered, but it won’t come back! I will edit this blog when I have time to post the observations and collate some pictures. The engine had been fitted with one of my oil filter conversion kits after its last rebuild, and at the same time it had an aluminium camshaft gear fitted. 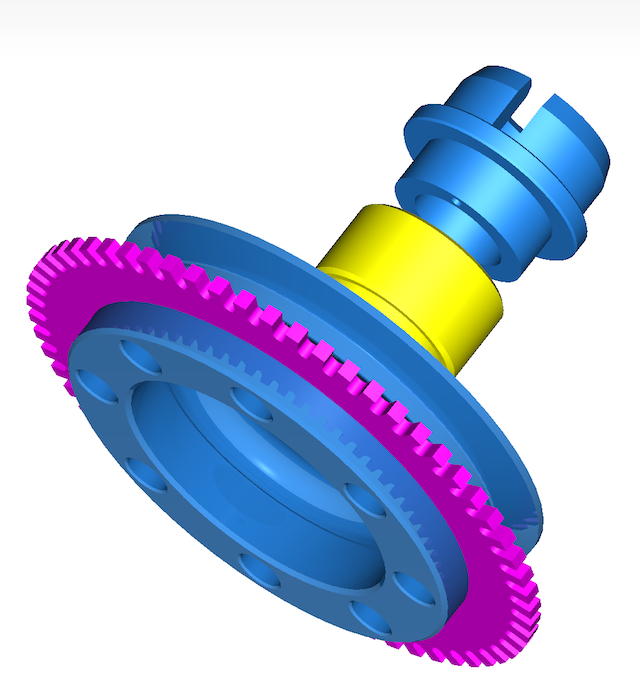 Revise crankcase oil circuits, as it is the later crankcase design, which relies on the camshaft gear to splash lubricate the front main bearing and big end. Some of these will be a continuing test bed for past improvements, but the new ones are the pistons and cylinder reboring, the new oil seal detail to the front timing cover, and the new front pulley to take the trigger wheel.